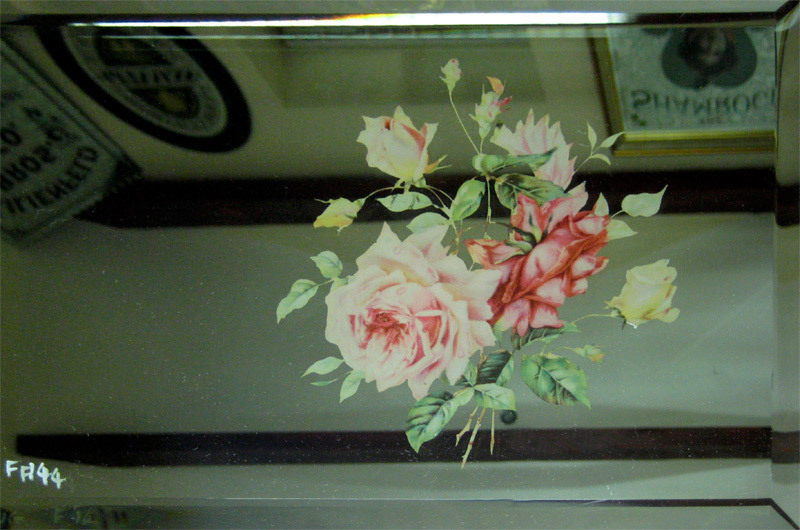 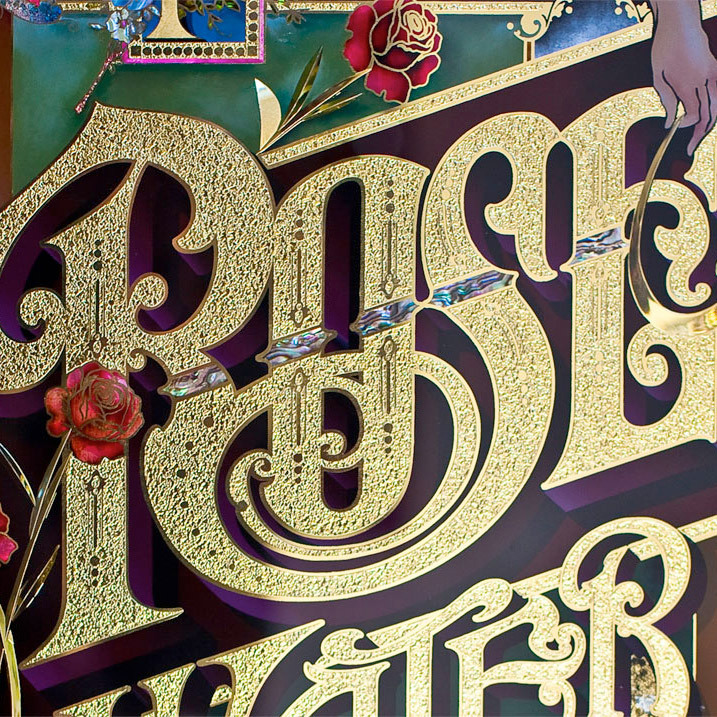 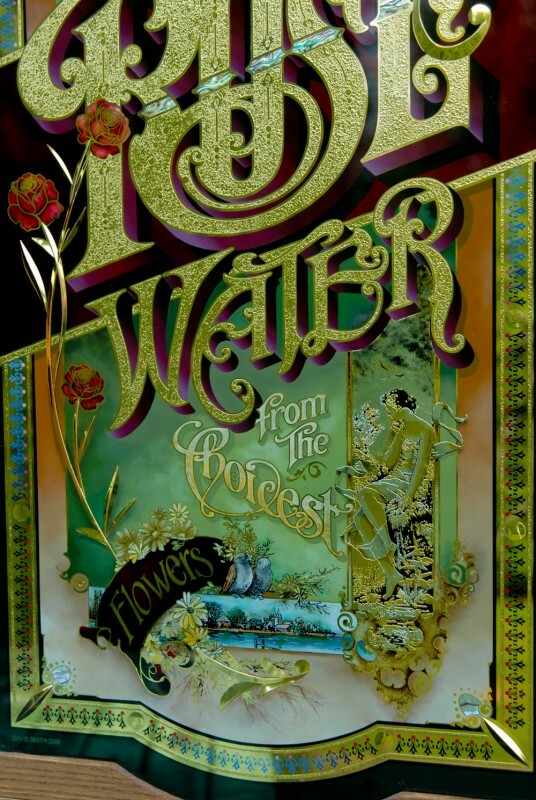 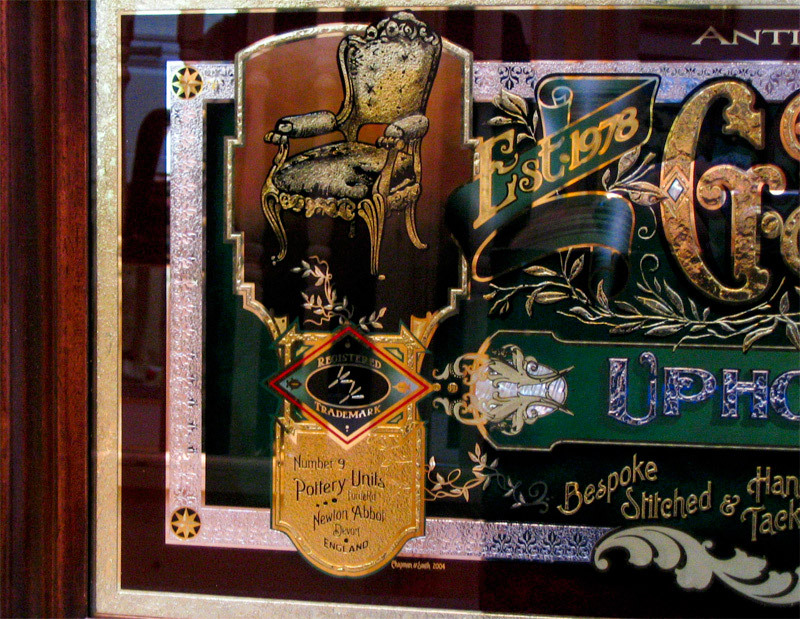 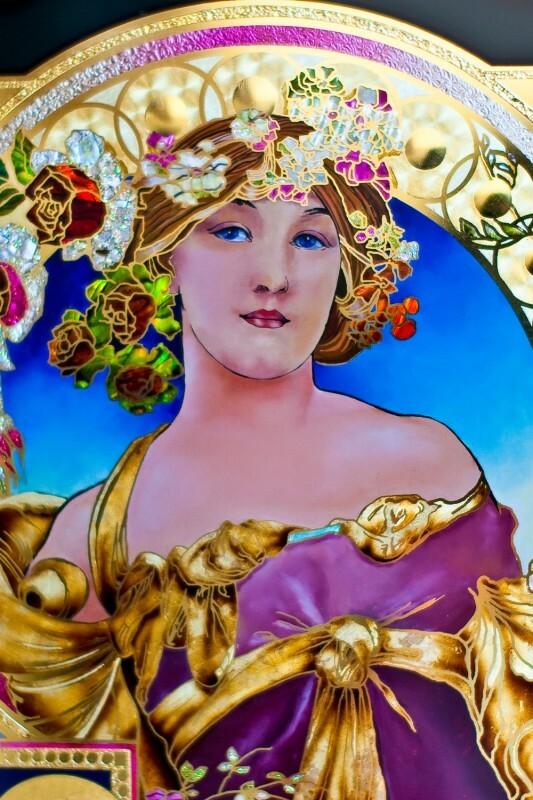 This panel was designed for the 1997 front cover of Letterhead's magazine, USA It is an acid-etched glass piece, 3ft x 30"s which employs acid etching, glazes of transparent paint and gilding, finger blending was also used, the rose is watergilded over an acid stipple and then cross hatched and finally painted behind with black japan..
We all learn by our mistakes! 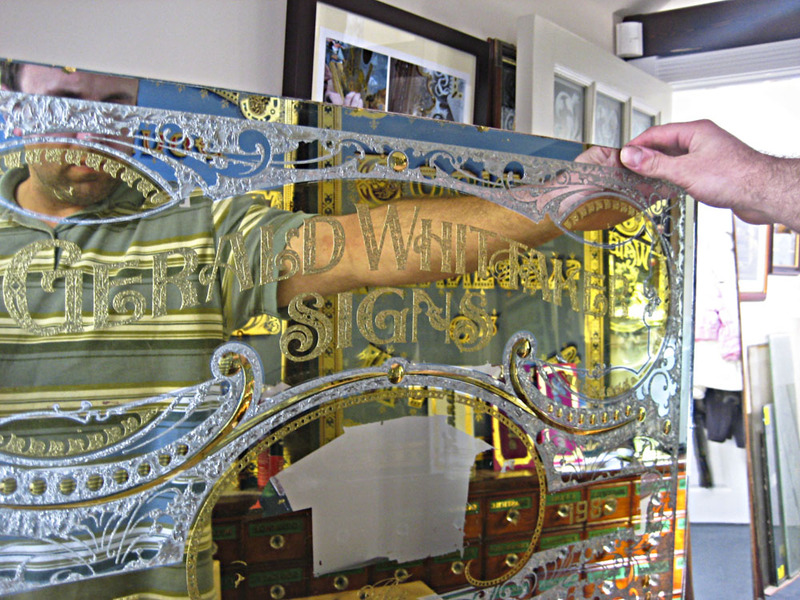 The glass signs in this section were projects for Letterhead gatherings that I have attended here in the UK. 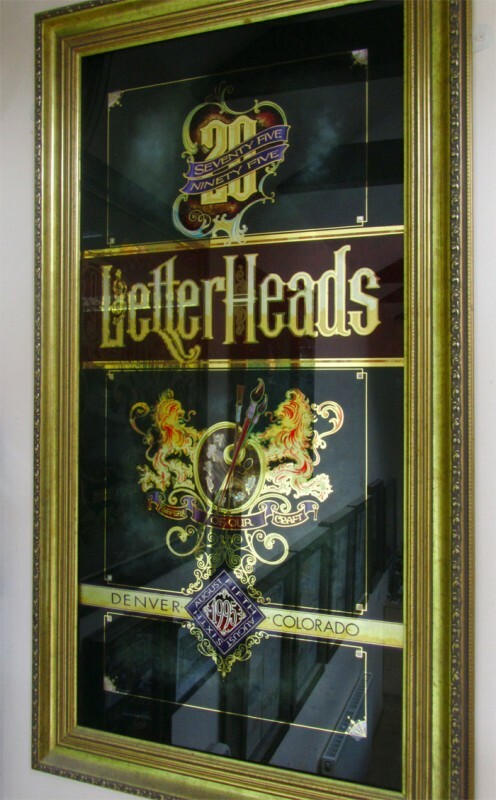 In 1995 I was lucky enough to be able to attend the Letterheads 20 Big Ones meet in Denver, Colorado USA, hosted by Mark and Rose Oatis. 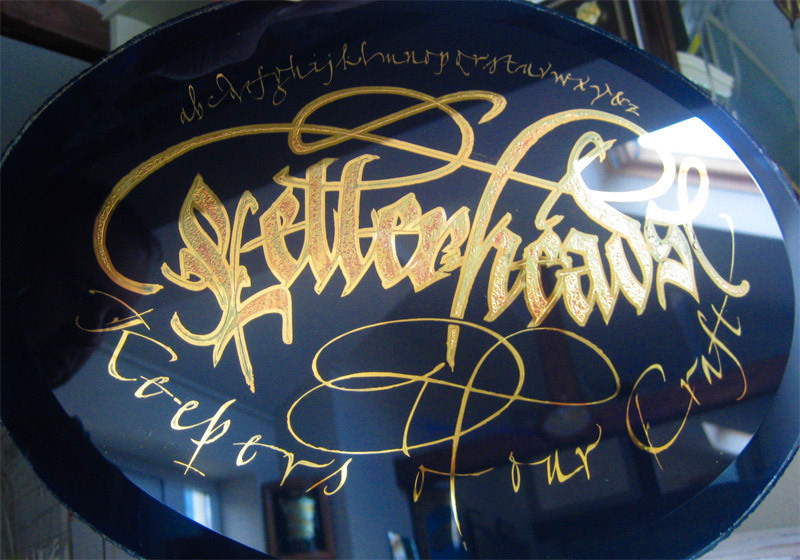 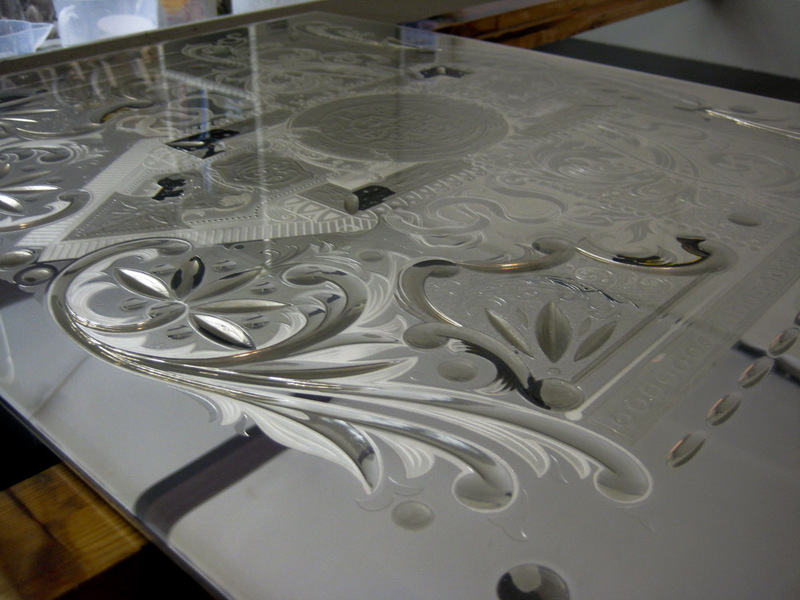 This gave me the chance to meet Noel Weber, a top glass artist and signmaker from Boise, Idaho. 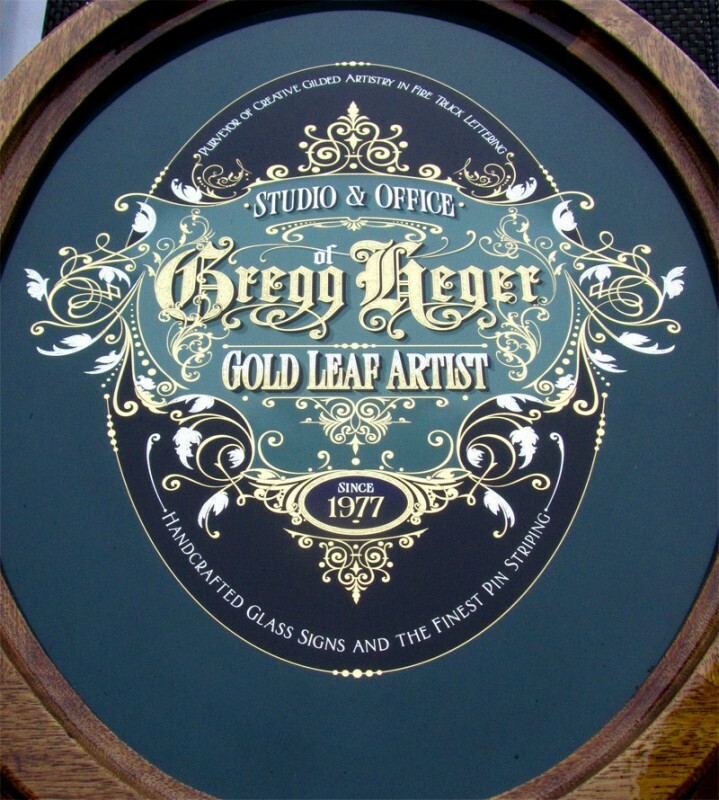 Noel and his family became good friends of mine and along with many talented signwriters in the states, he really helped me see what was possible in this art form and so at the meet in Denver, I enrolled in Noel's glass workshop for 4 days of gilding and painting. 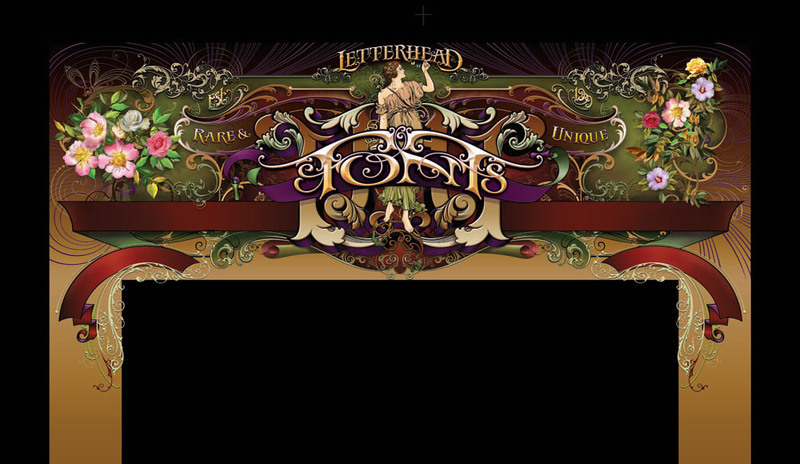 Please read this short story about how the Letterhead movement started. 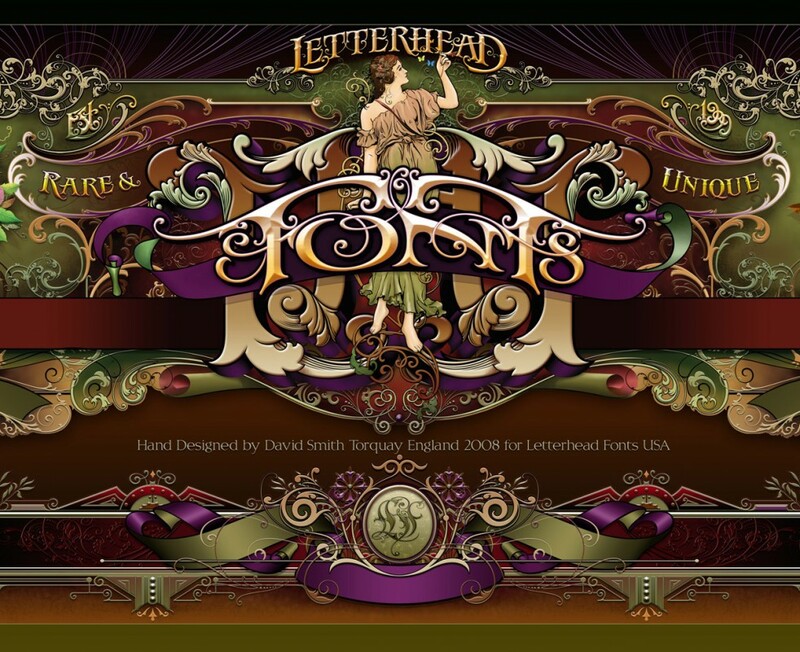 The Letterheads History...and some more good information! Roughly 25 years ago, a magical moment in sign history, a group of extremely talented Denver craftsmen found each other and began having loosely structured meetings-get togethers more like it. 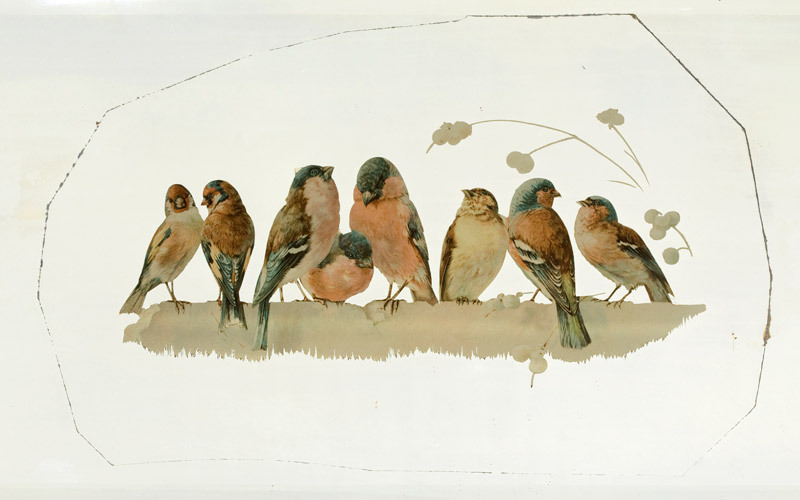 They may have gathered just to have a good time and swap stories but eventually began intensive information and technique swapping. 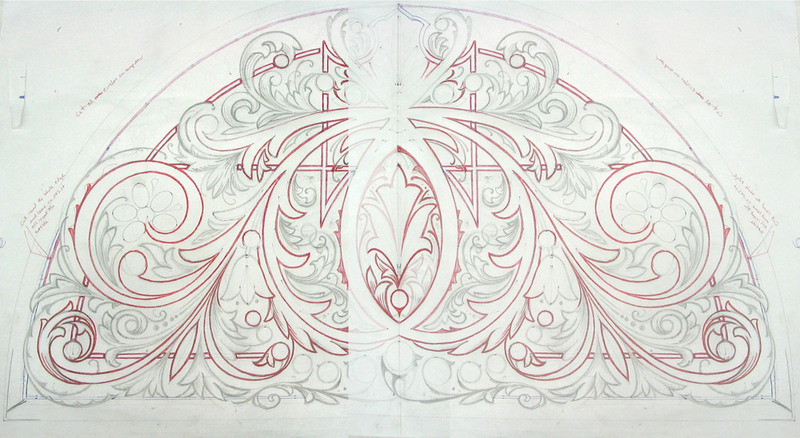 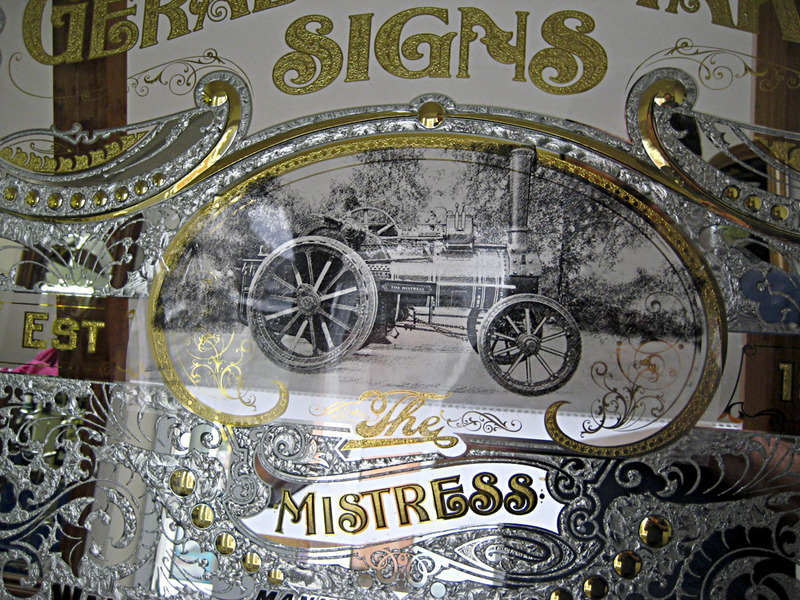 The old sign painting books such as Strong's Book of Designs became a cornerstone of their learning. 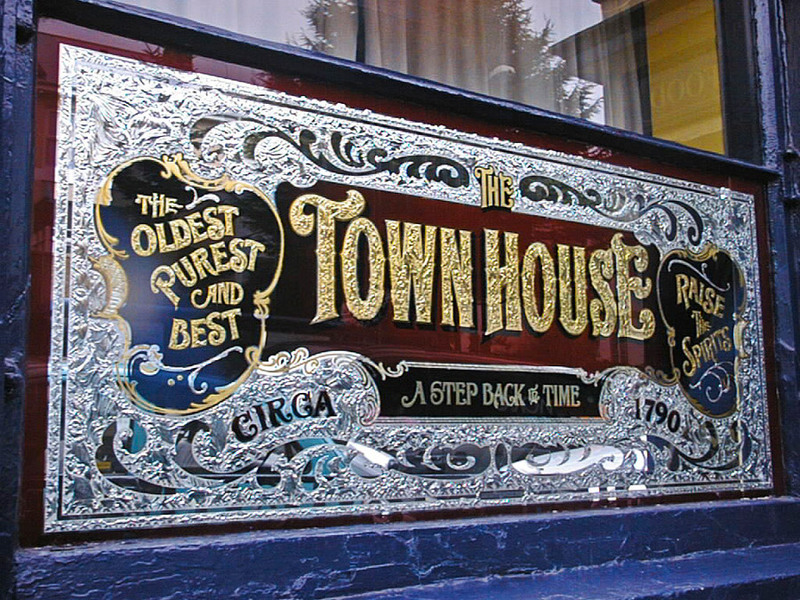 As their talents and craftsmanship sharpened, they began entering the Signs of the Times annual design competition and generally swept every category. 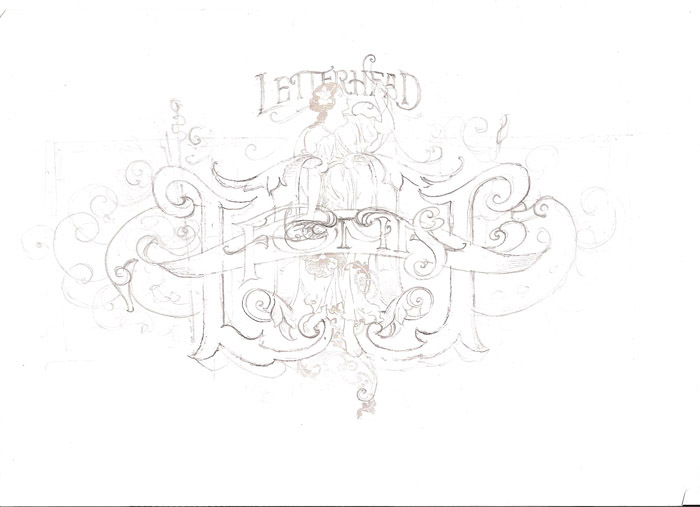 At the bottom of every entry, they wrote "member Letterheads". 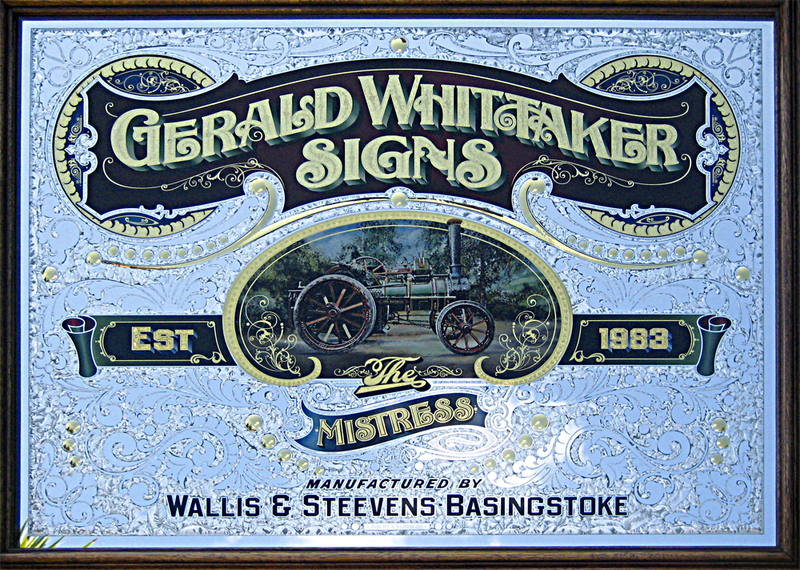 After the Letterheads were featured in a later Signs of the Times magazine, the rest of the sign industry learned of the Letterheads, with much envy. 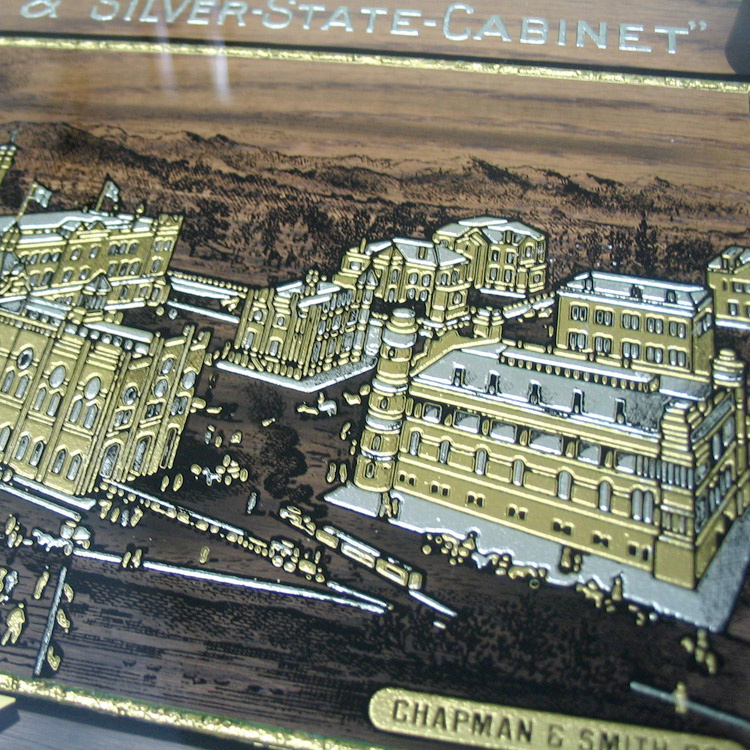 In 1982, Noel Weber hosted the "Boise Bar-B-Q" in which he invited additional craftspeople from around the country. 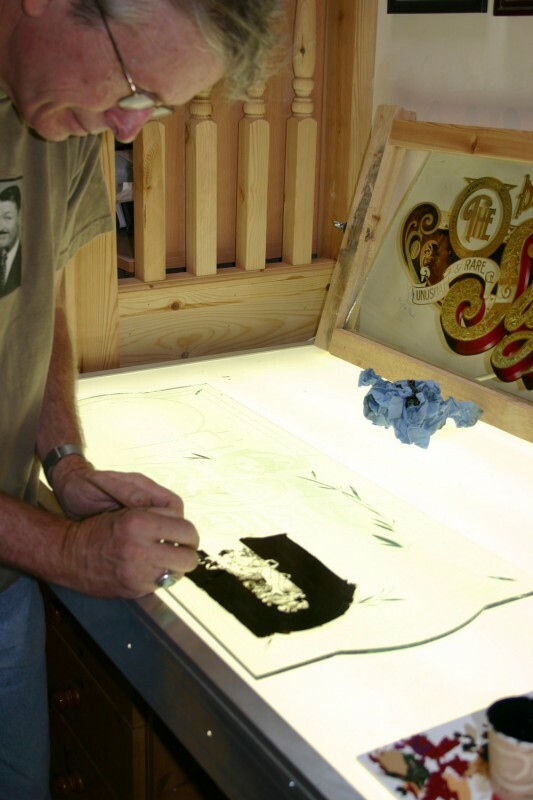 In October of the same year, Mike Jackson hosted the "Oklahoma Bash" in Moore, Oklahoma and roughly 135 sign makers showed up for an intensive weekend. 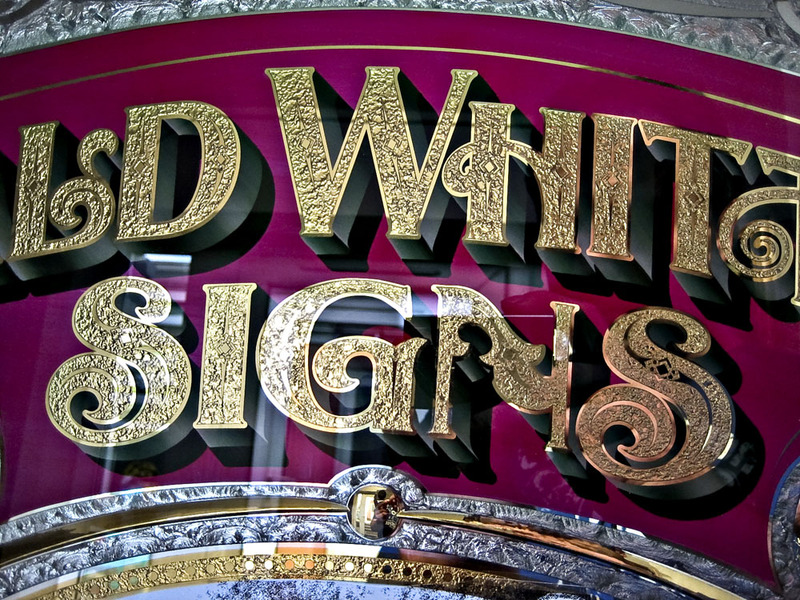 Both Signs of the Times and SignCraft magazines sent their editors. 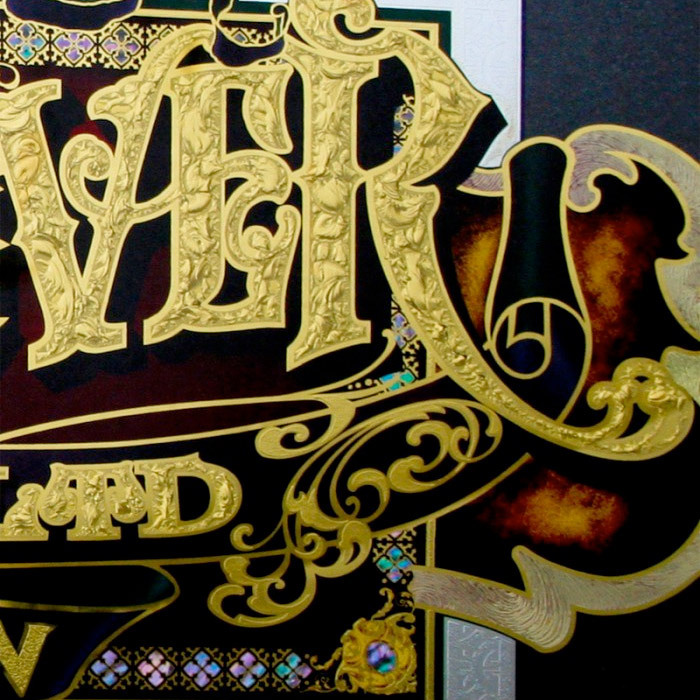 As the next issues hit the streets, their articles and photos enlightened the entire industry. 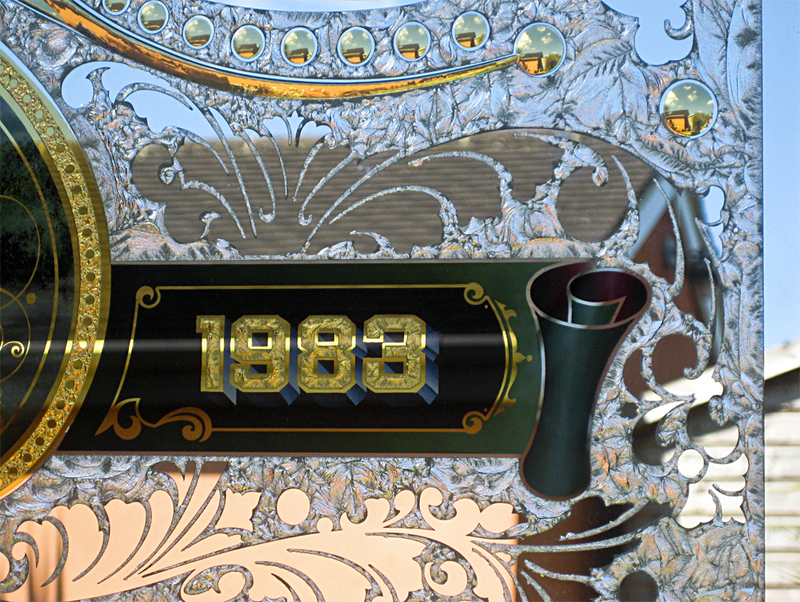 The movement was in full force with large meetings in Kansas City in 1983 and Memphis the following year. 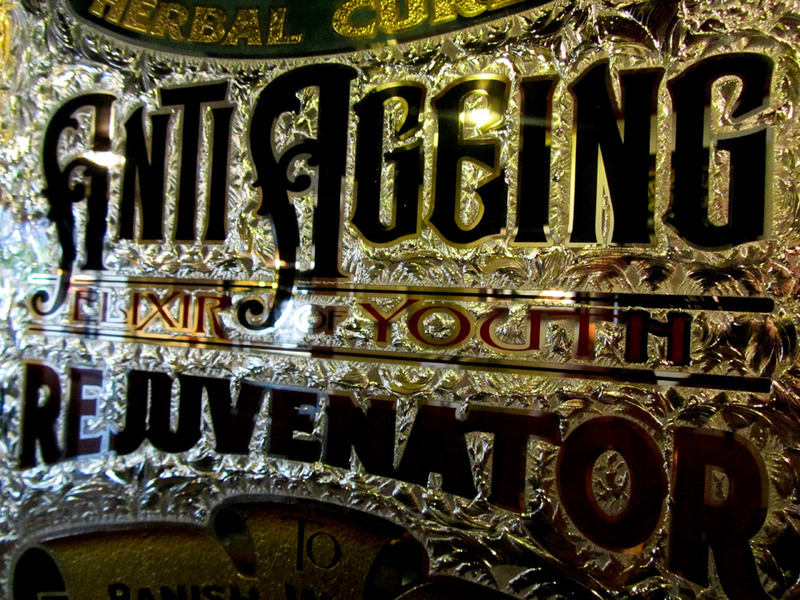 The rest of the growth is history. 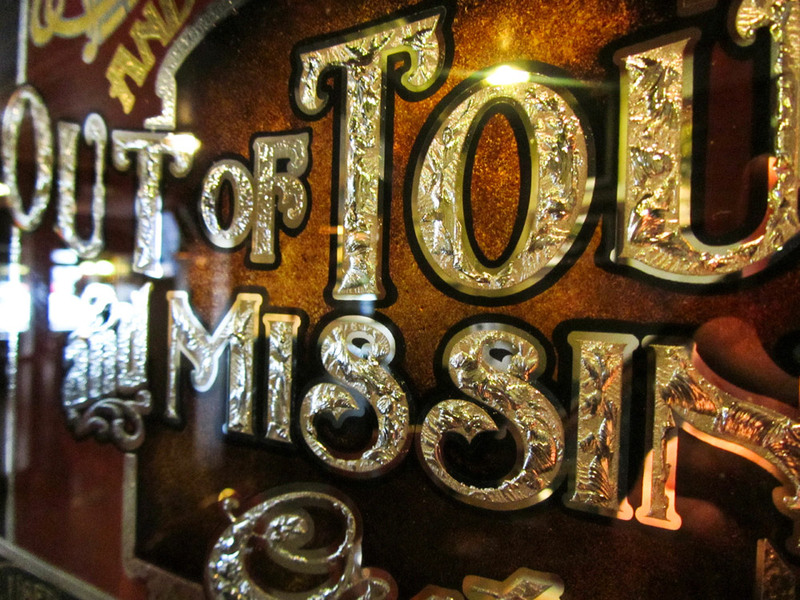 Literally hundreds of meetings have just "happened". 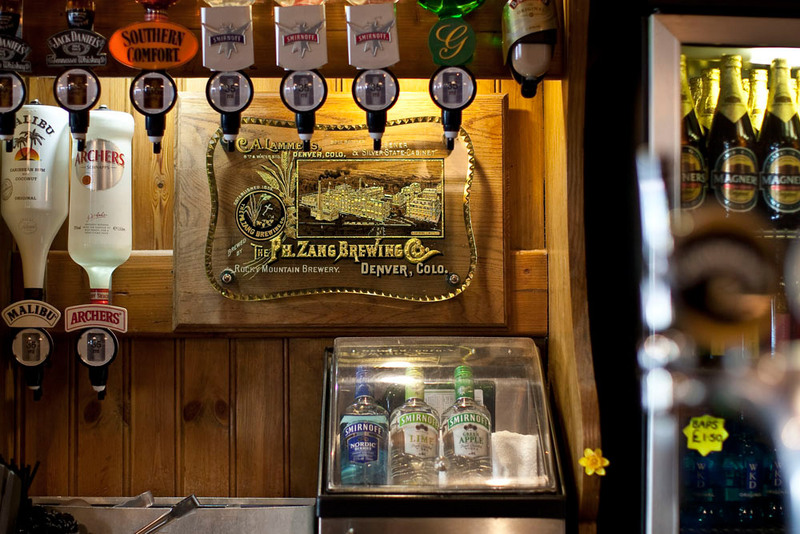 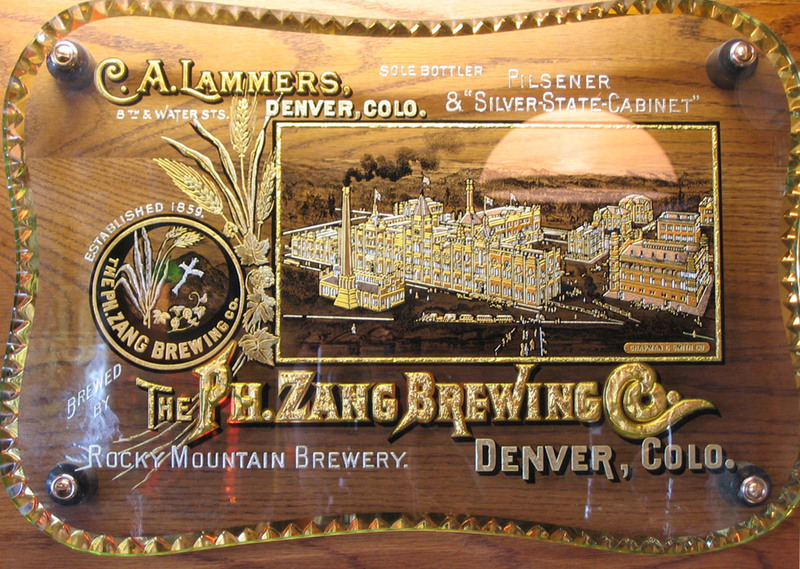 The Denver group hosted the 10Th and most recently 20th anniversary meetings. 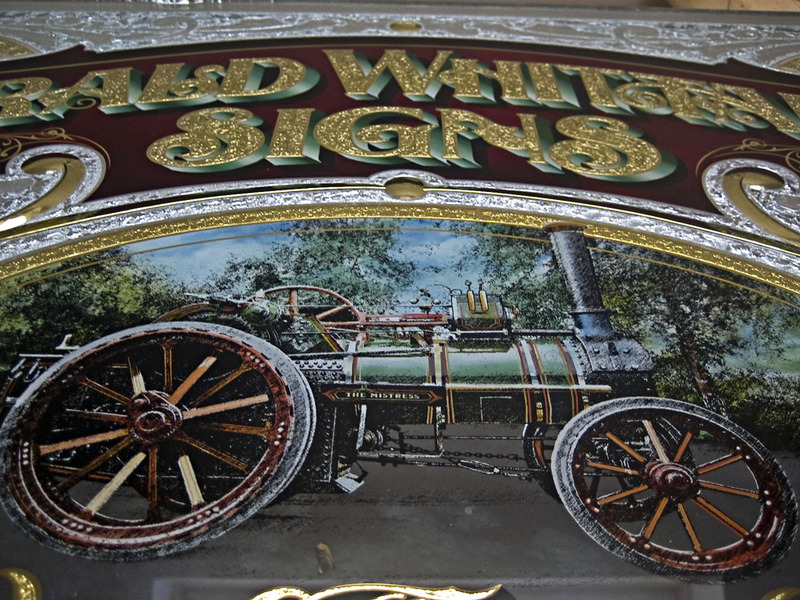 While there is usually one National meeting a year, there are often four or five regional or area meetings a month scattered all over the country. 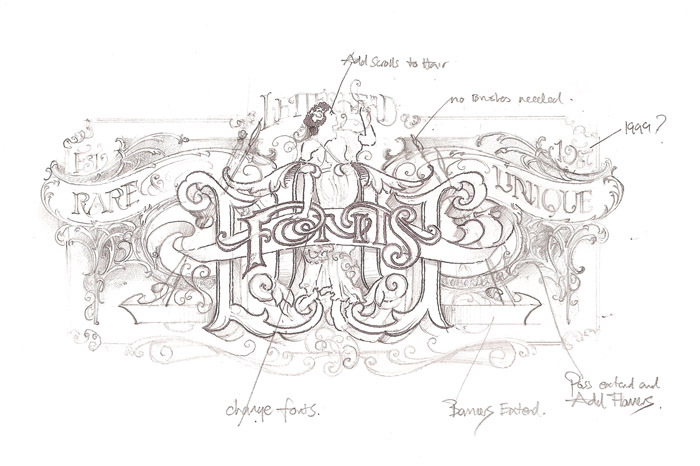 Amazingly, the Letterheads thrive, grow, and evolve without a true governing body. 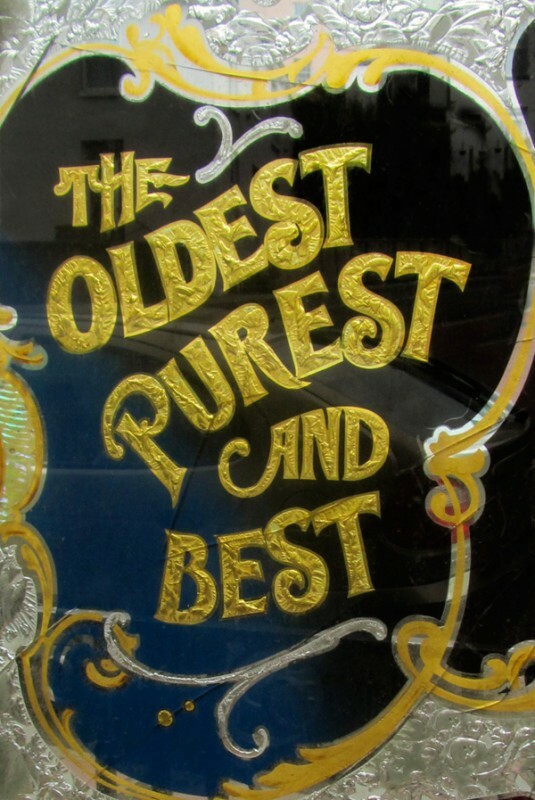 That's right-no president, treasurer, or even board of directors. 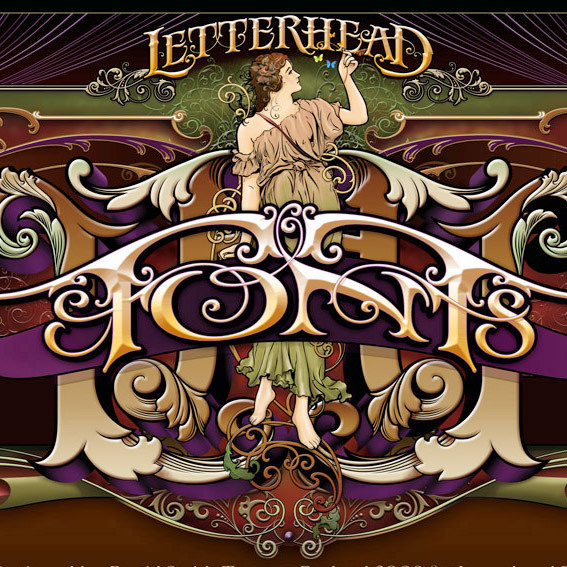 The basic rule of thumb has been "if you want or have a Letterheads meeting-have one". 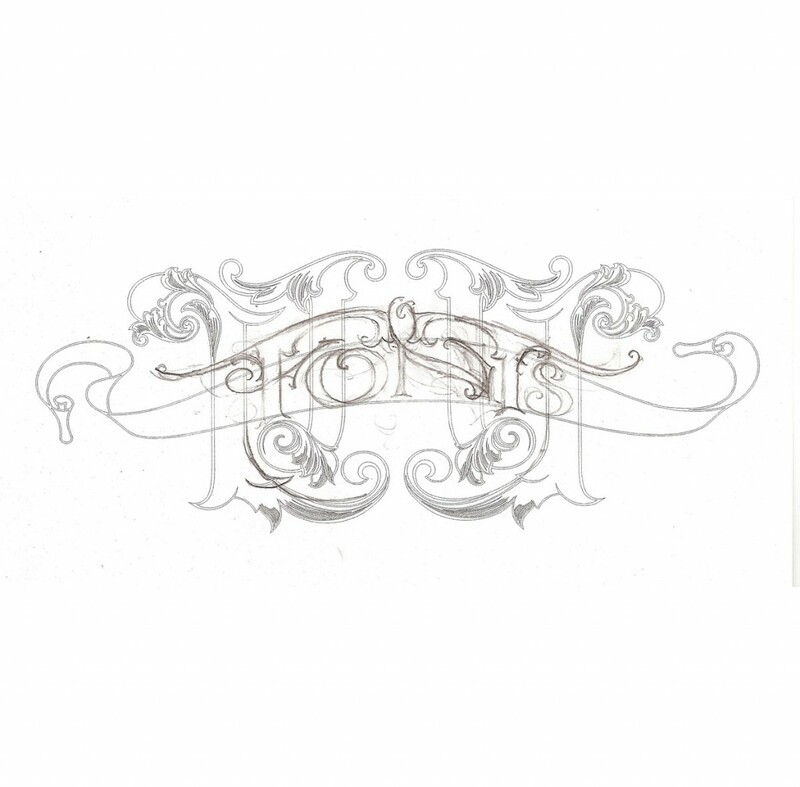 That person or group decides the format, location, fees charged if any and all other variables. 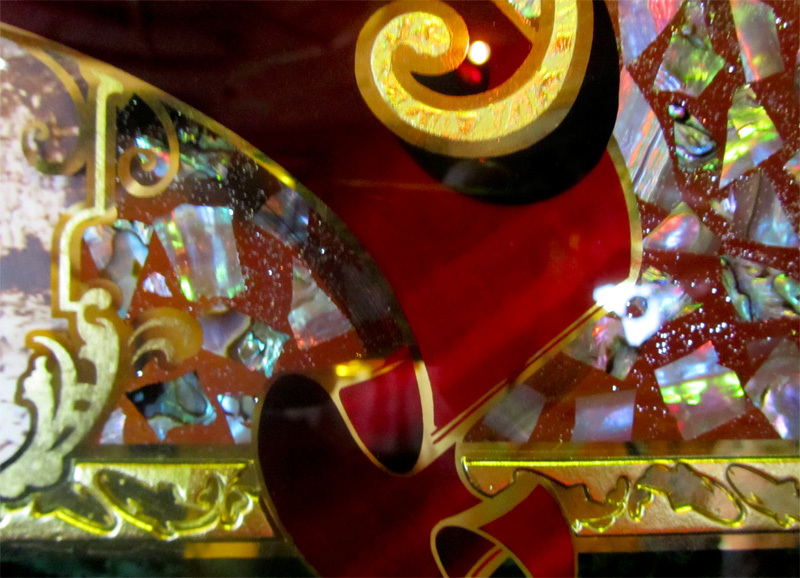 At the center of the all the hoopla is the willingness to learn, share, and explore. 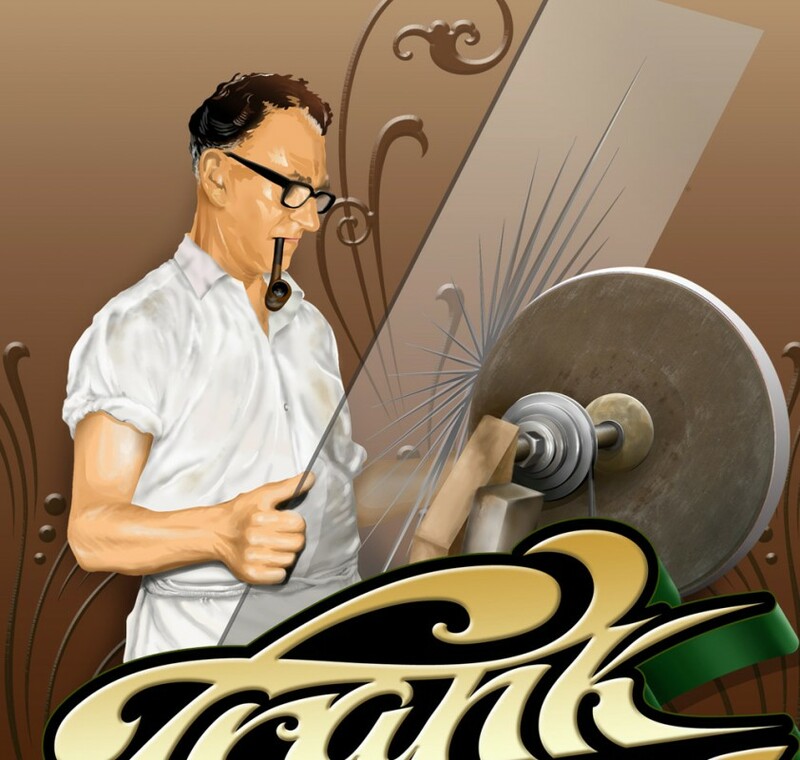 Prior to the Letterheads, many craftsmen closely guarded their hard earned knowledge. 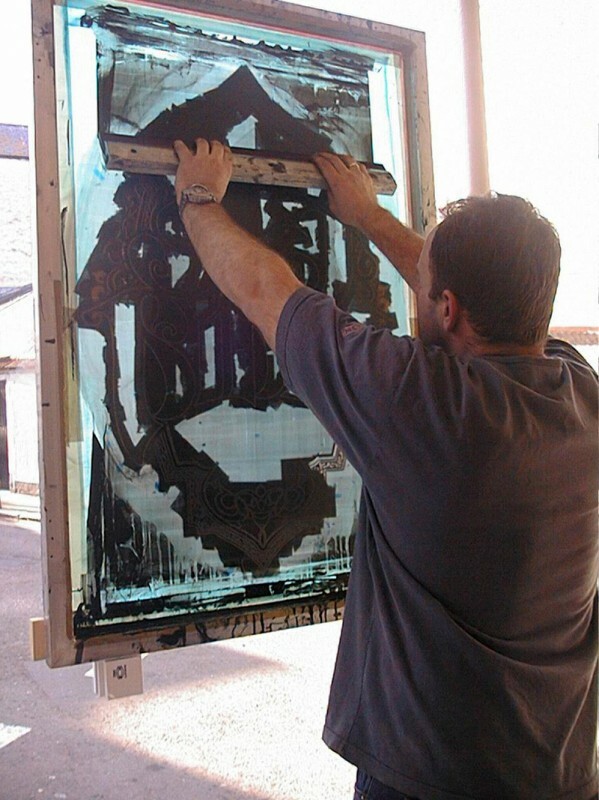 Once, caught up in the movement, it becomes difficult not to want to share your knowledge, especially when even more experienced people are sharing theirs. 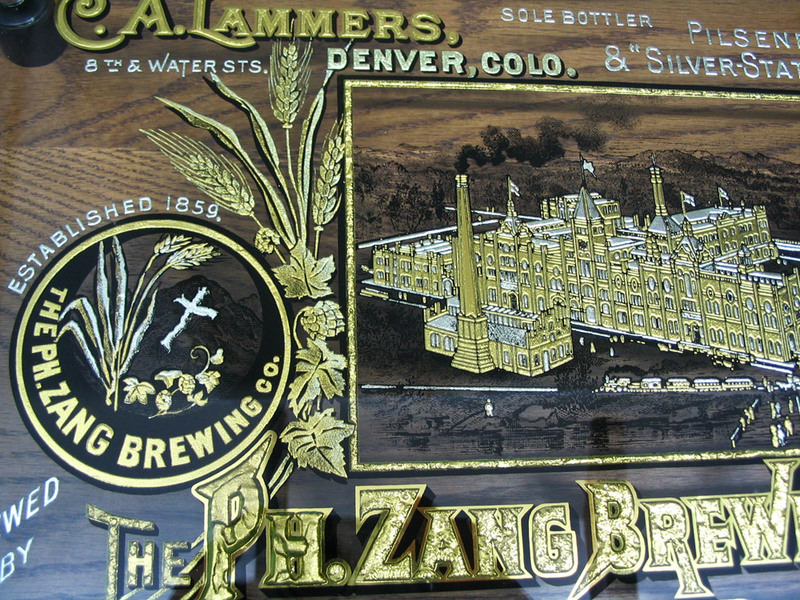 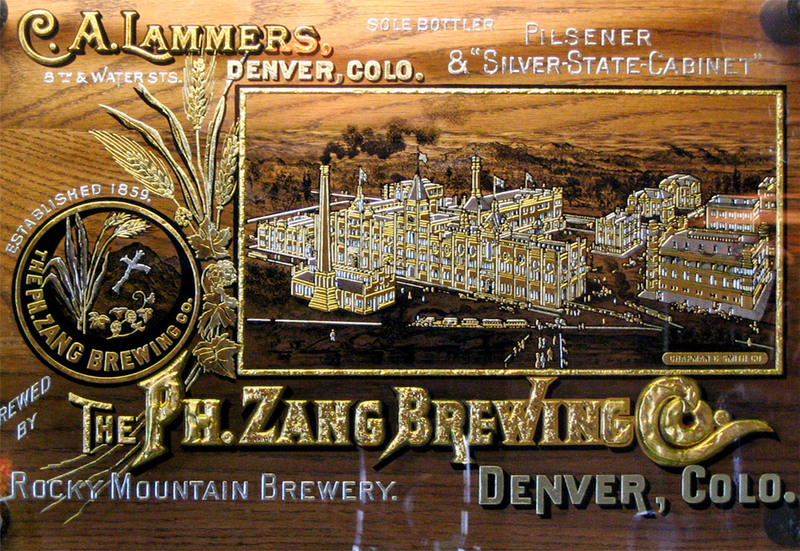 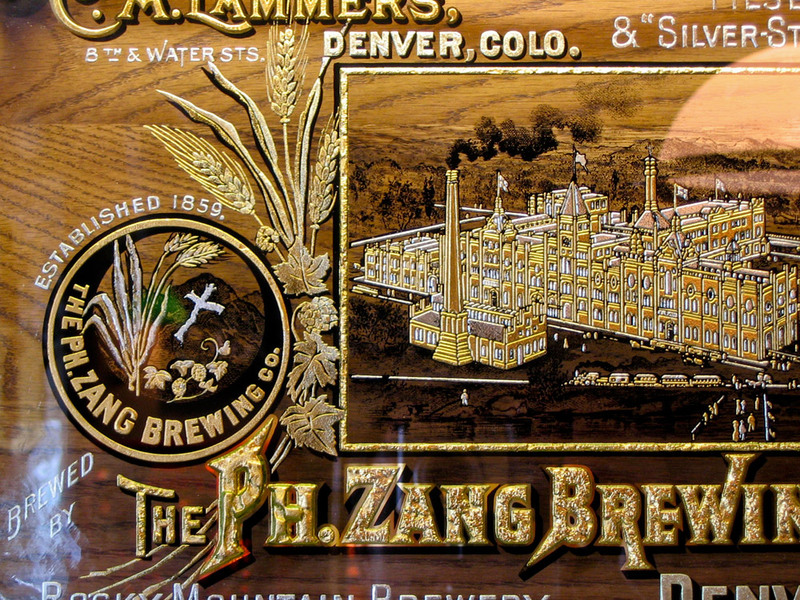 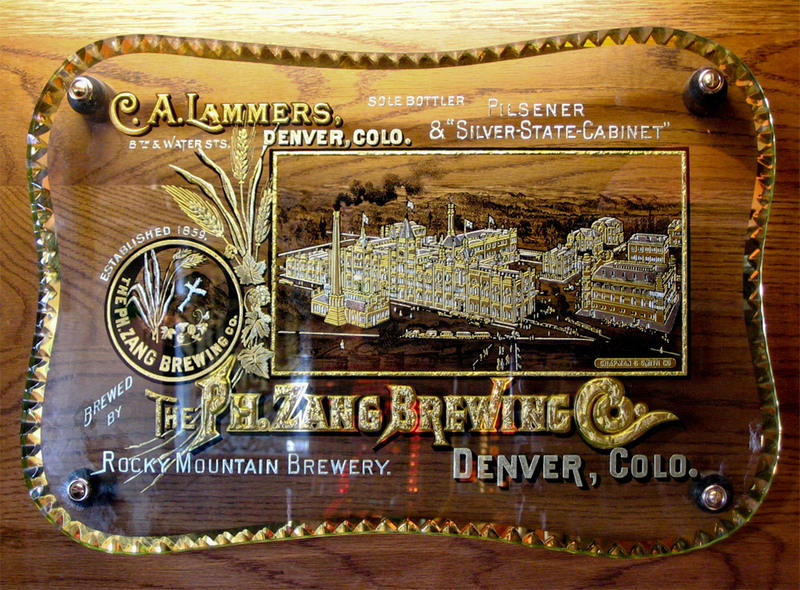 While the earliest meetings in Denver emphasized the noble craft of sign painting, gilding, and designing, later meetings have acknowledged and accepted the introduction of the computer age. 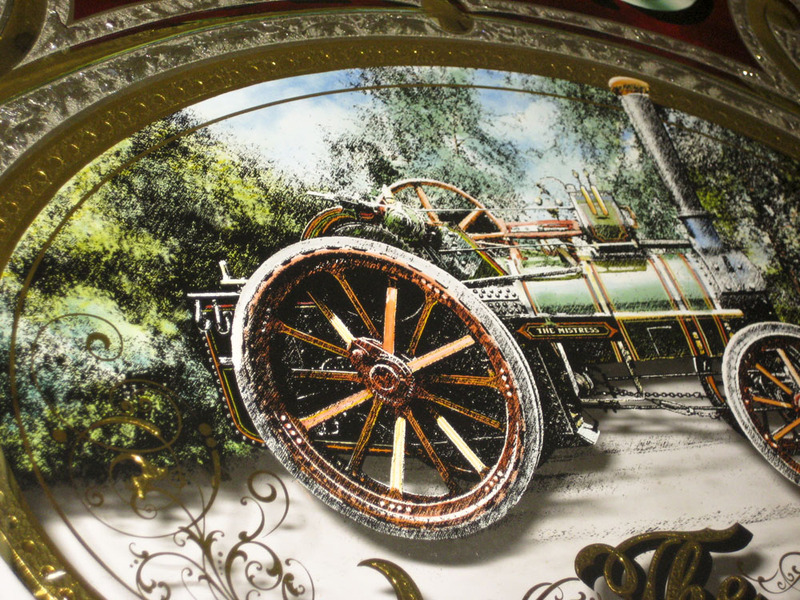 Even today, the blending of the old craft and state of the art technologies collect a crowd. 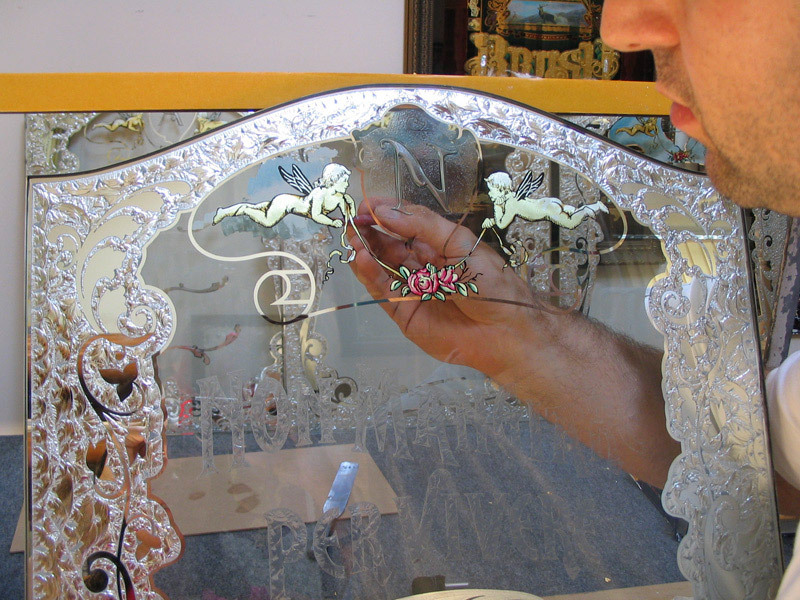 Often, meetings have a theme, and attendees are encouraged to make a project showing off some of the person's talents or techniques. 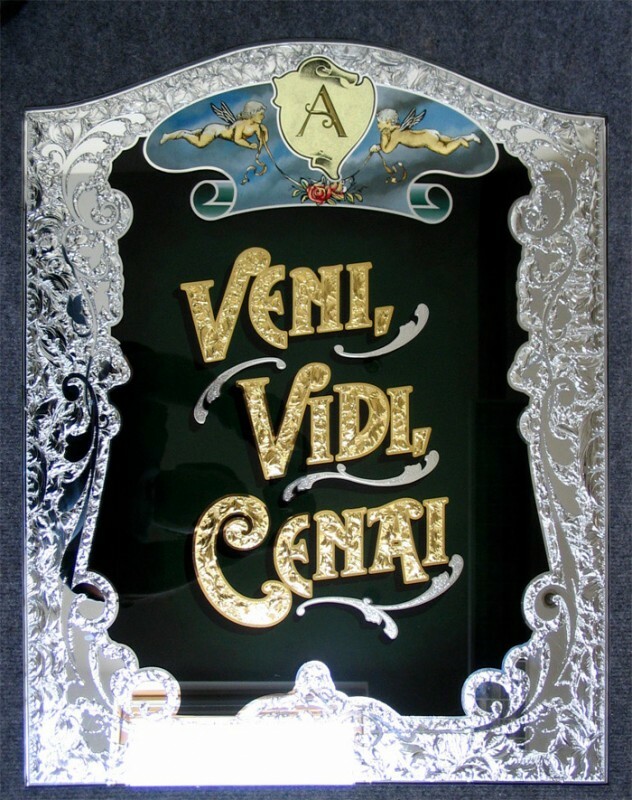 If you ever attend a meeting, be prepared. 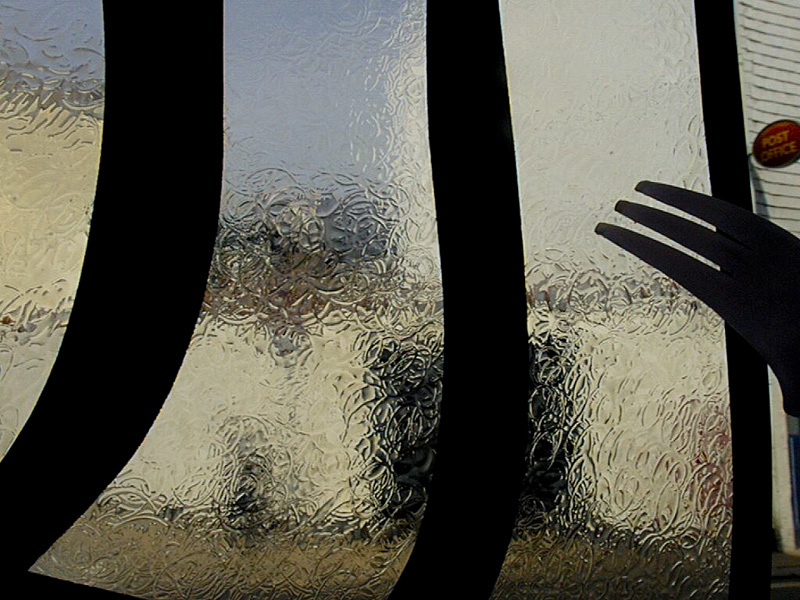 Sleep a lot before you go because you won't want to when you get there. 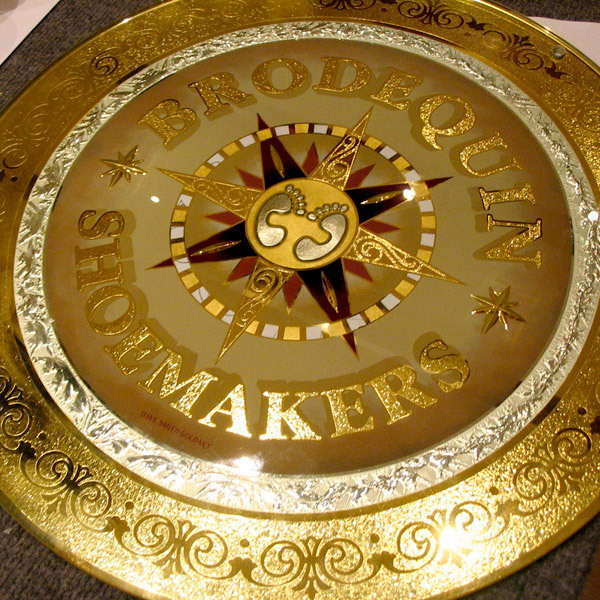 Some meetings have had all night episodes. 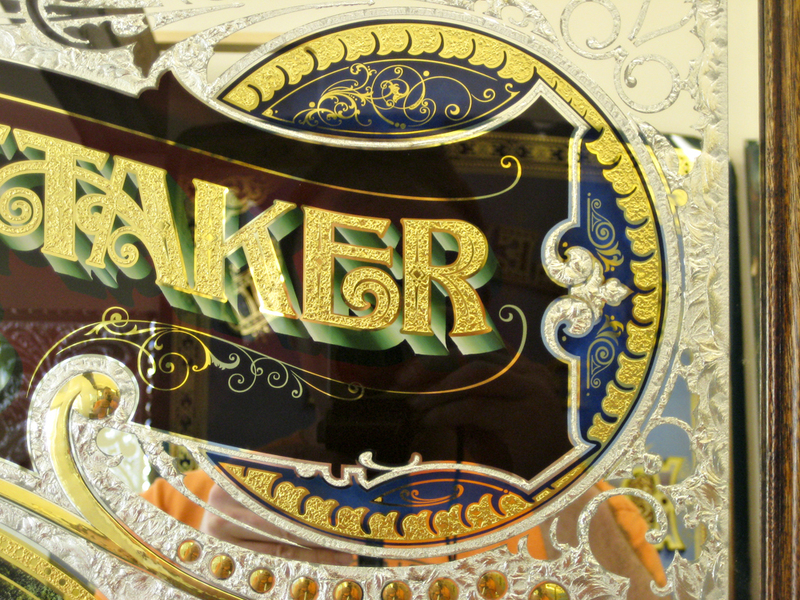 Take your camera and plenty of film, flash, polarizing filter, and maybe some more film. 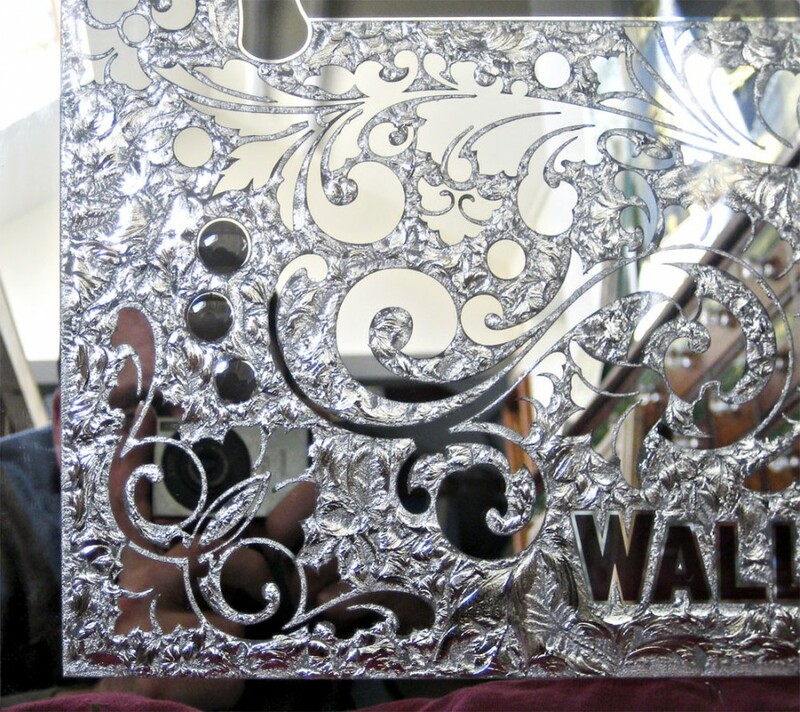 Bring a portfolio and a notebook. 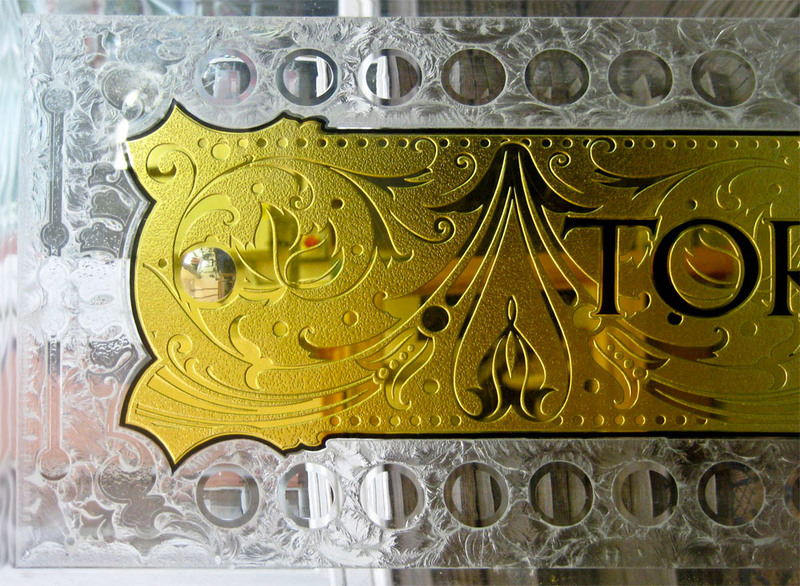 Walking in the door, be prepared to feel intimidated-but that will soon pass as you get caught in the excitement. 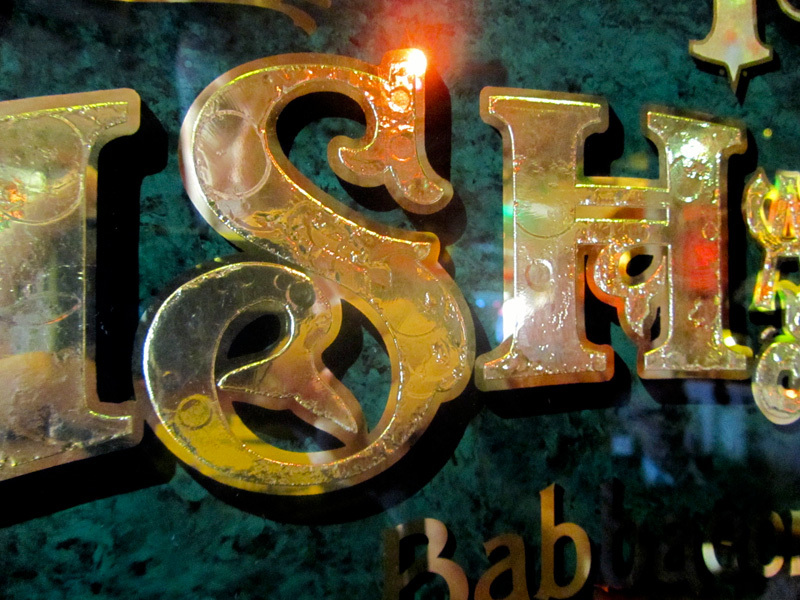 Ask the host if you can help out and they will certainly let you! 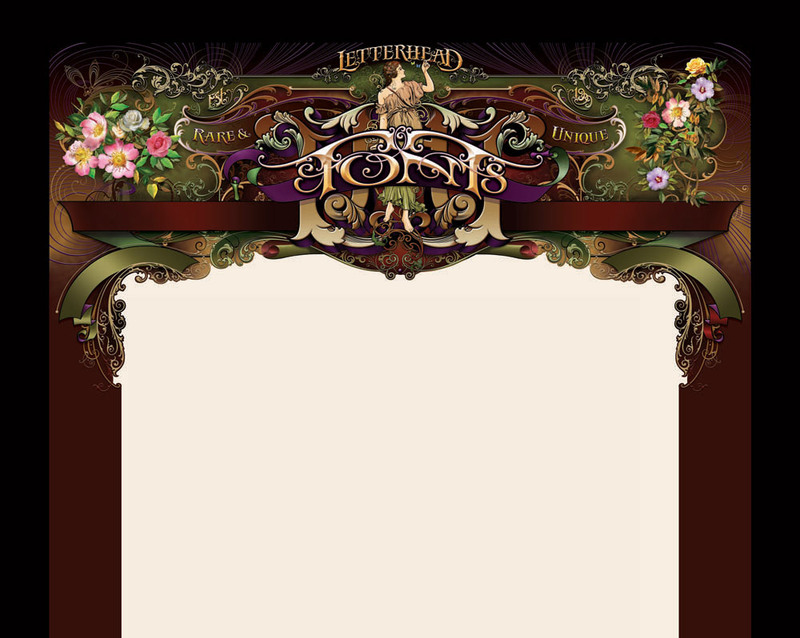 Your first Letterheads meeting will probably change your life. 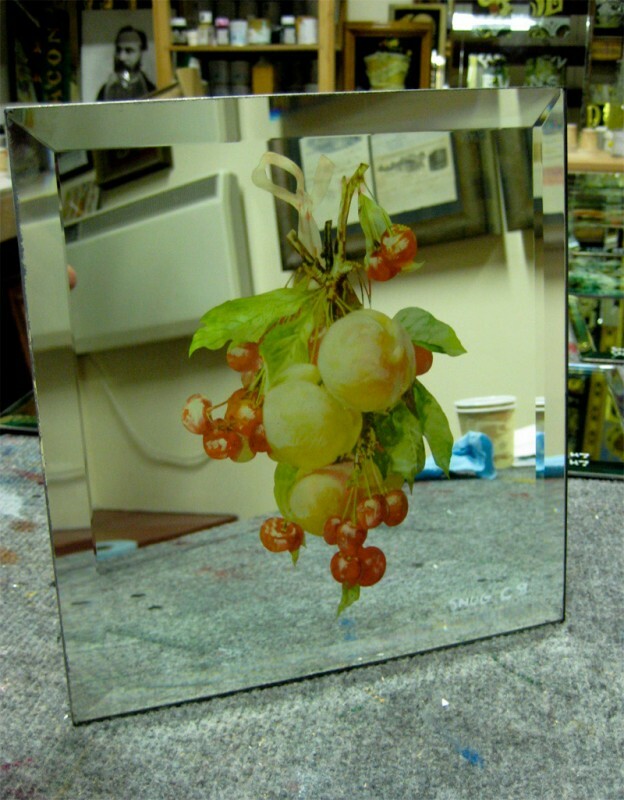 I recently restored 35 of 60 original glass snug mirrors for the National Trust. 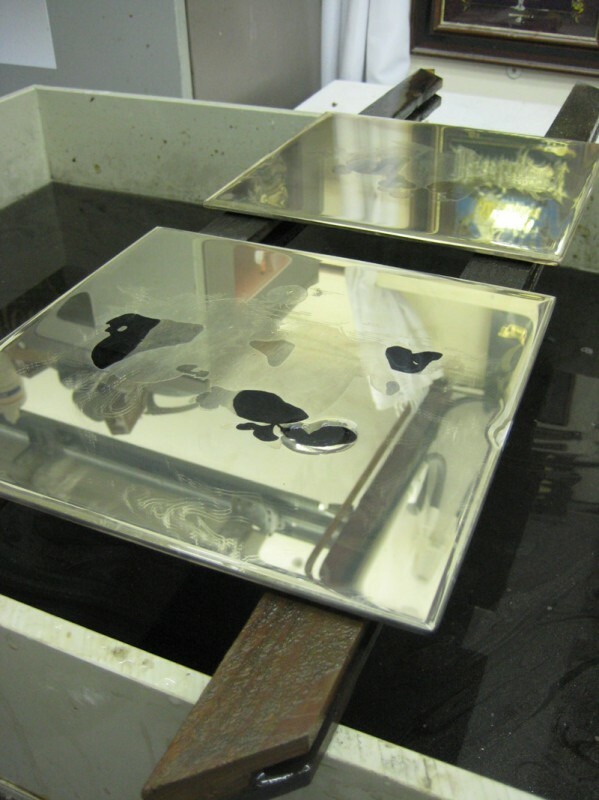 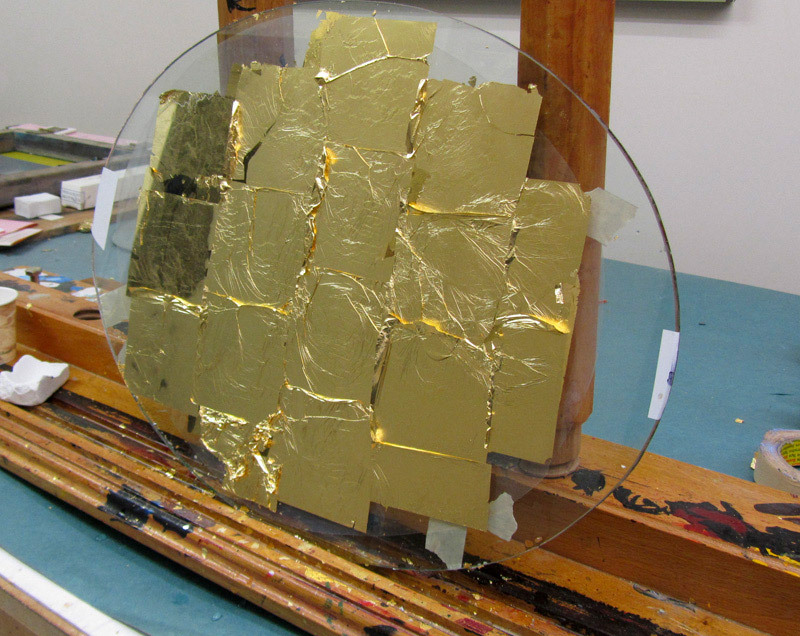 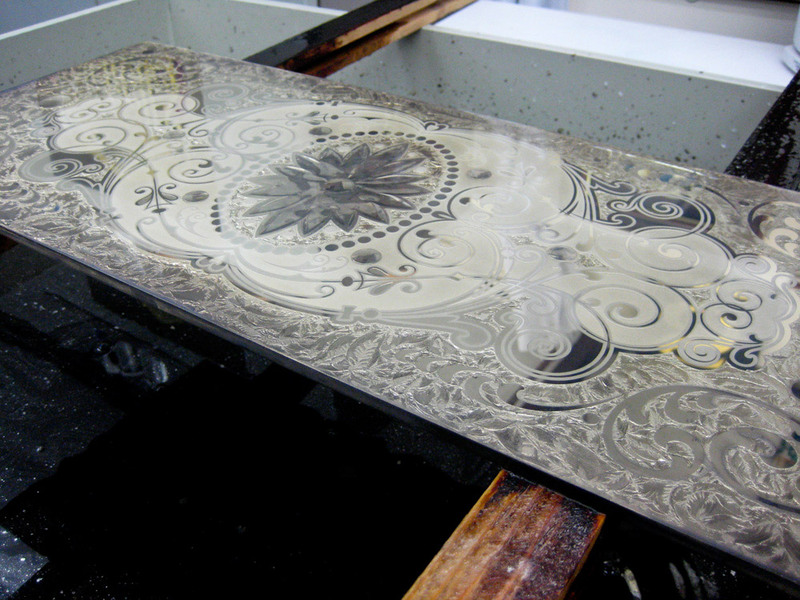 In these images it takes you through some stages of making the Snug mirrors. 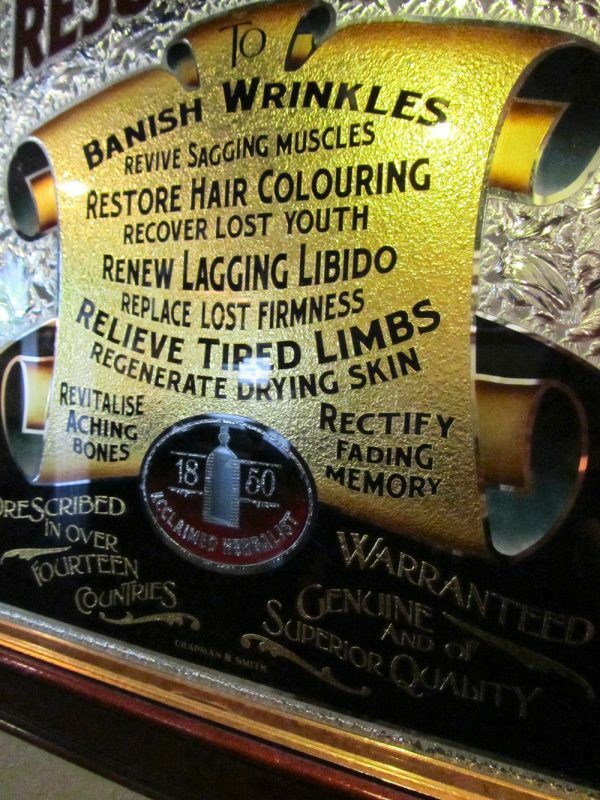 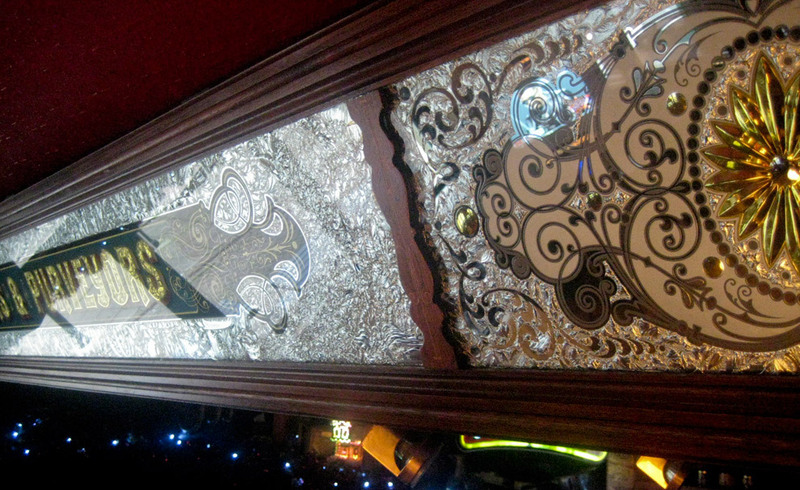 Please read the following about the bar and the mirrors if you have time..
Another great delight in this magical place is the ten different shaped, cosy and elaborately carved wooden Boothes, lettered from A-J. 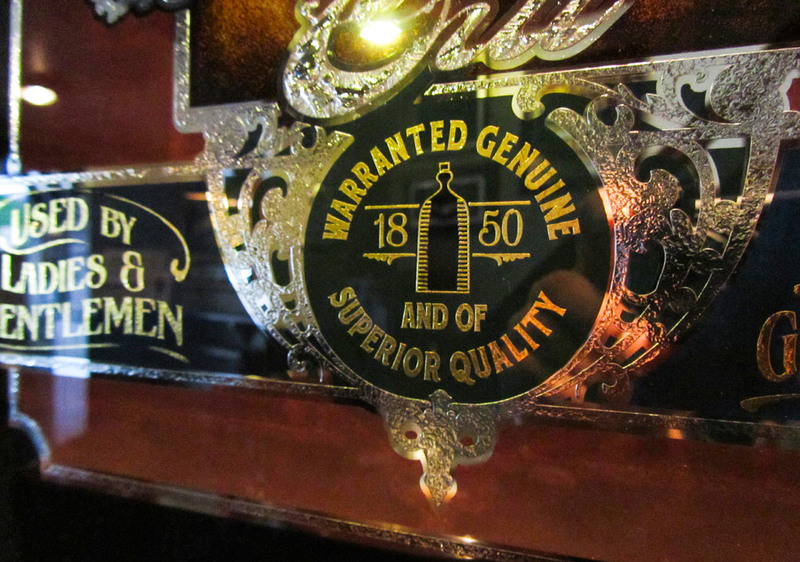 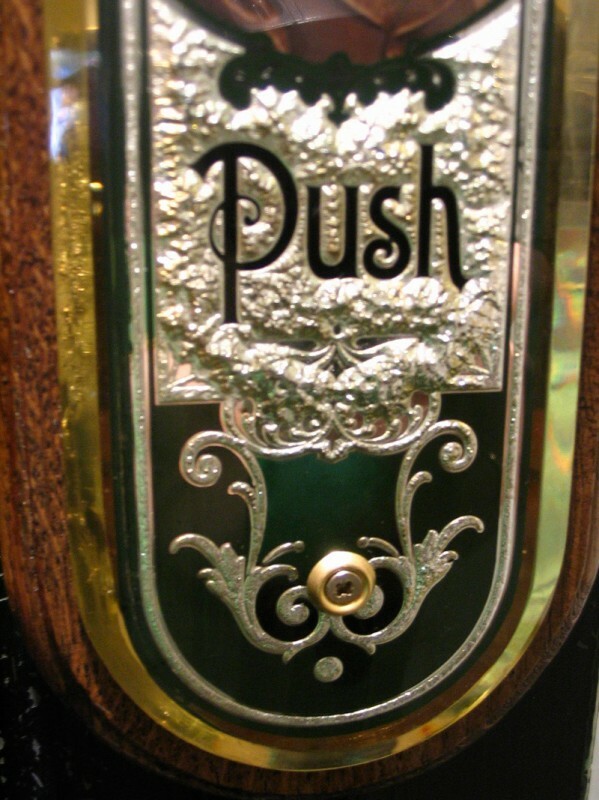 In the snugs you will find gun metal plates for striking matches, and an antique bell system (this used to be very common in Victorian Houses where servants were employed), which alerts bar staff to your liquid needs. 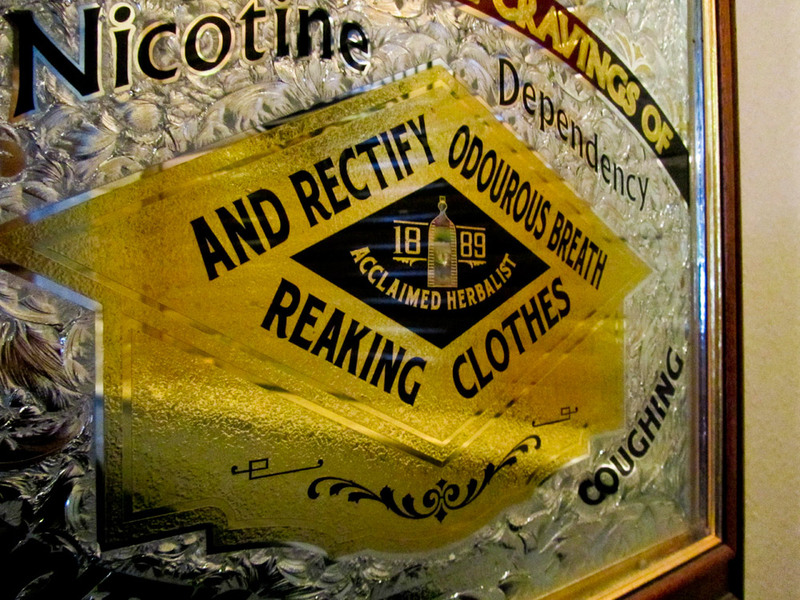 Drinking snugs according to old records were not originally built for comfort, but to accommodate those people who preferred to drink quietly and unseen. 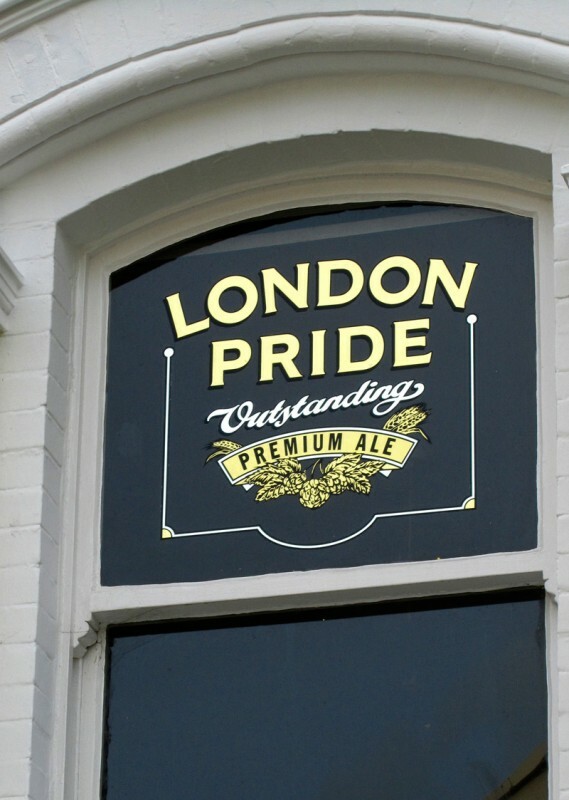 'To slip in for a quick one' obviously referred to those reserved or shy individuals who may have held opinions on public houses, but at the same time, still like to drink, provided no-one saw him or her taking it. 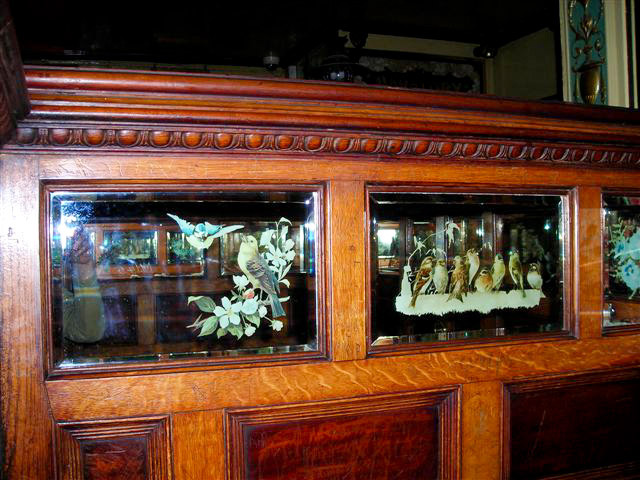 Those people are few and far between now: nevertheless the 'snug' habit very much remains with us and even in the most modern bar you will still find a version of this quaint drinking department, but it is still a snug or box- to use the colloquial name. 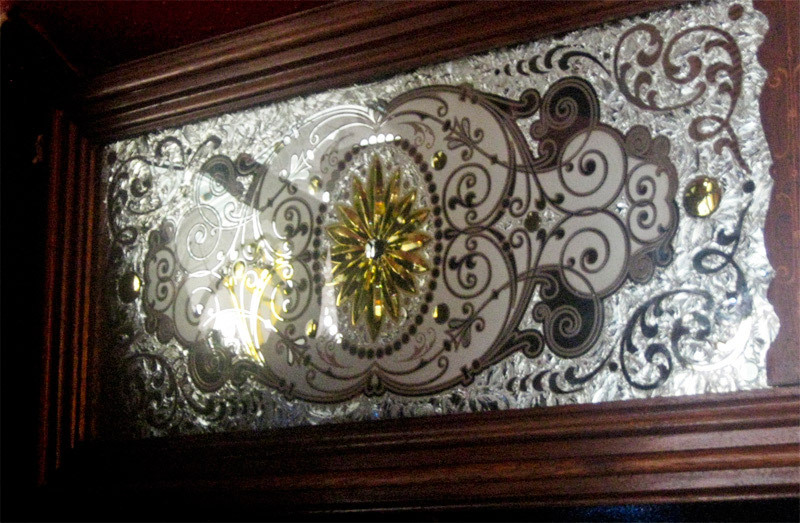 It is no wonder that much revolutionary conspiracy and many clandestine meetings took place in these little snugs. 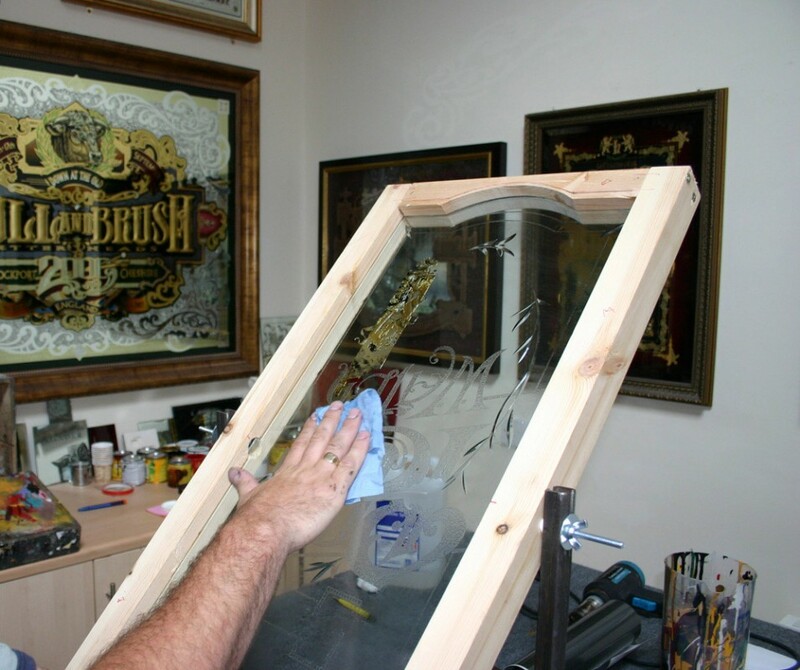 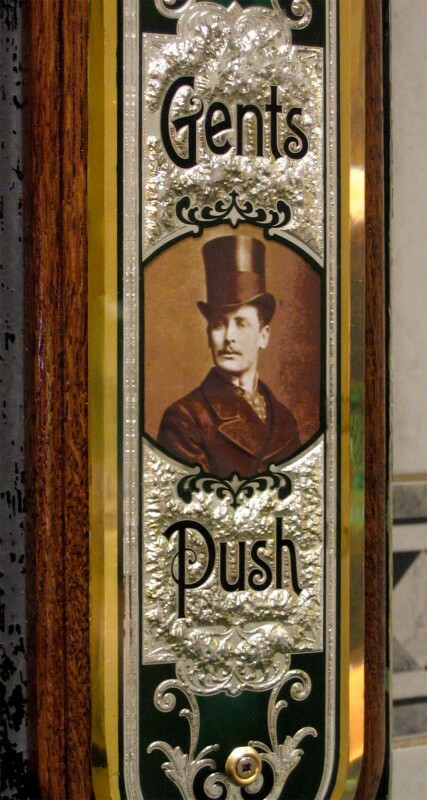 This Reverse glass advertising sign was made for my good friend Mike Venus who is the proprietor of a brush, paint and gold leaf supplies business in London. 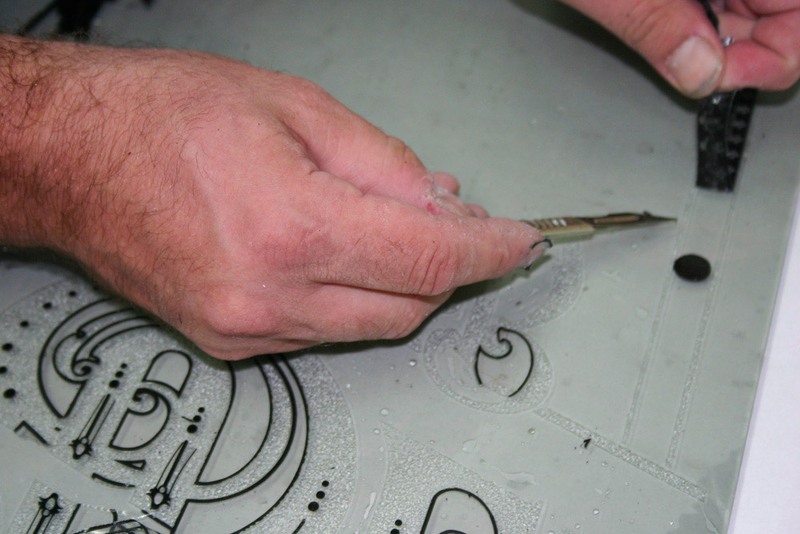 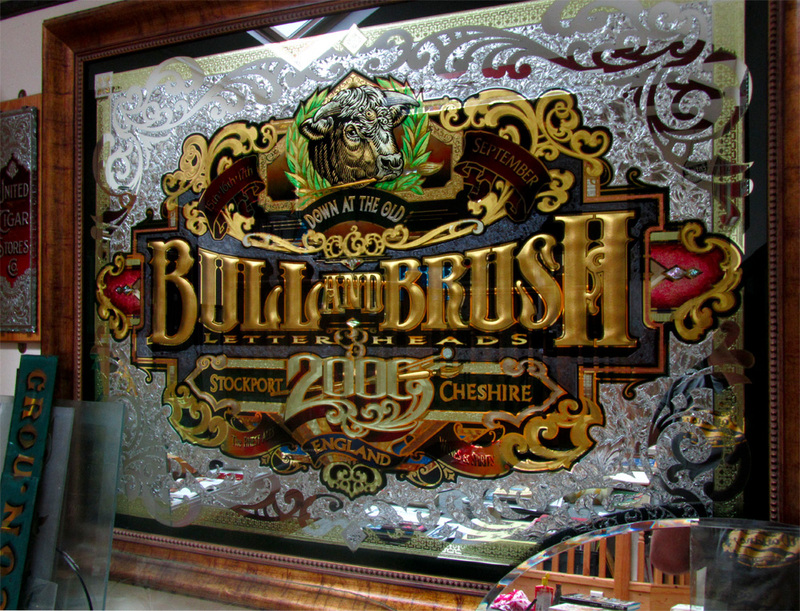 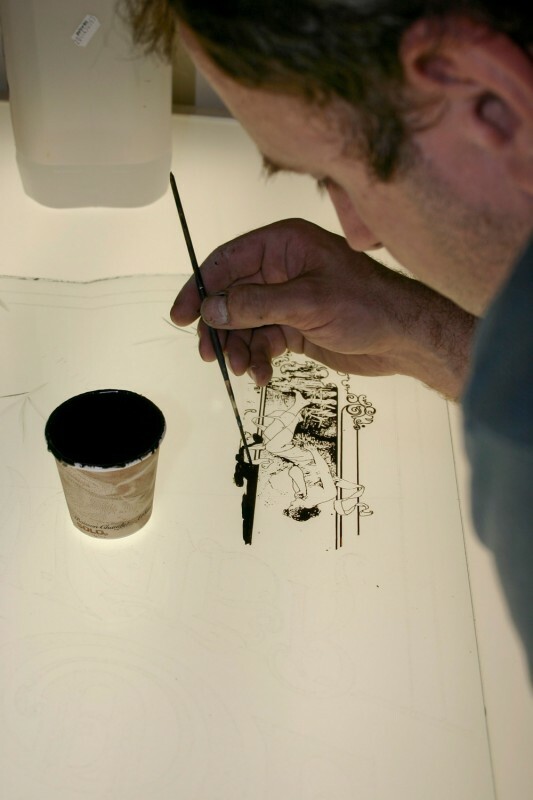 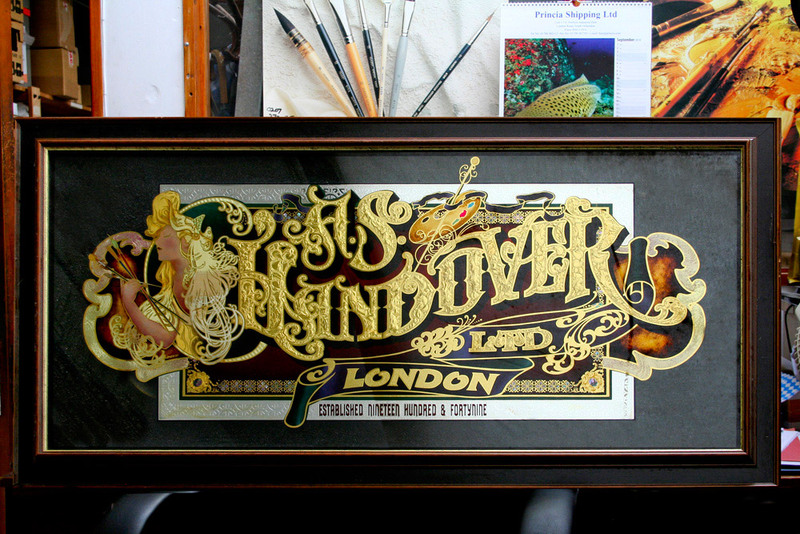 The company still hand makes there own specialised sign-writing brushes, and supplies customers worldwide with bespoke equipment for sign-writers, gilders and artists. 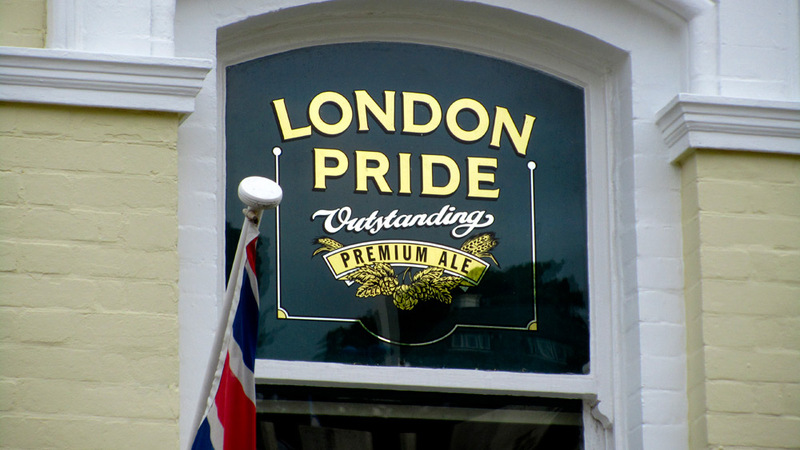 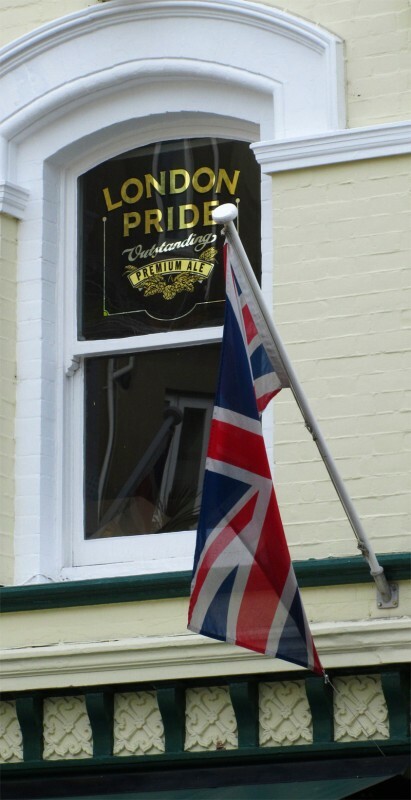 The company was Established over 50 years ago and is still trading in London. 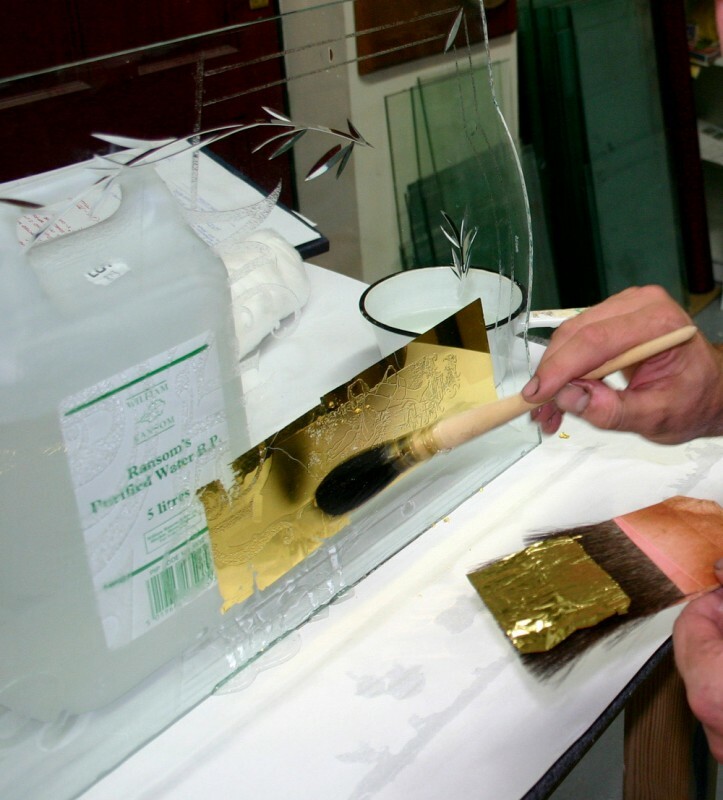 They also sell my gilders tip known as The Smith Tip. 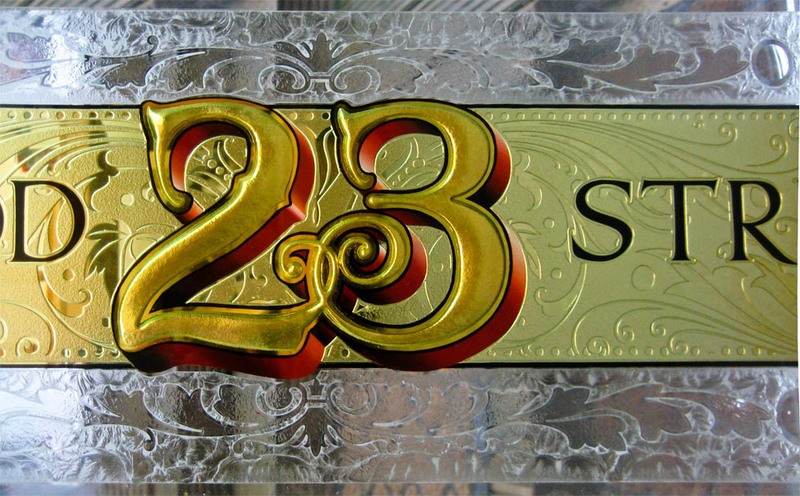 This glass sign is 4ft wide by 22". 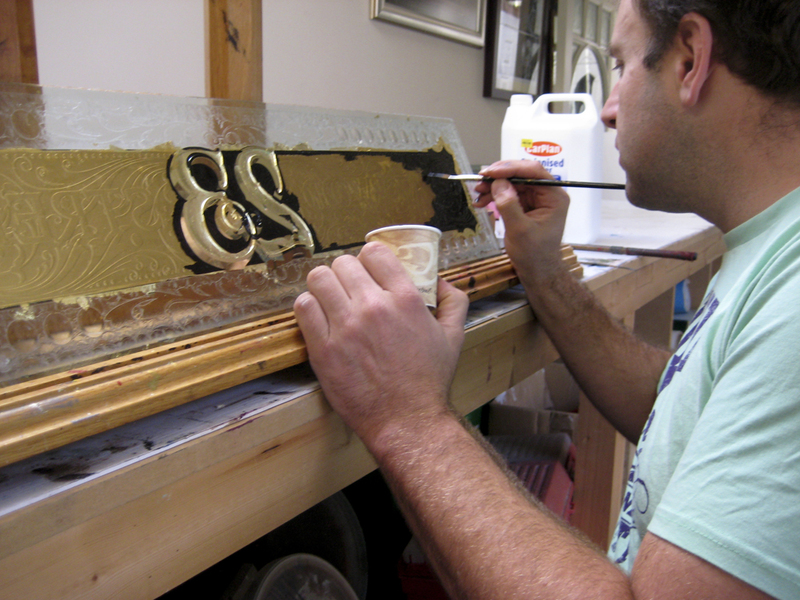 The letters are glue chipped and Angel gilded with various shades of goldleaf. 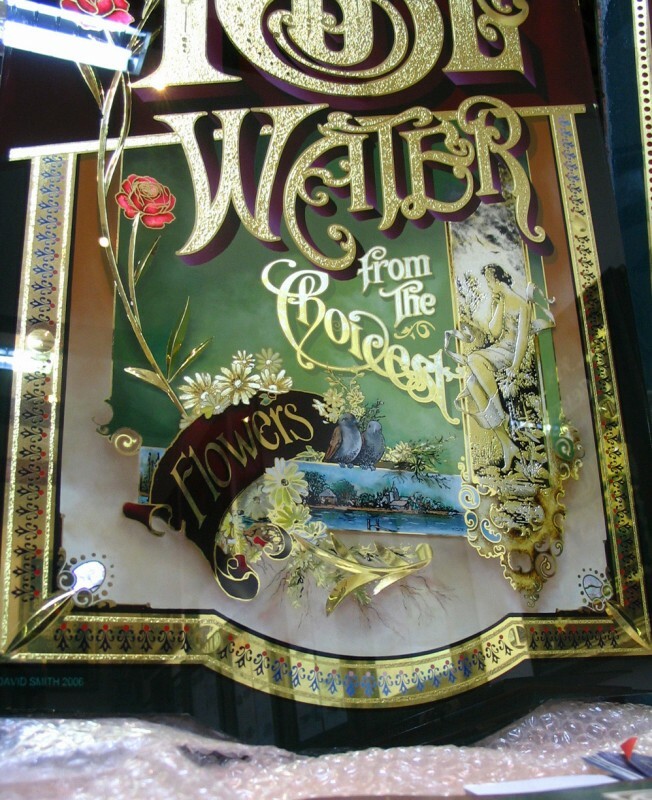 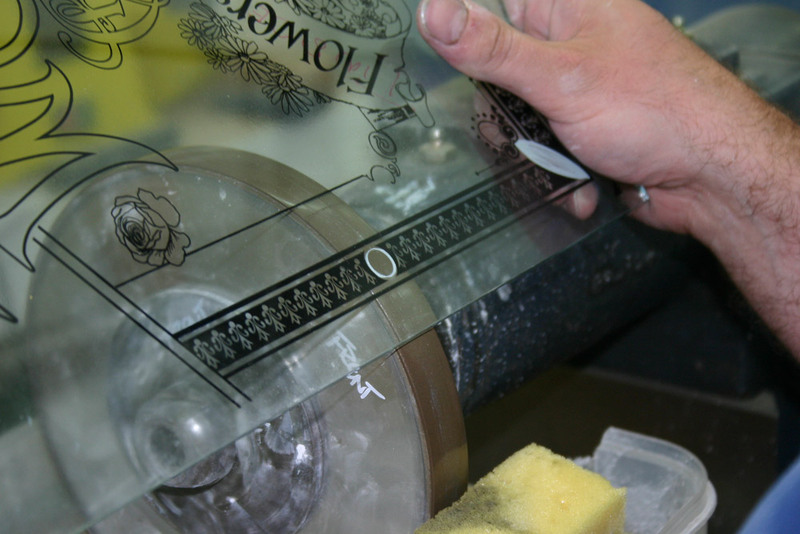 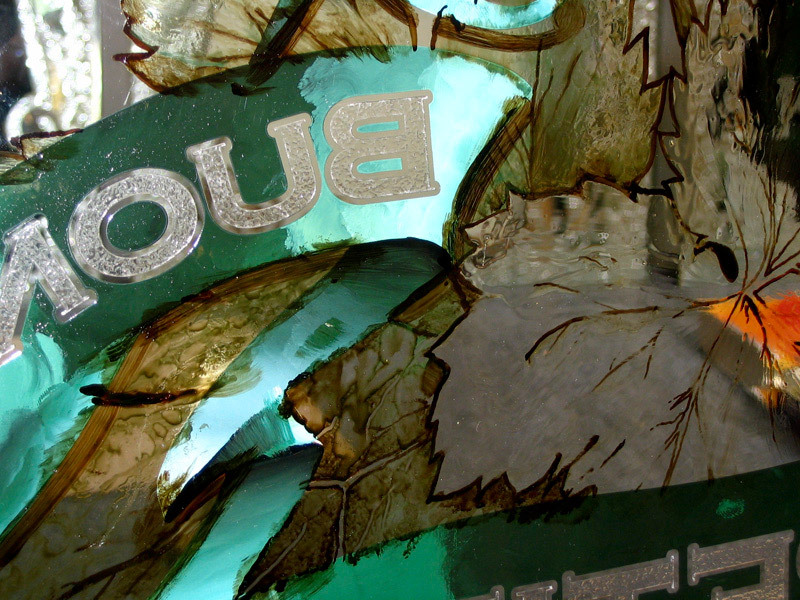 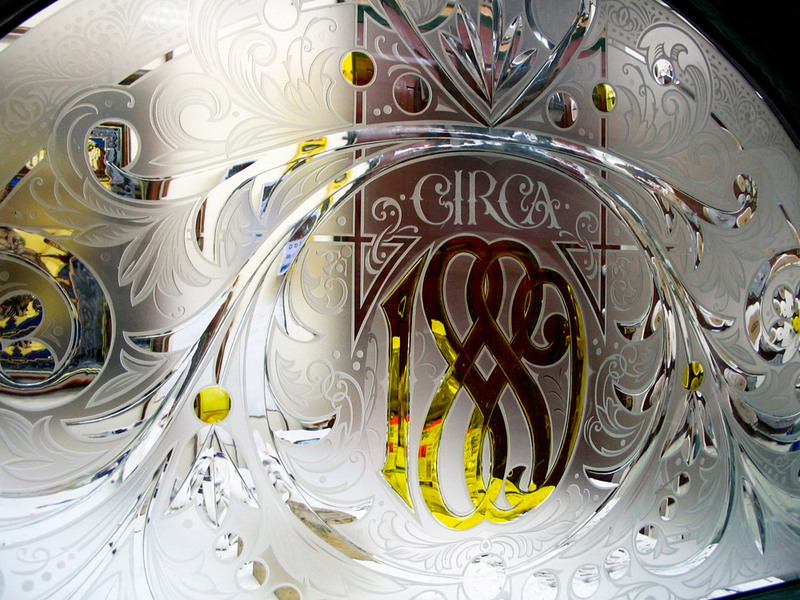 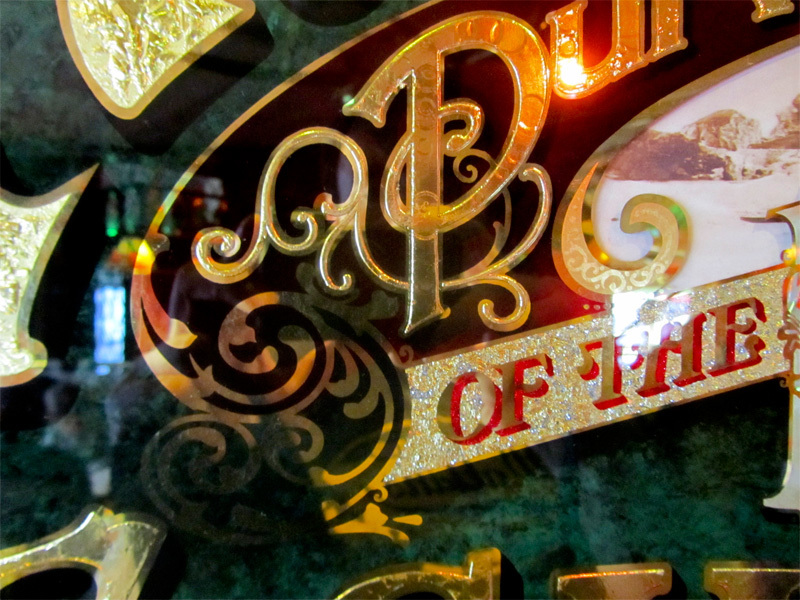 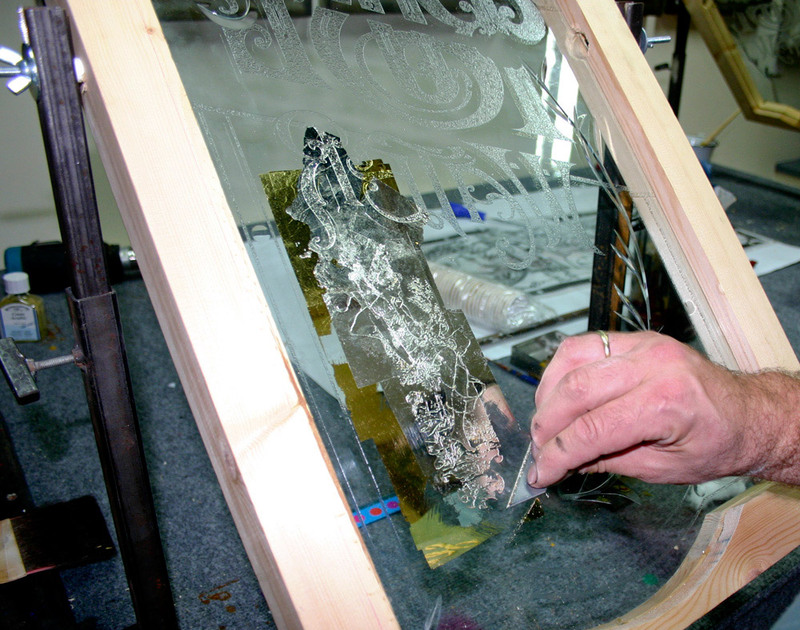 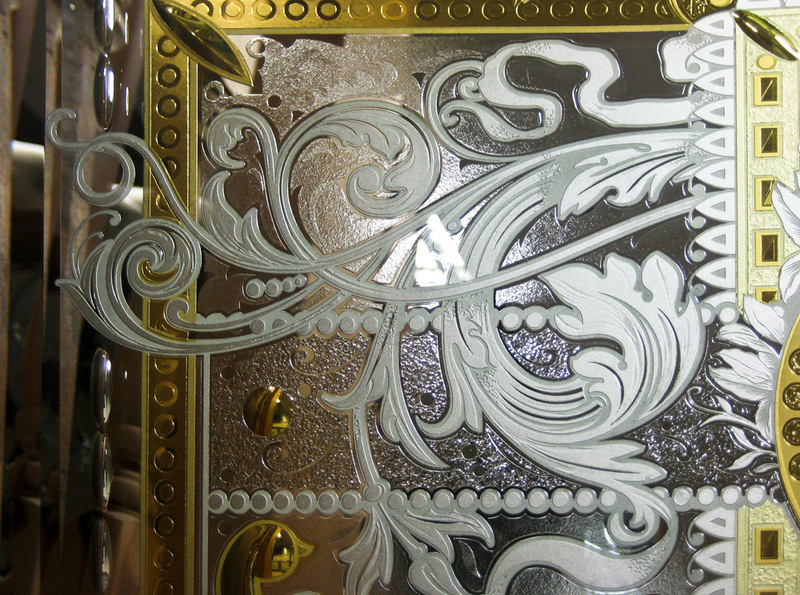 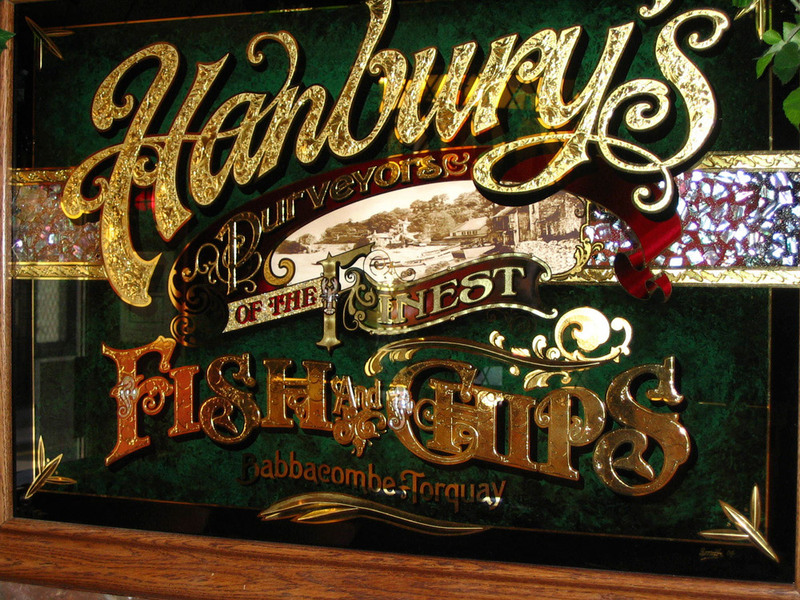 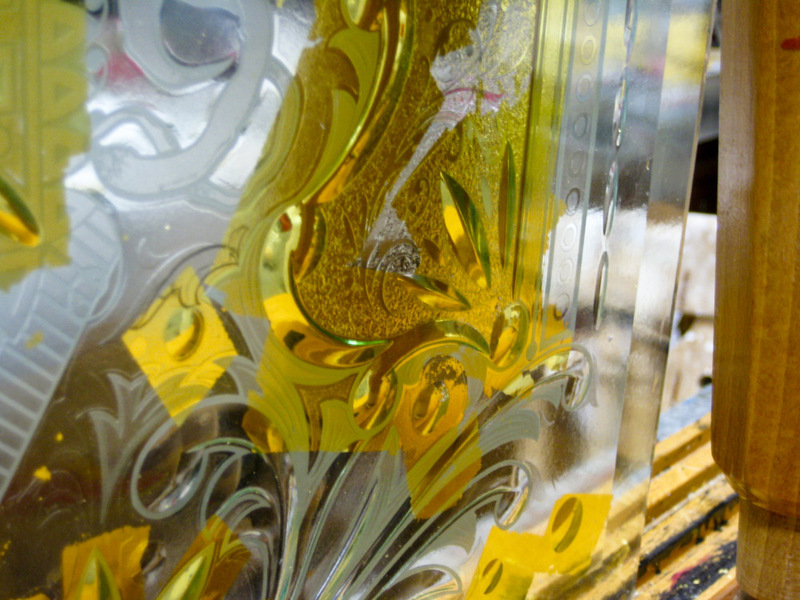 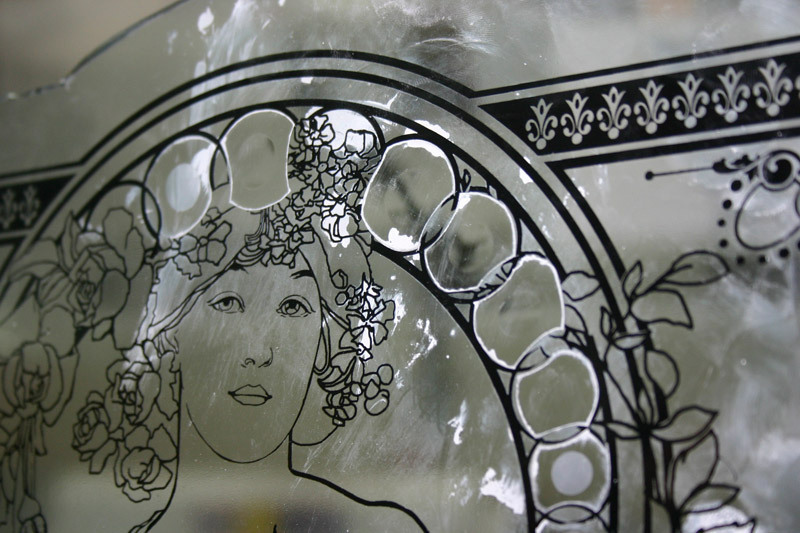 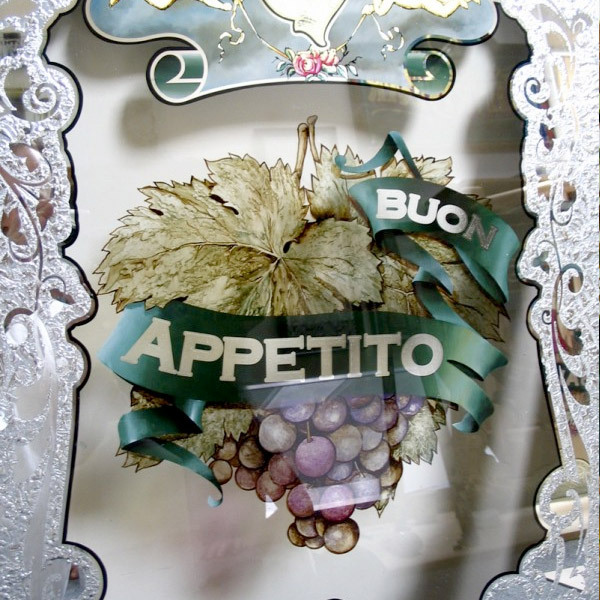 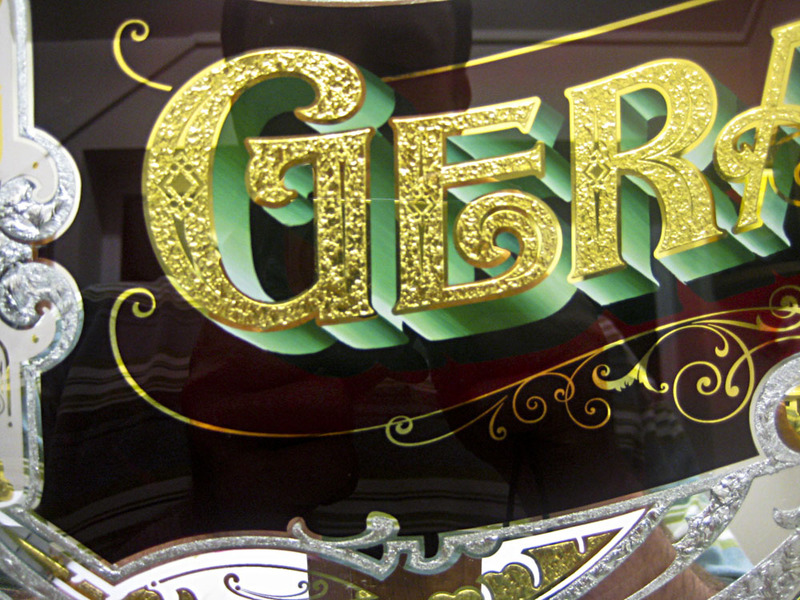 Mother of pearl is used in the border details along with shading and blending, translucent coloured dammar varnish is also present in this glass sign. 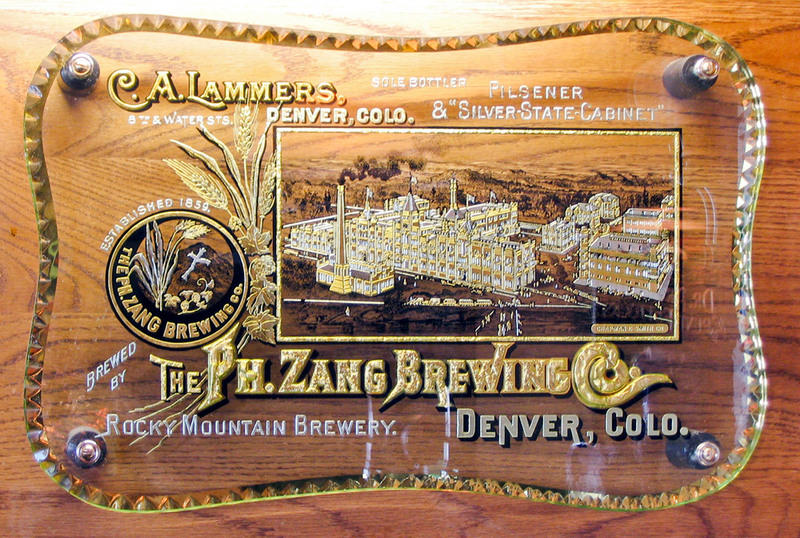 Made in 1993. 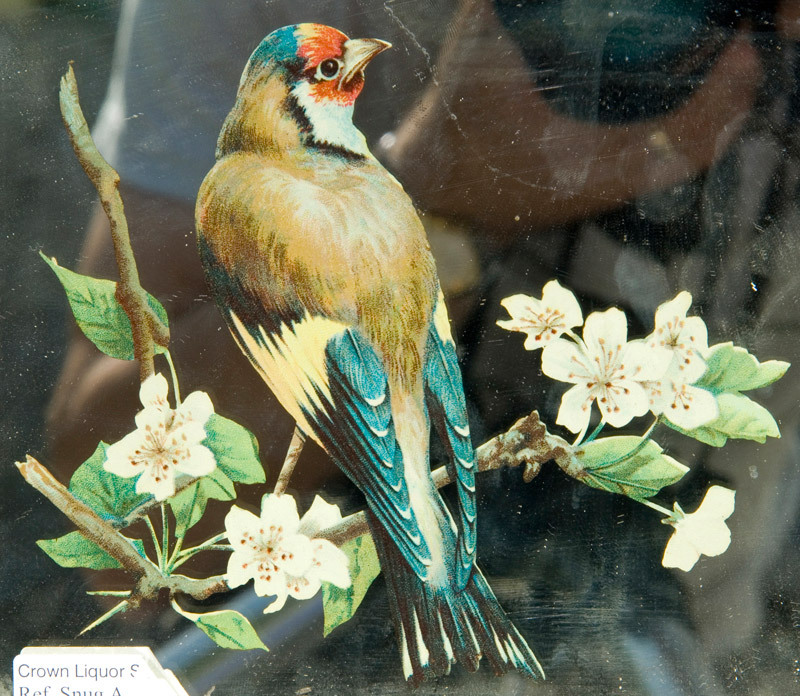 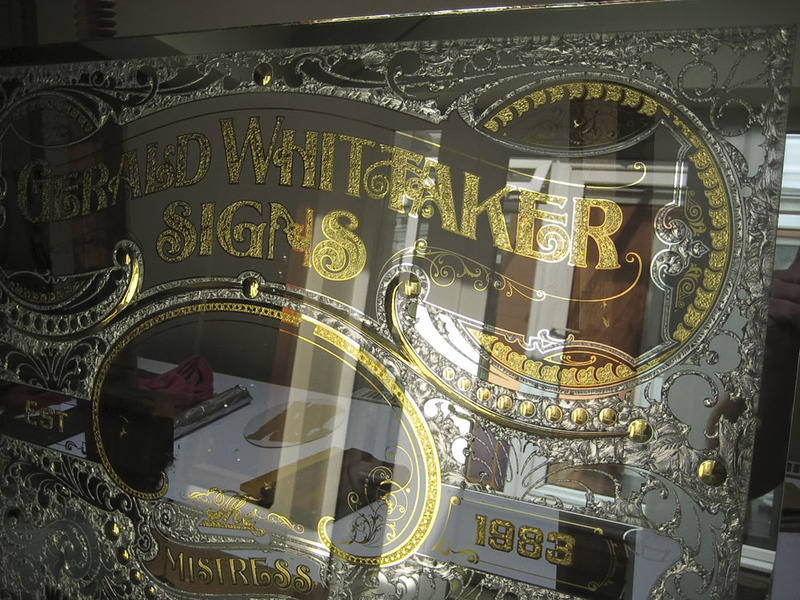 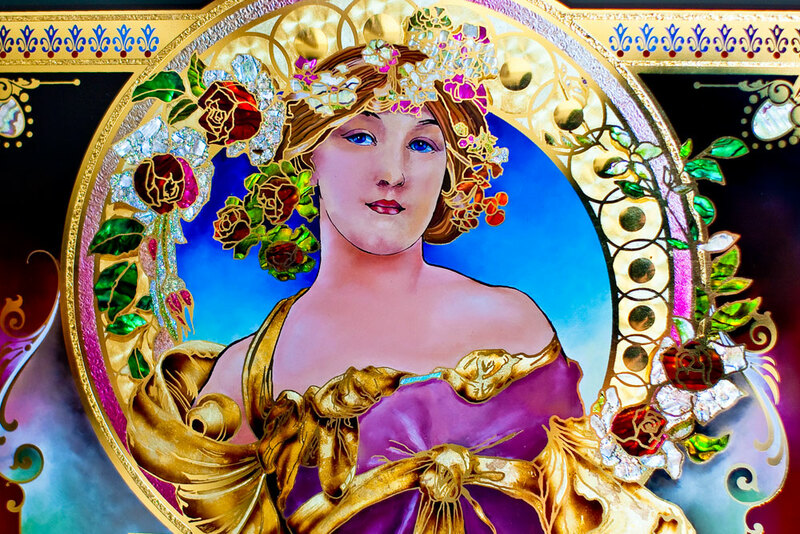 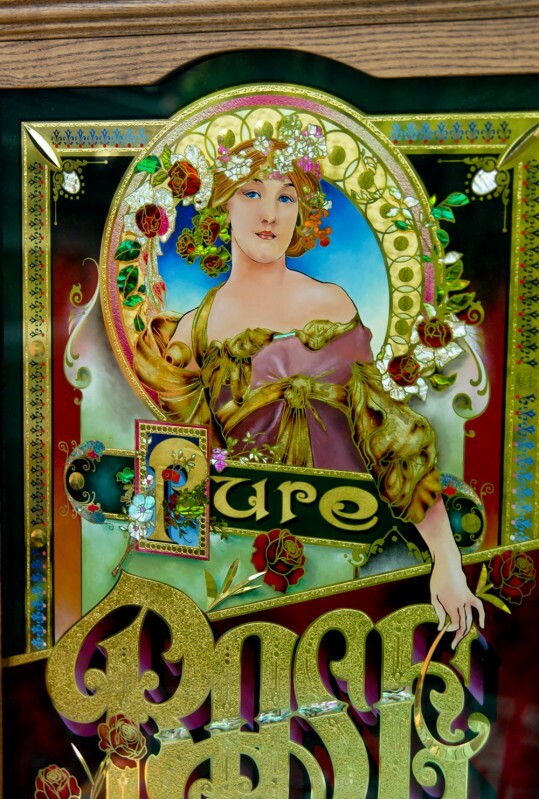 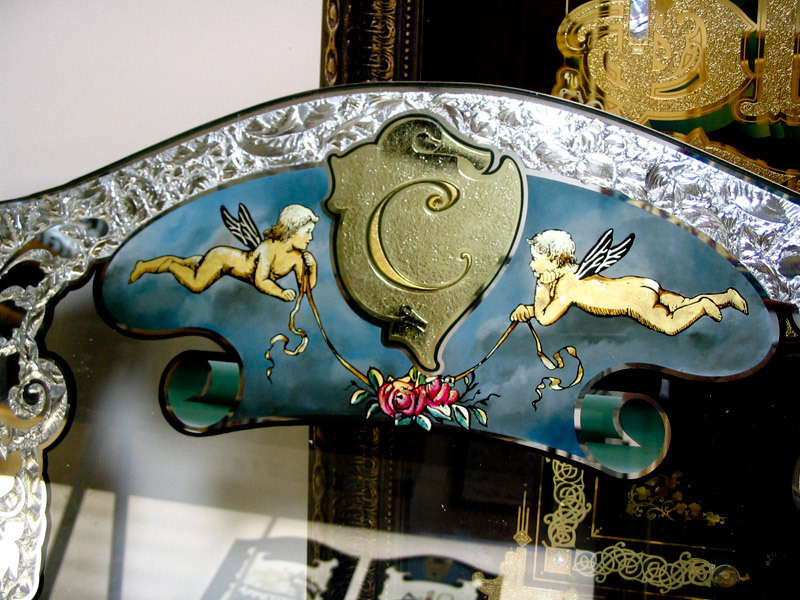 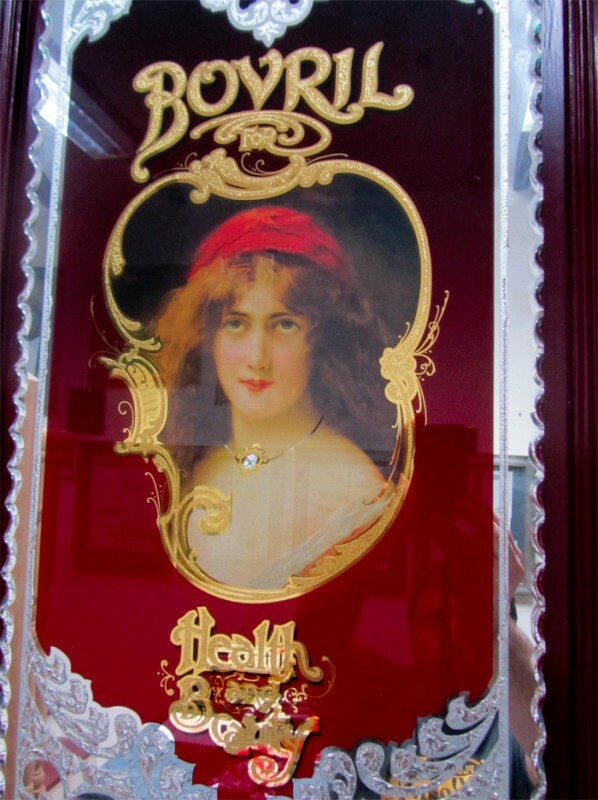 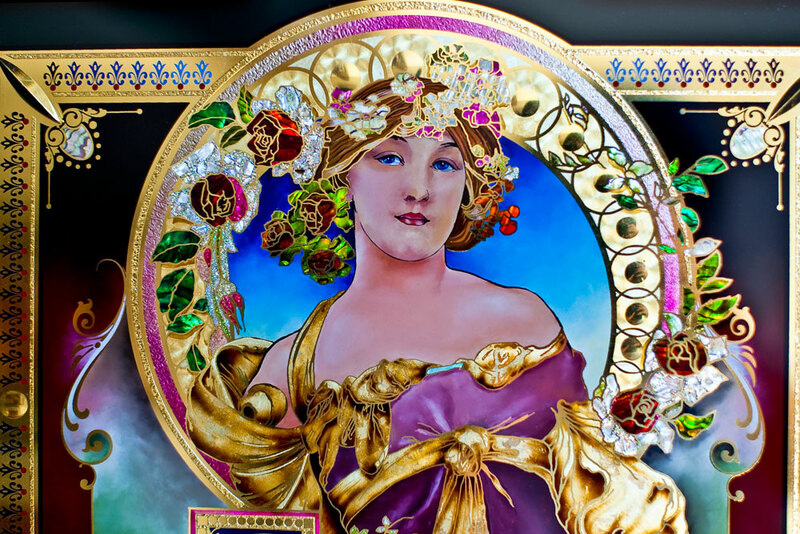 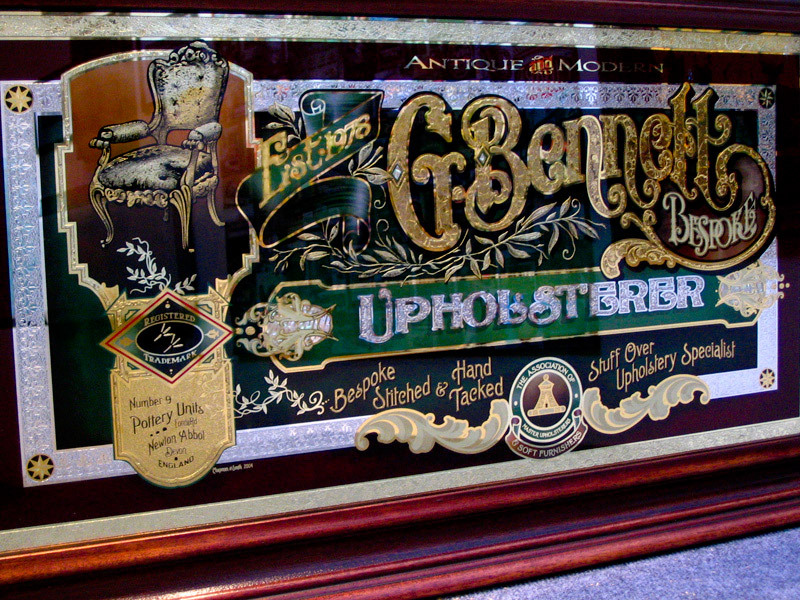 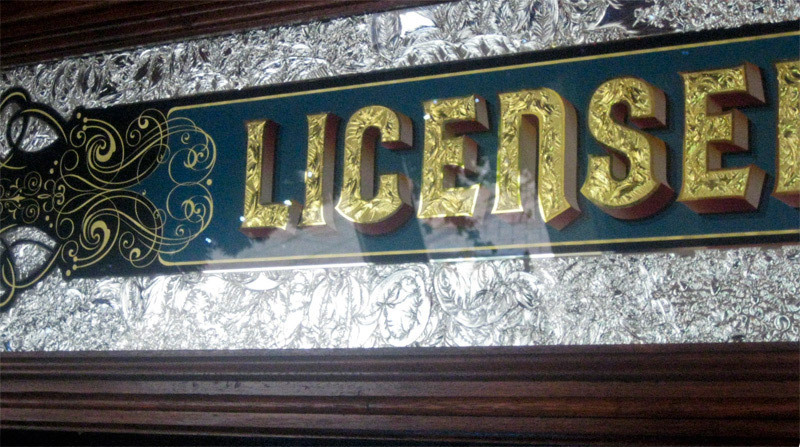 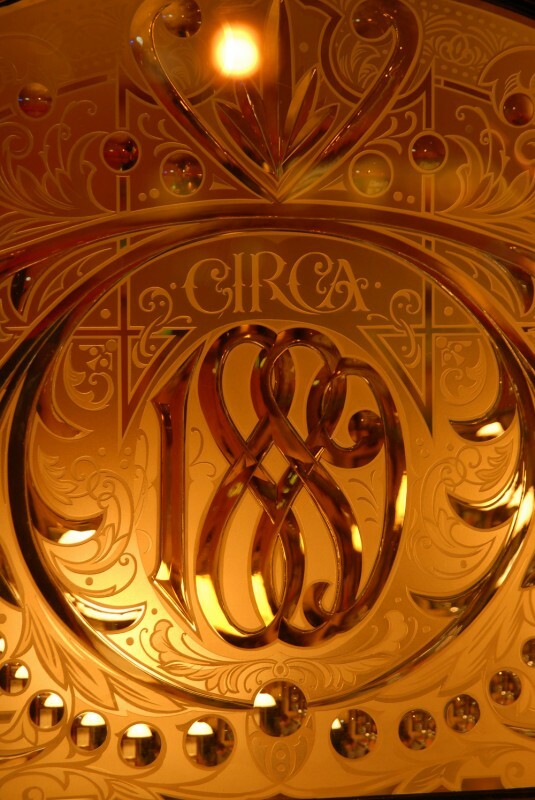 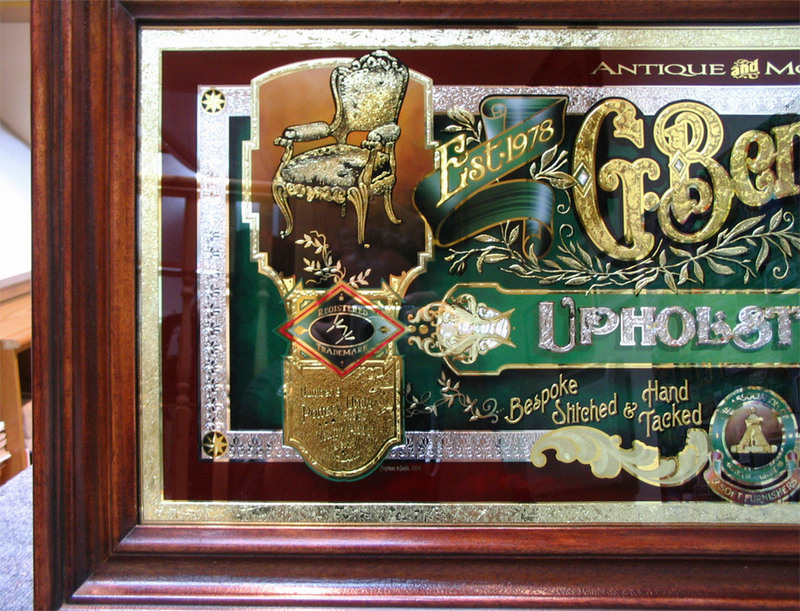 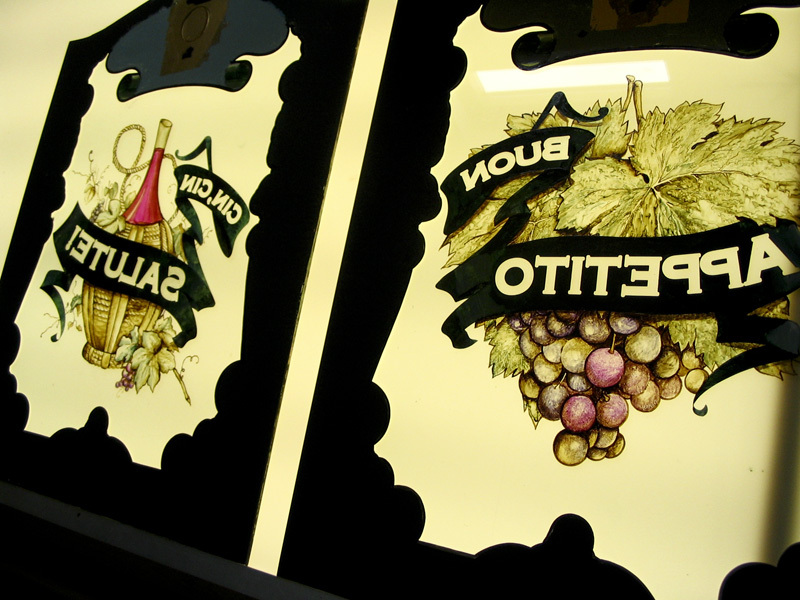 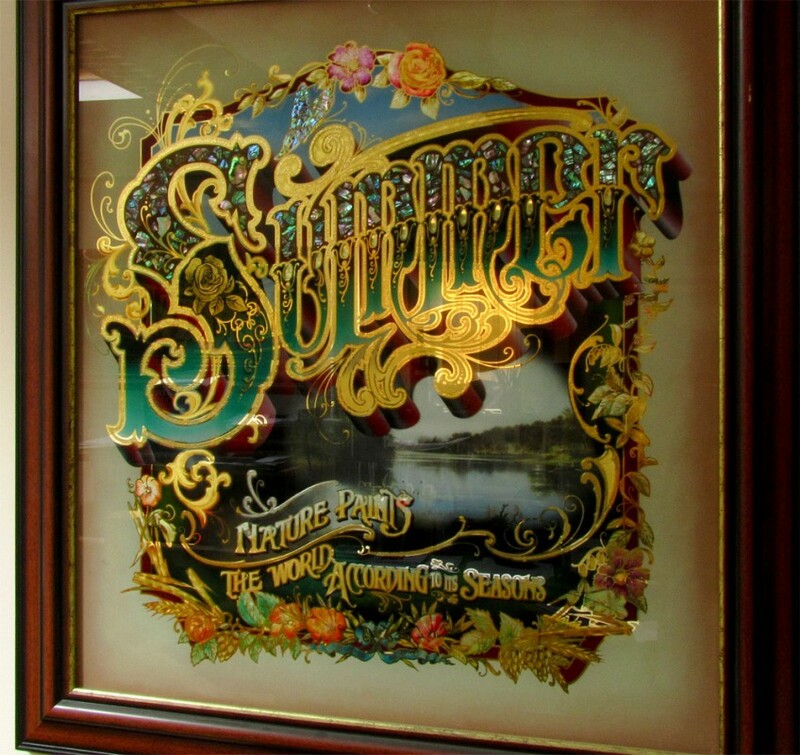 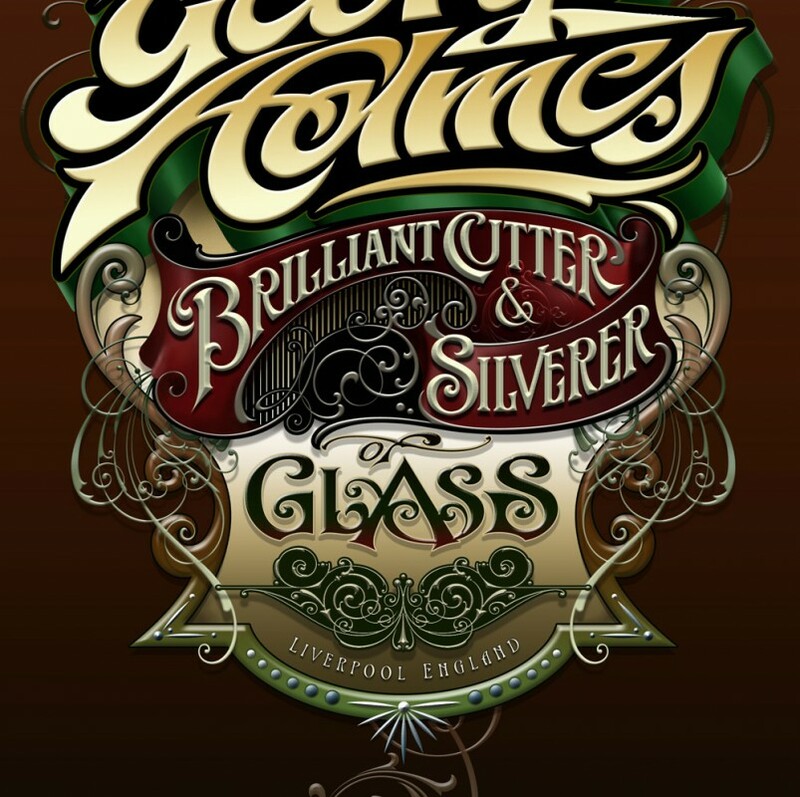 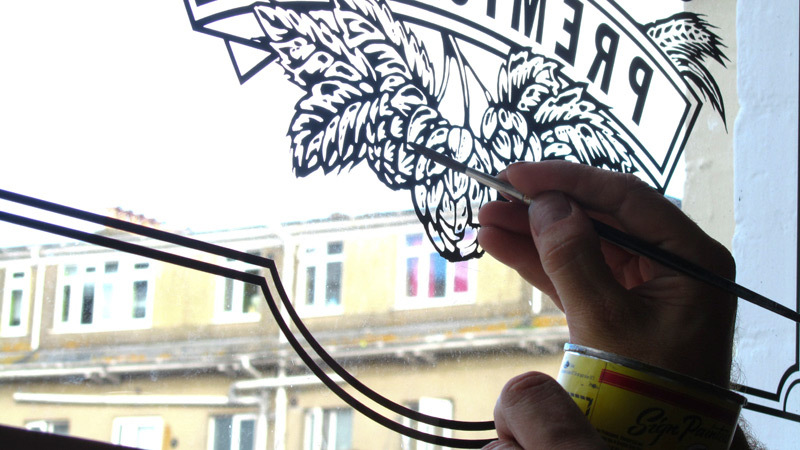 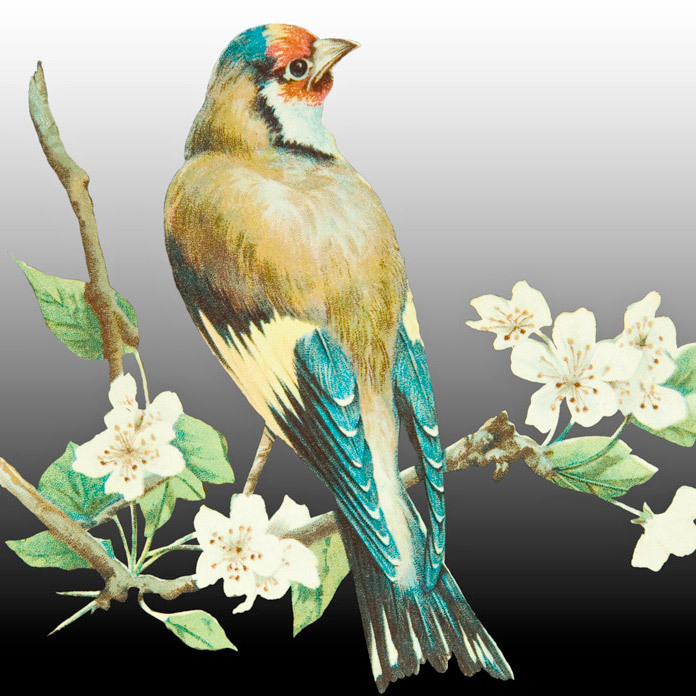 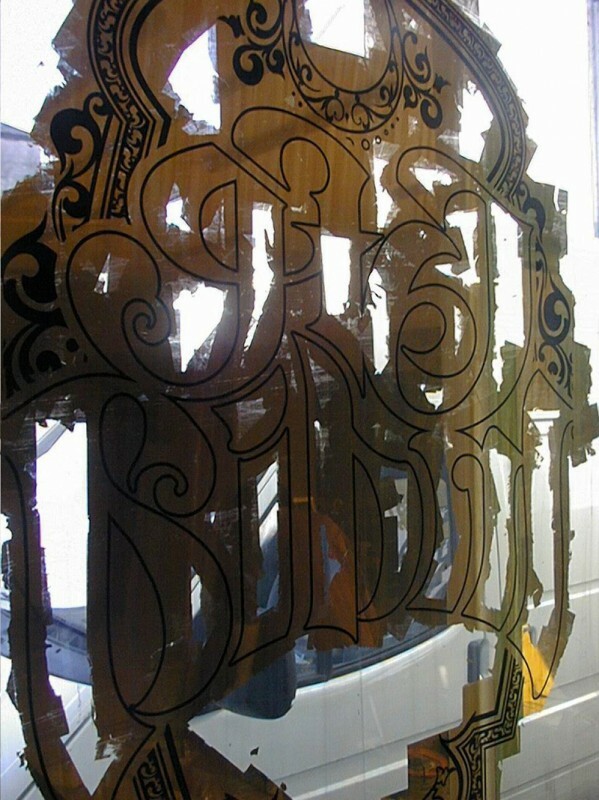 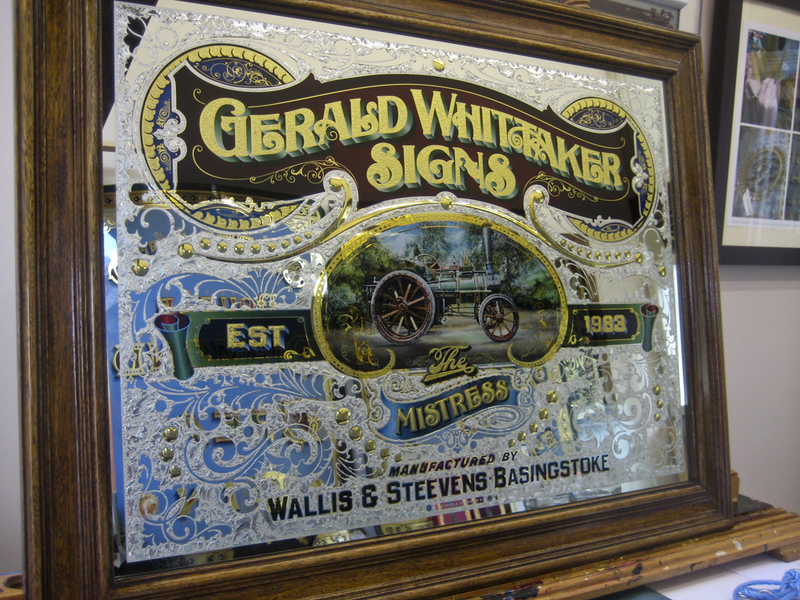 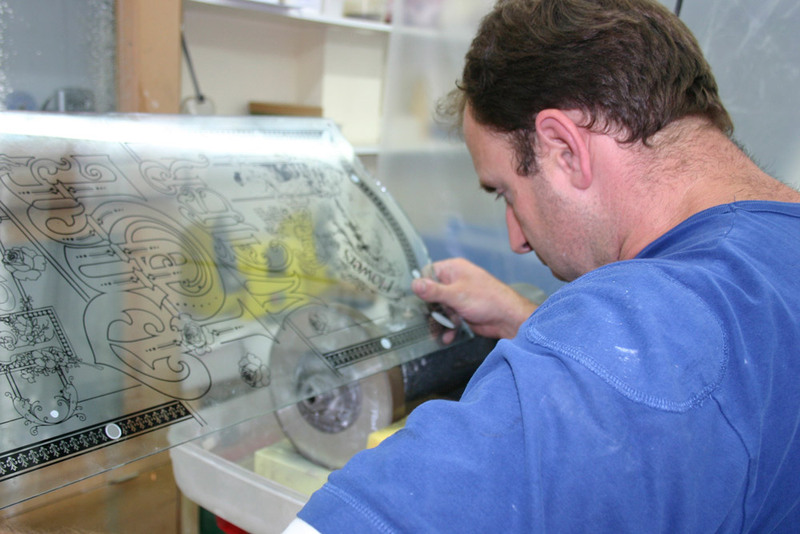 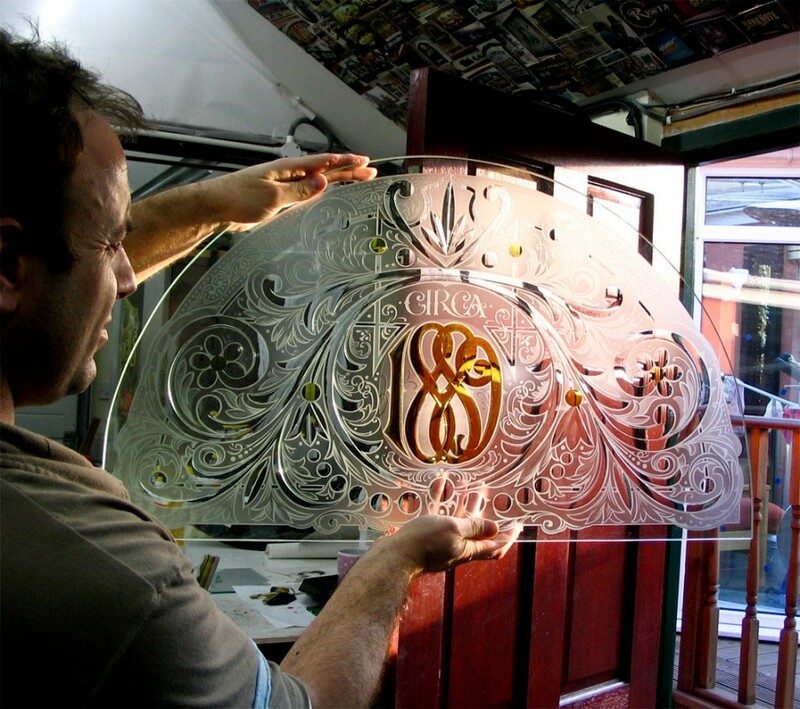 This Victorian glass sign was made for a traditional craftsman who is passionate about his trade. 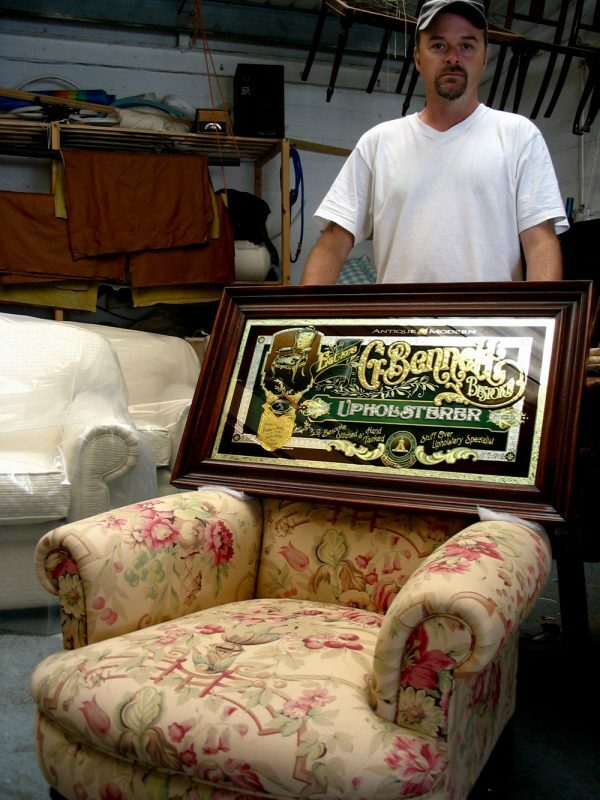 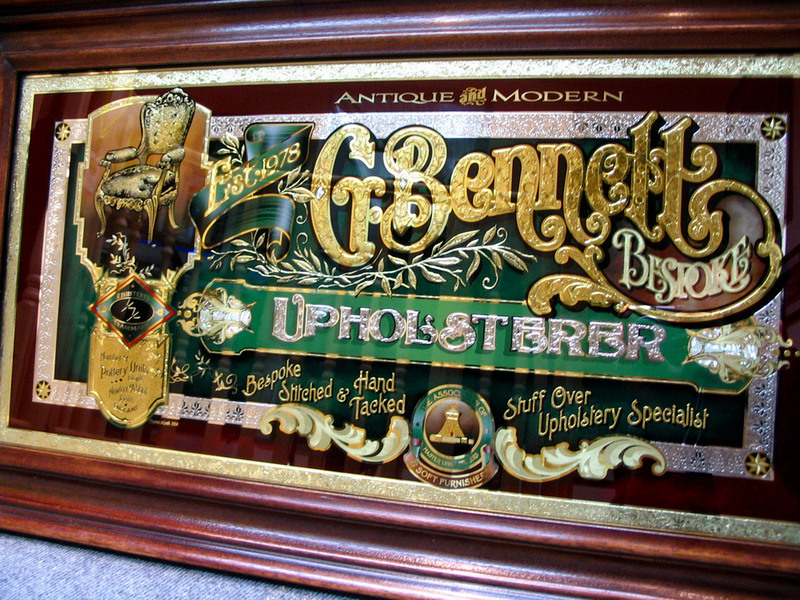 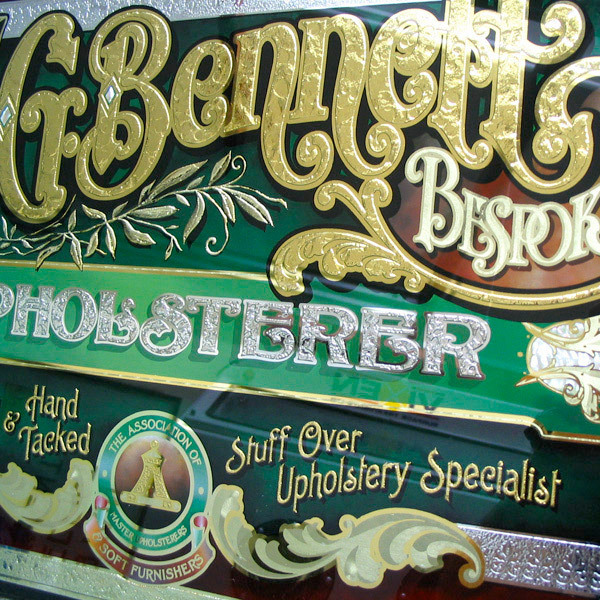 Geoff Bennett runs a small one-man Upholstery business in Newton Abbott, Devon. 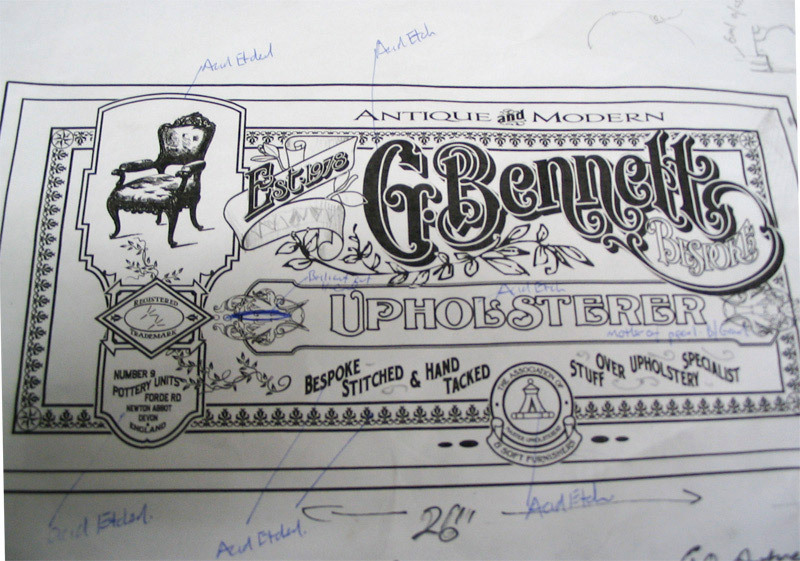 He specialises in bespoke upholstery and motorbike seat covers. 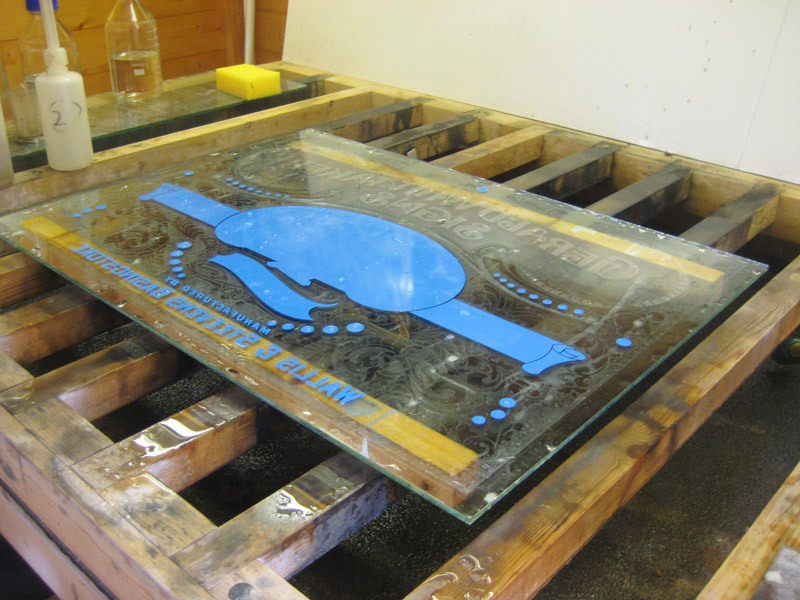 He asked me to design and make him a glass sign advertising his business. 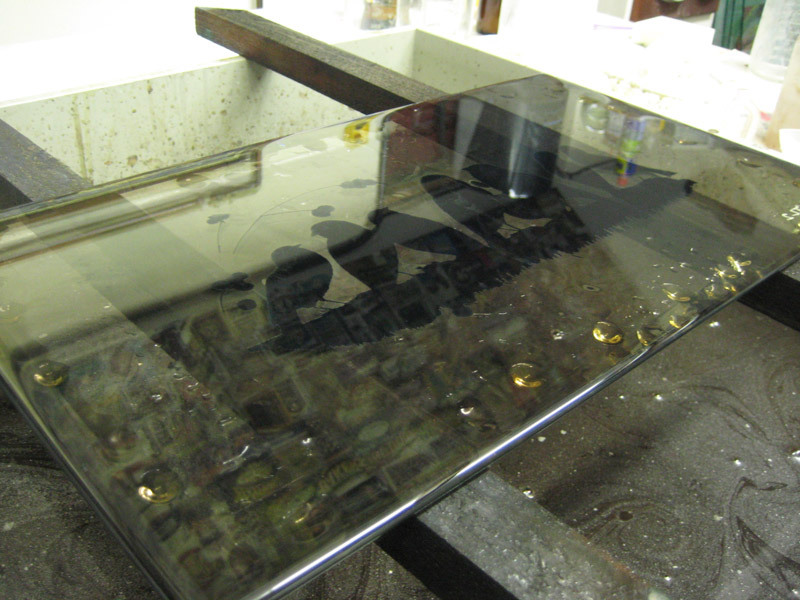 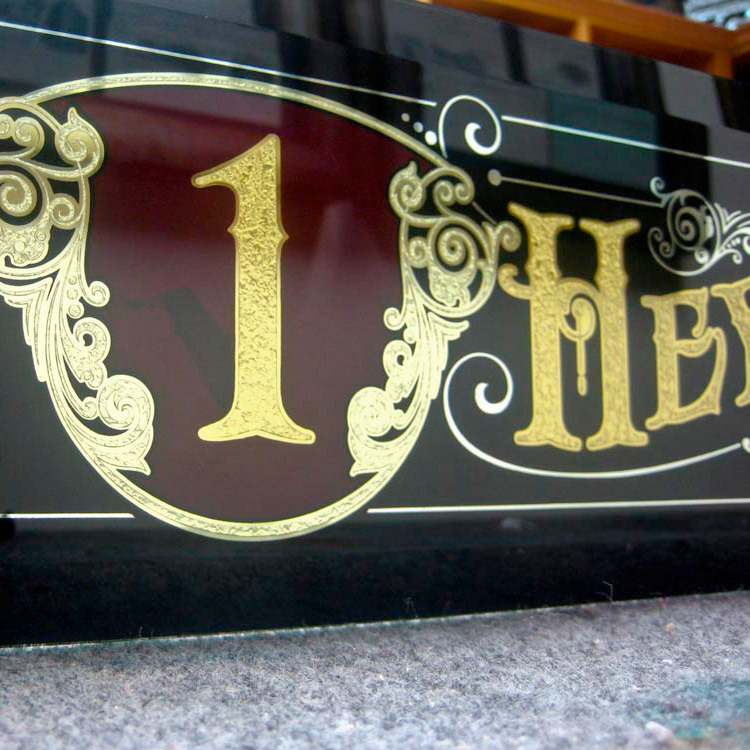 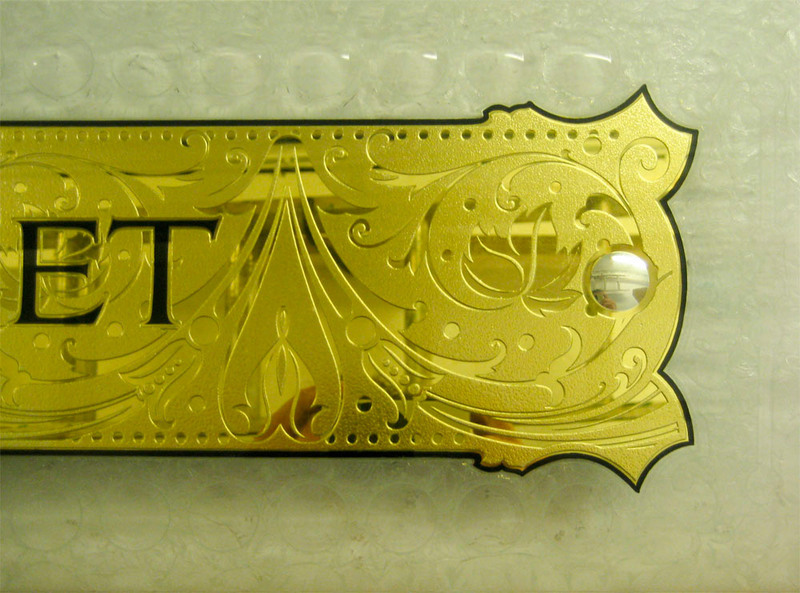 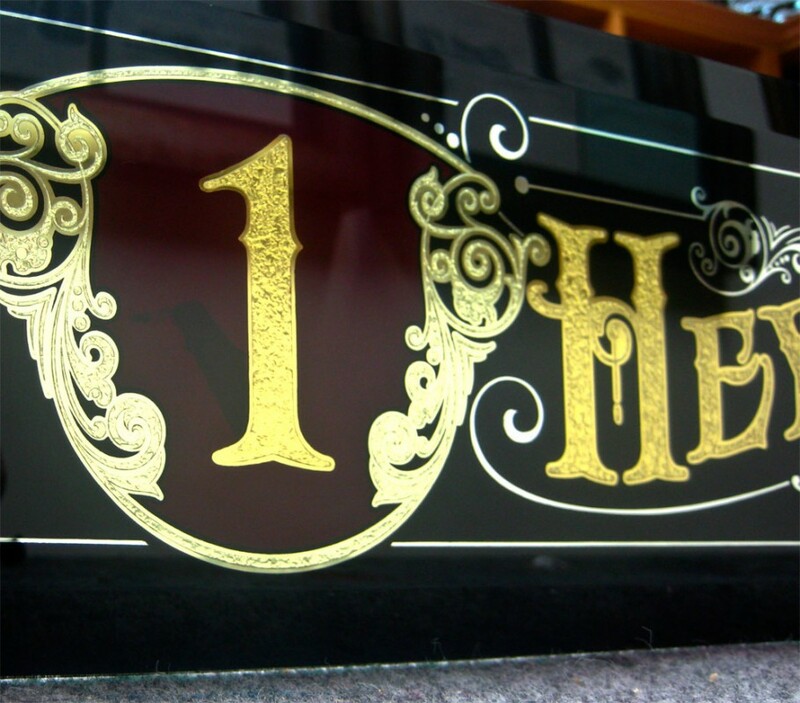 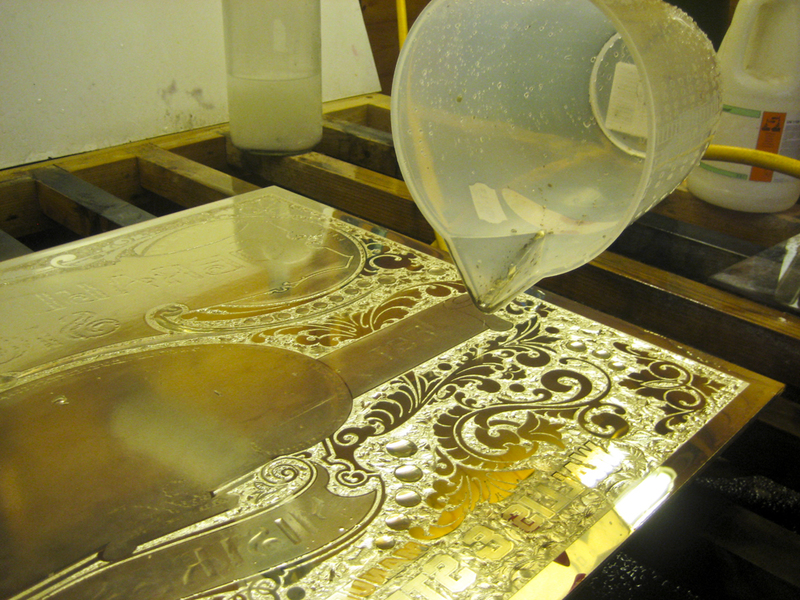 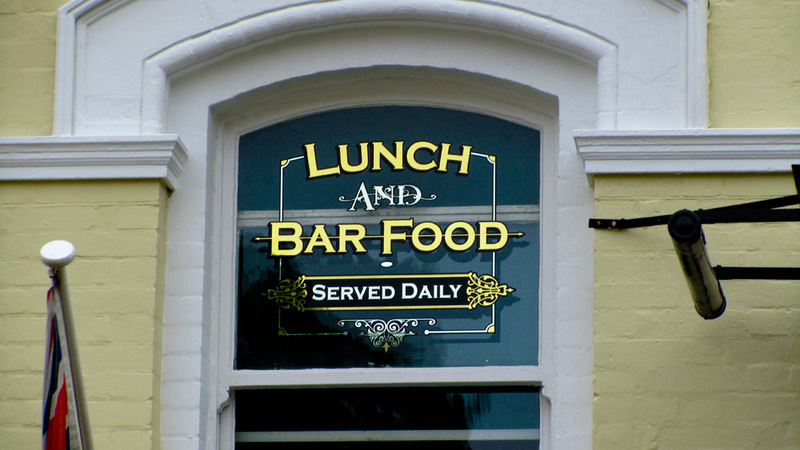 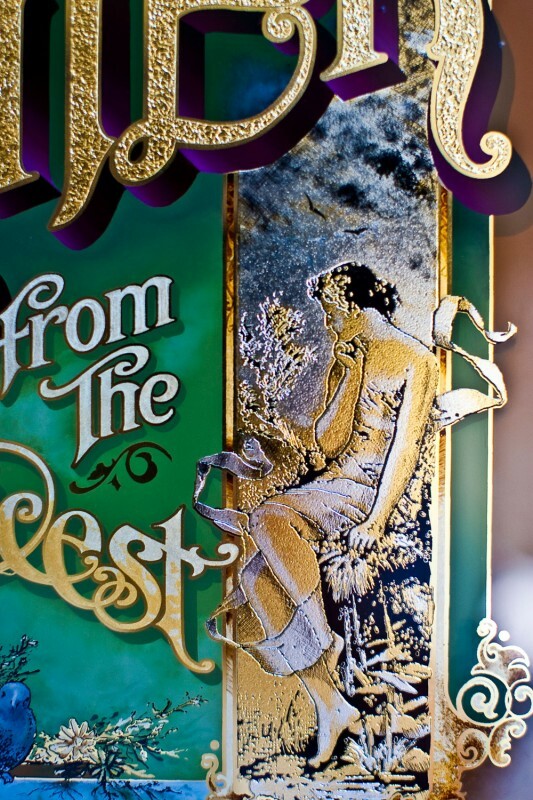 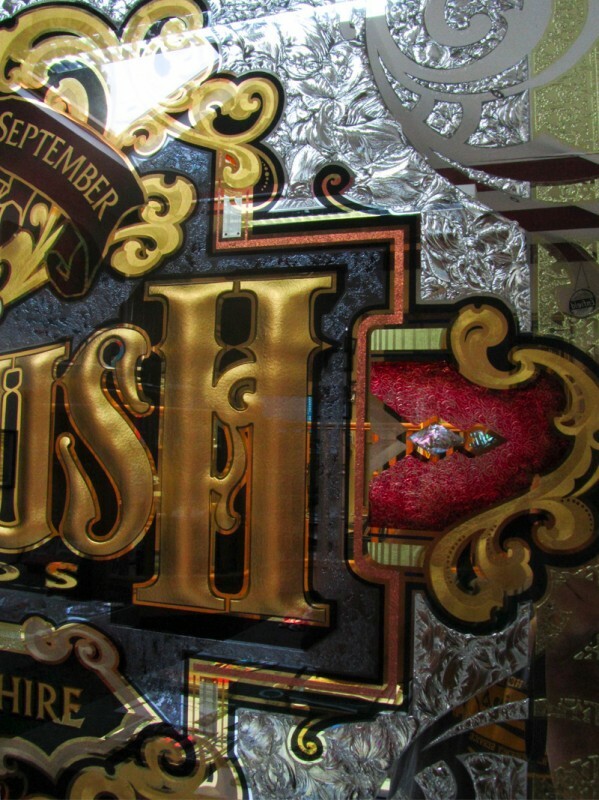 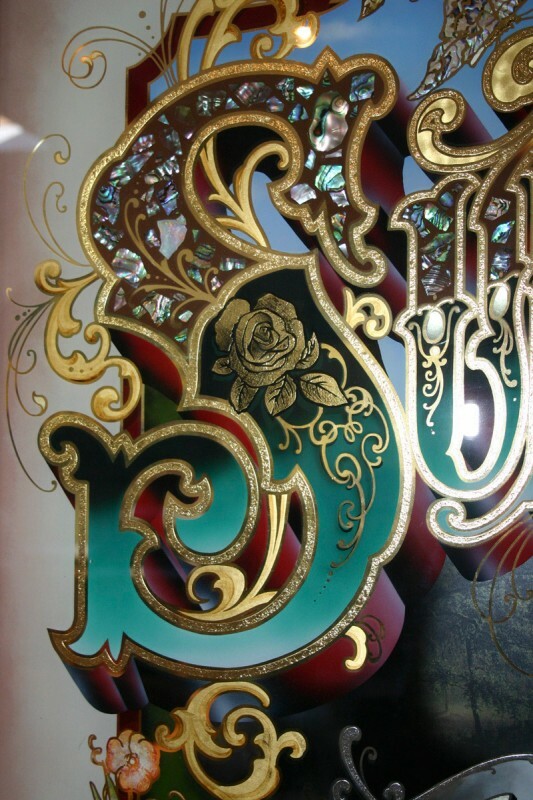 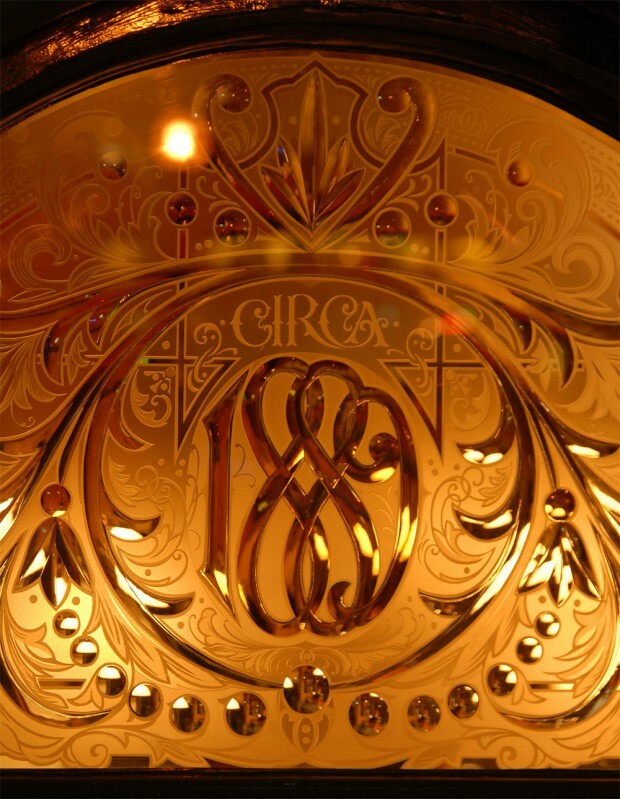 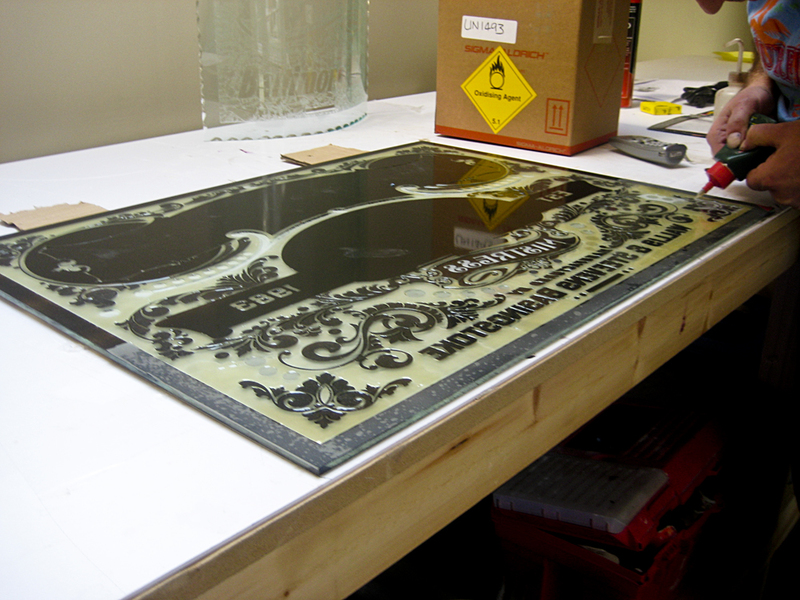 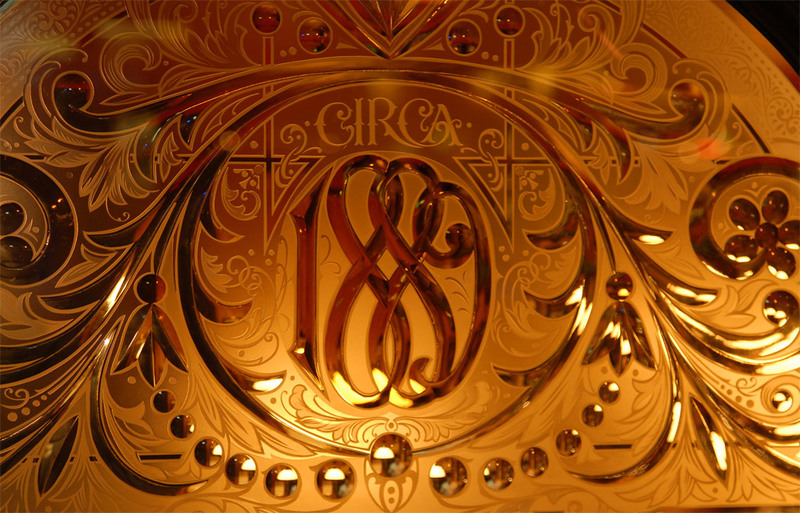 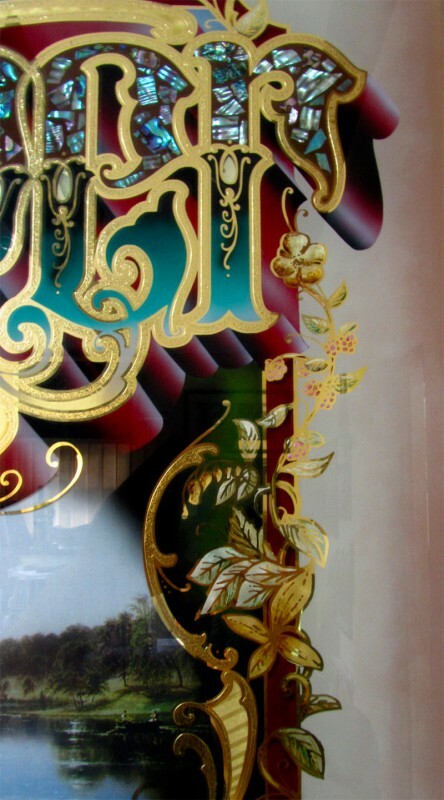 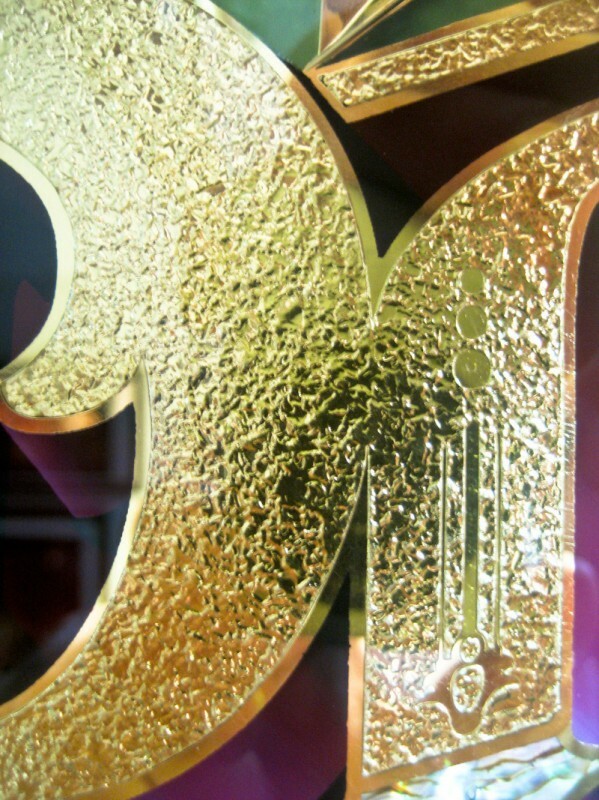 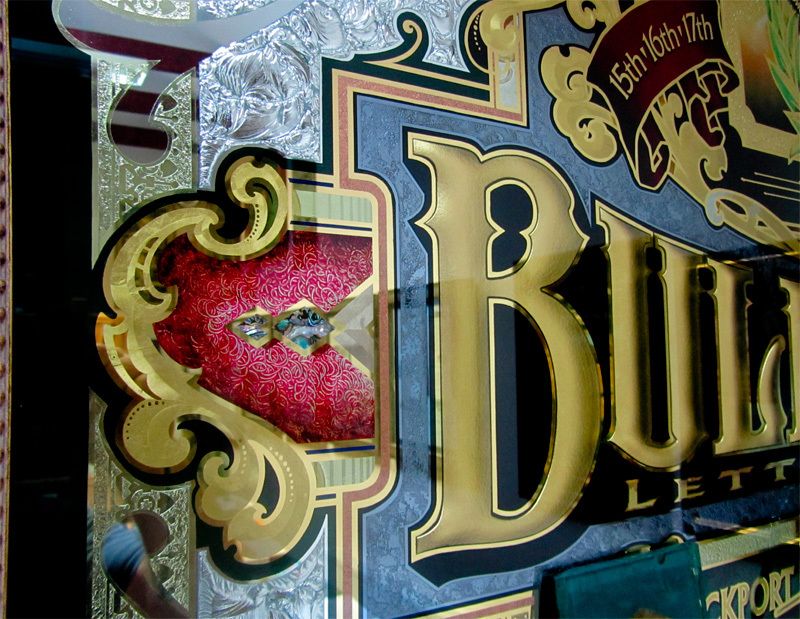 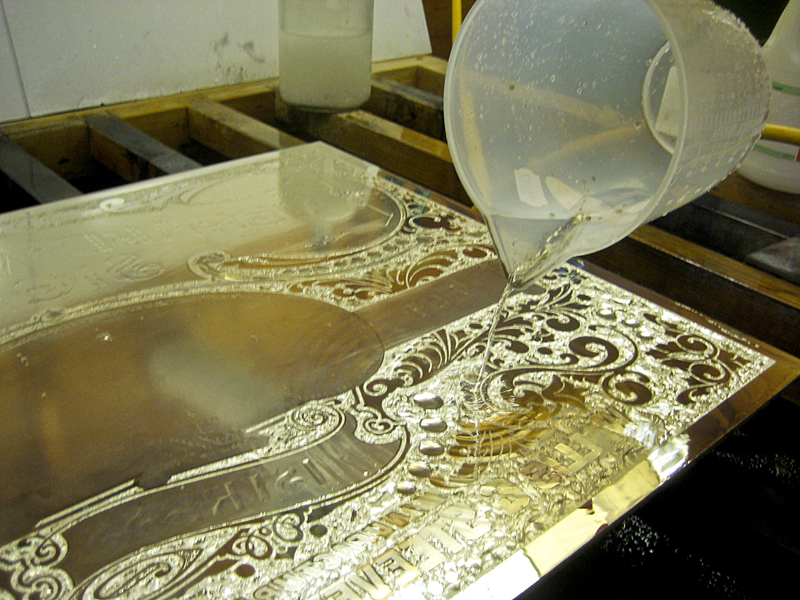 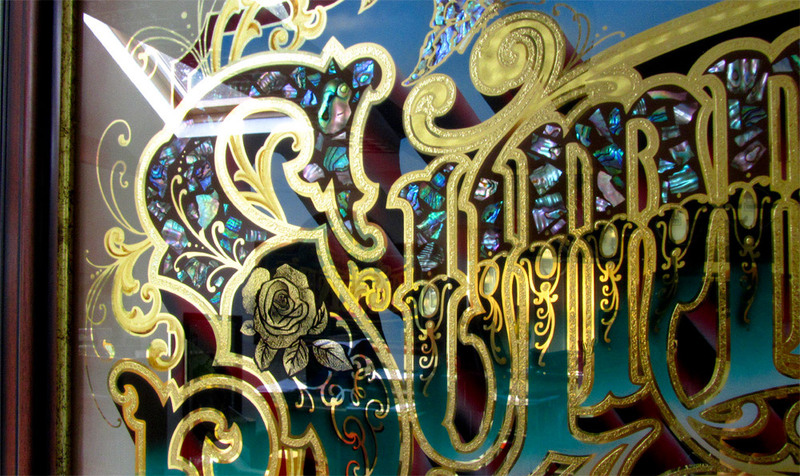 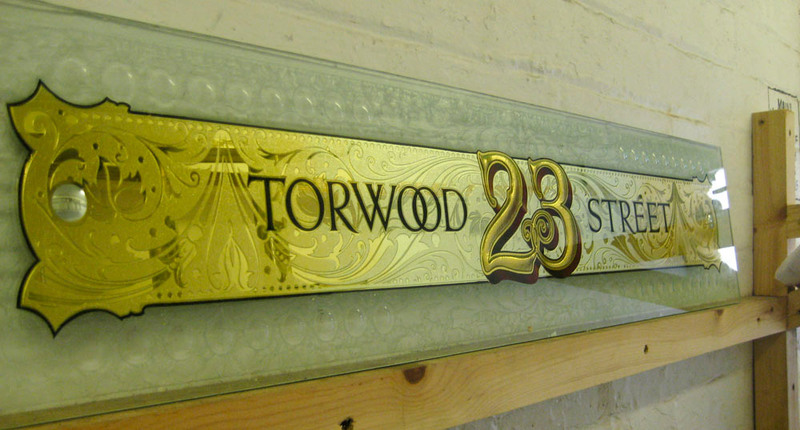 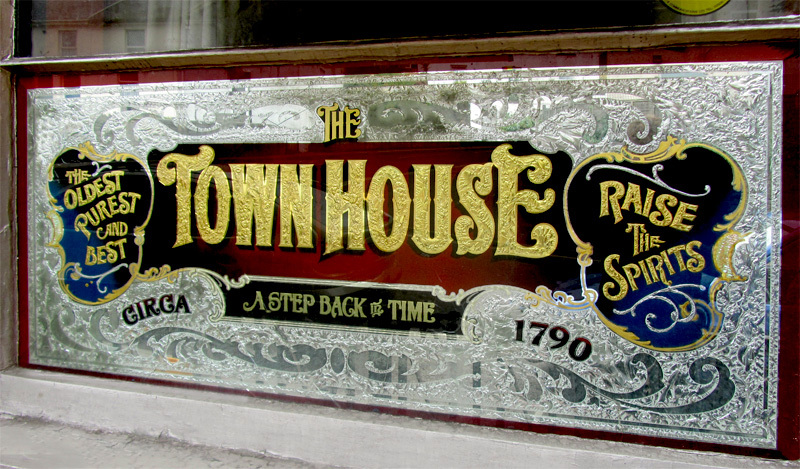 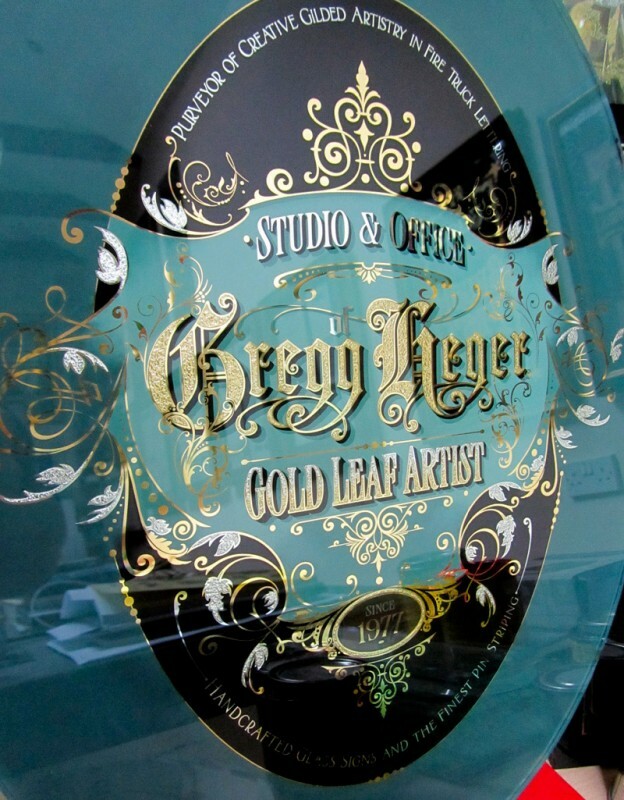 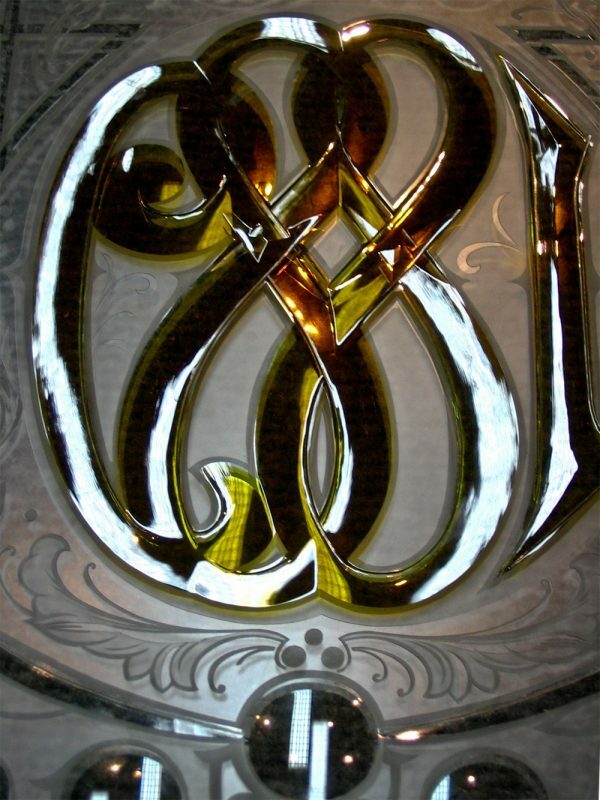 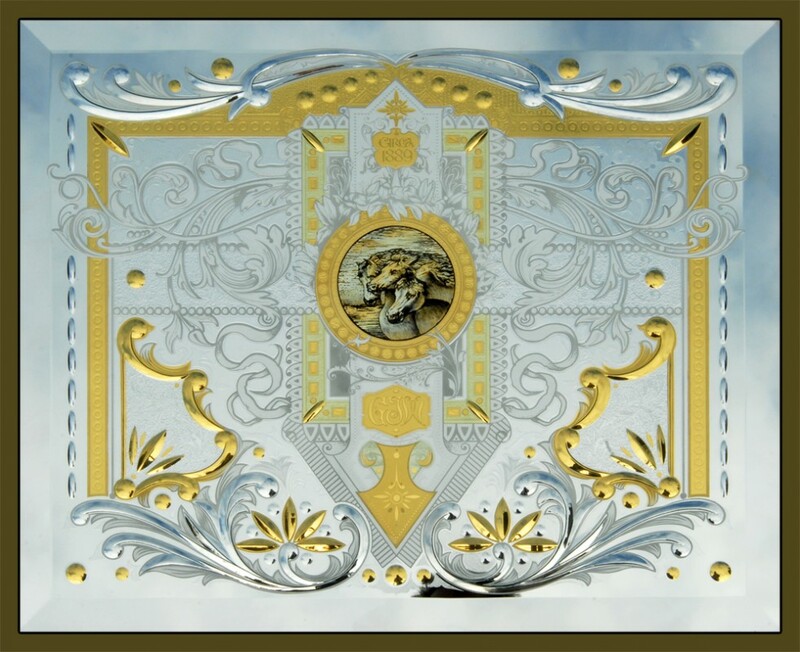 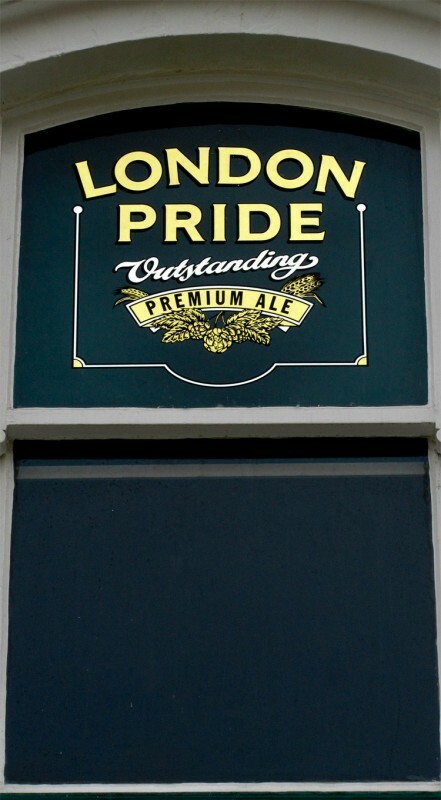 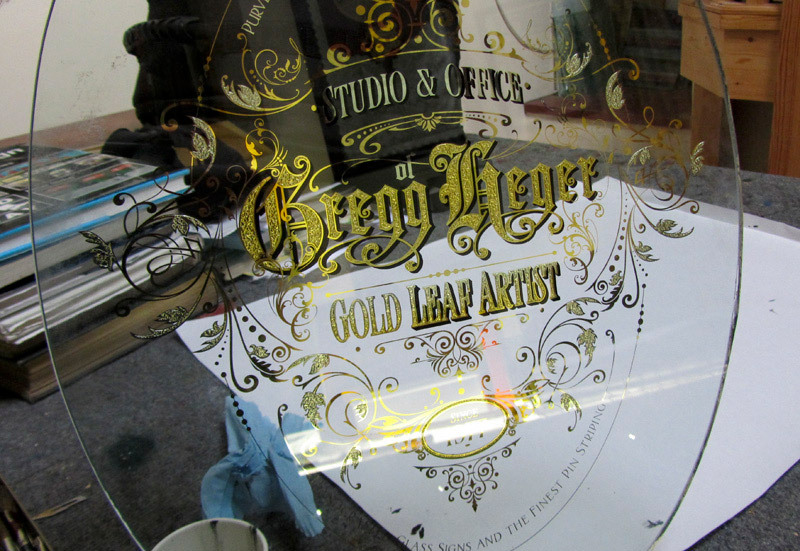 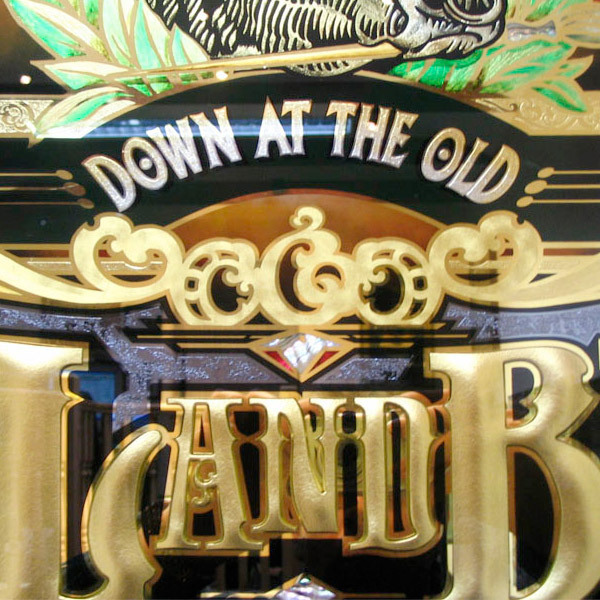 This glass sign is 28"x 18" and entails the use of 24crt, 22crt, 16crt and 12crt gold leaf. 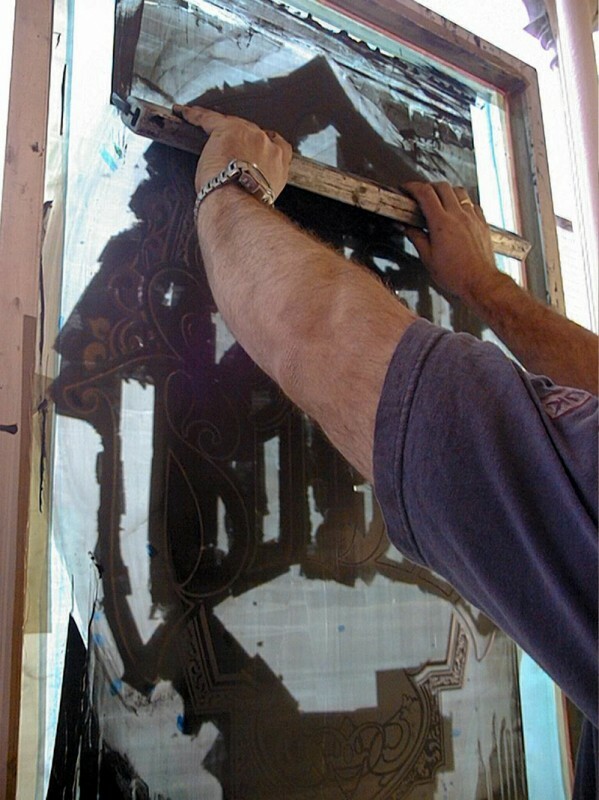 The letters were sponge stippled with emulsion paint, then submerged upside down in a bath of acid for 30 minutes. 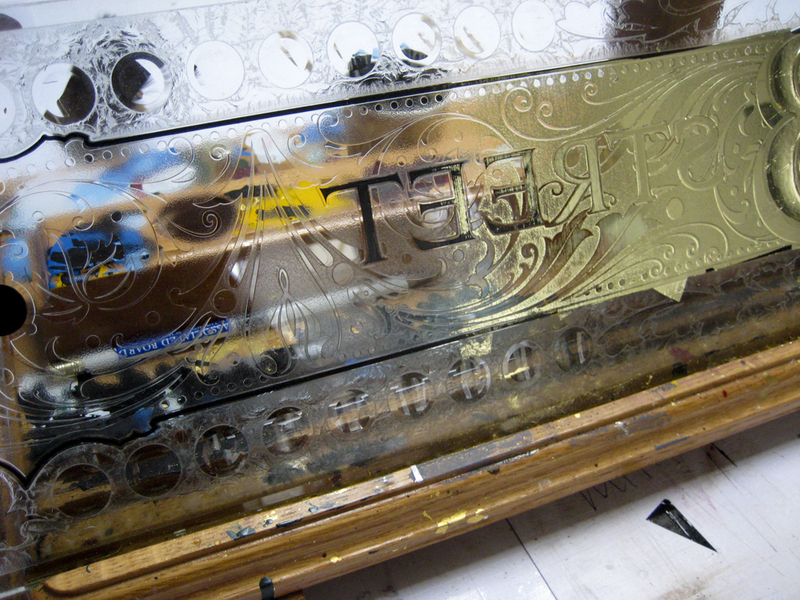 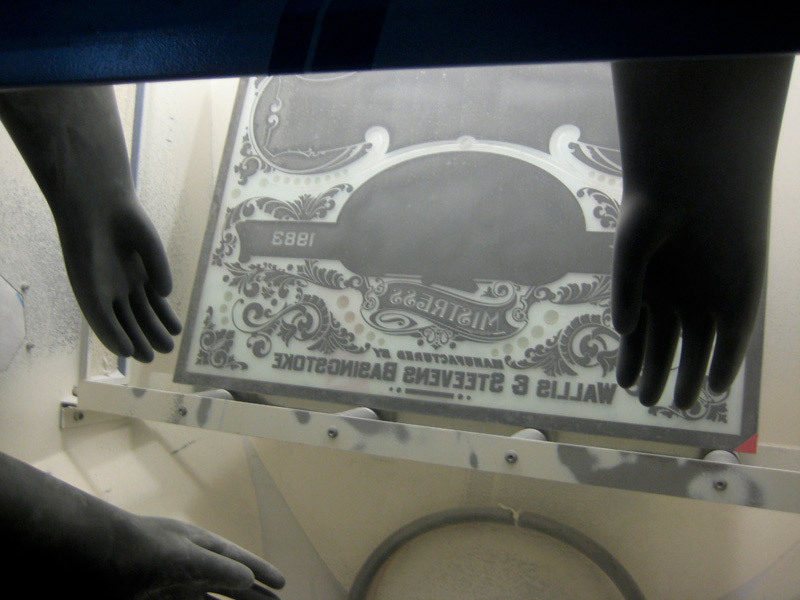 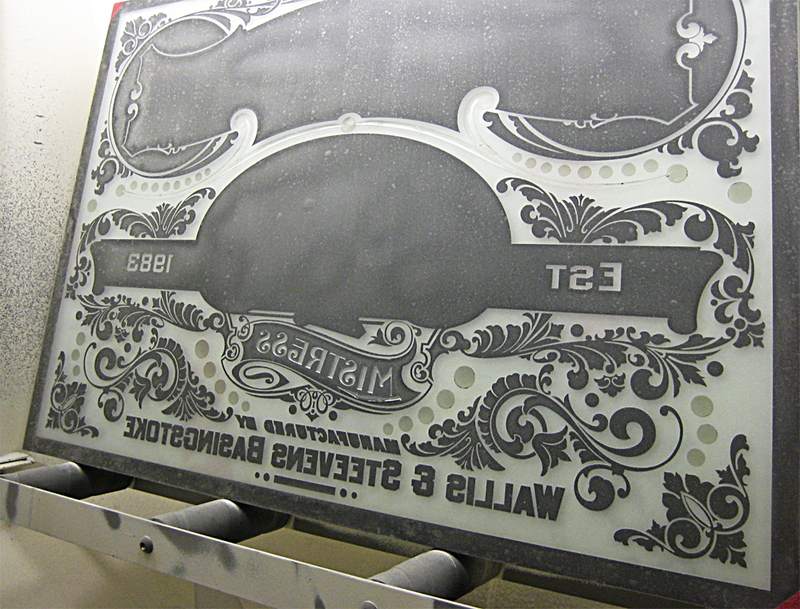 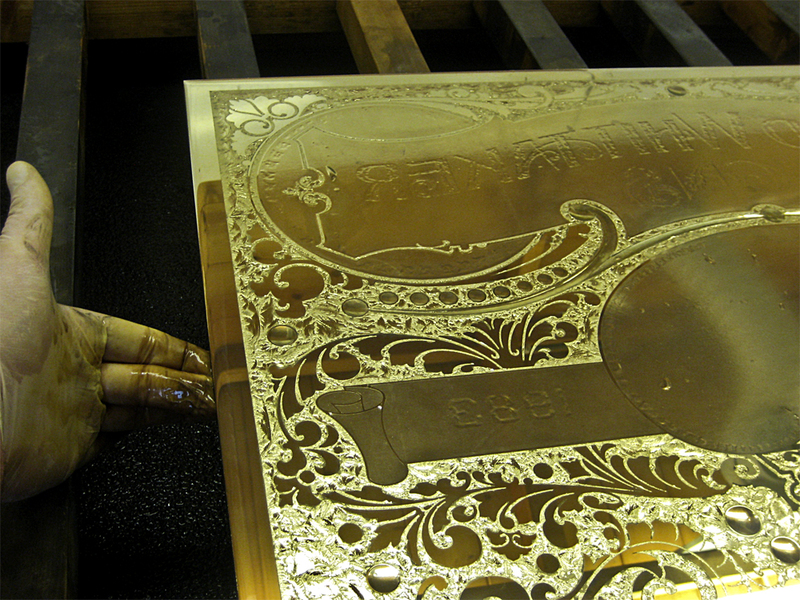 The emulsion broke down after 10 minutes, exposing other areas to acid causing irregular etching to the letters. 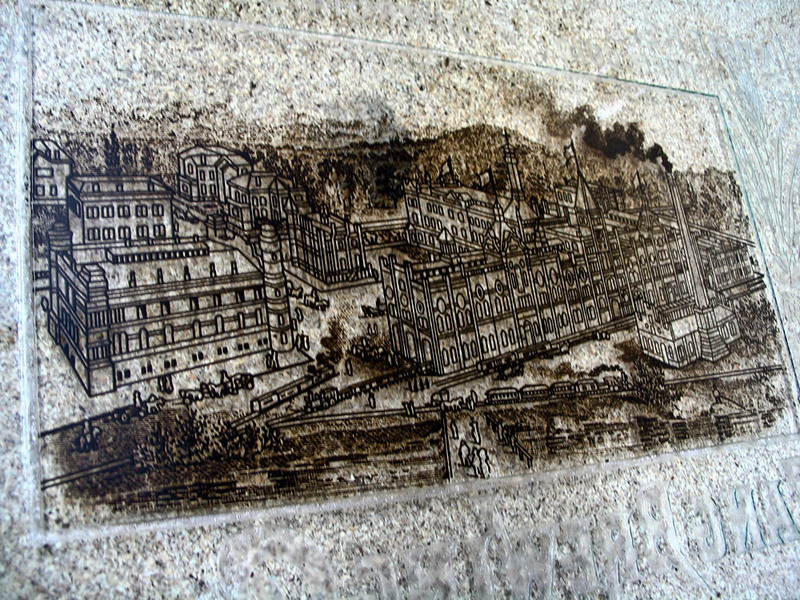 Other acid treatments were made using mica and cross hatching techniques within the illustration. 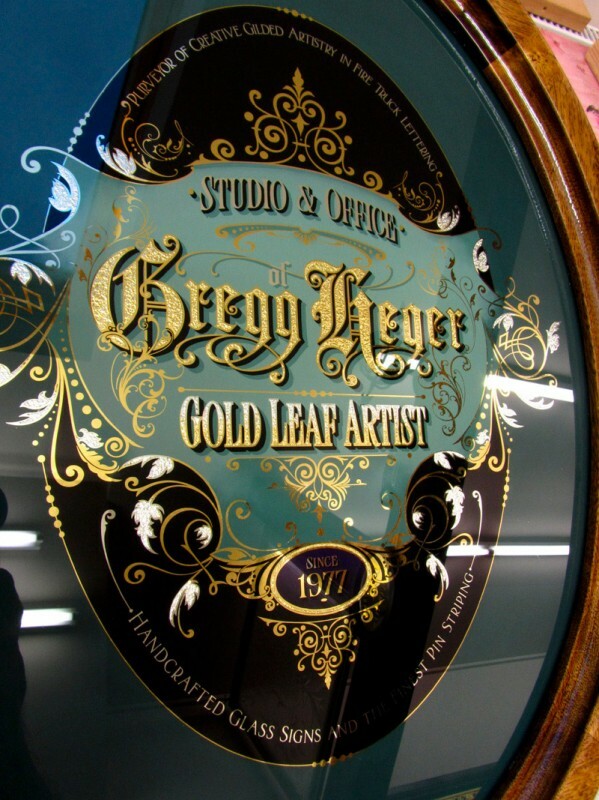 Mother of pearl, shading and finger blending was also used. 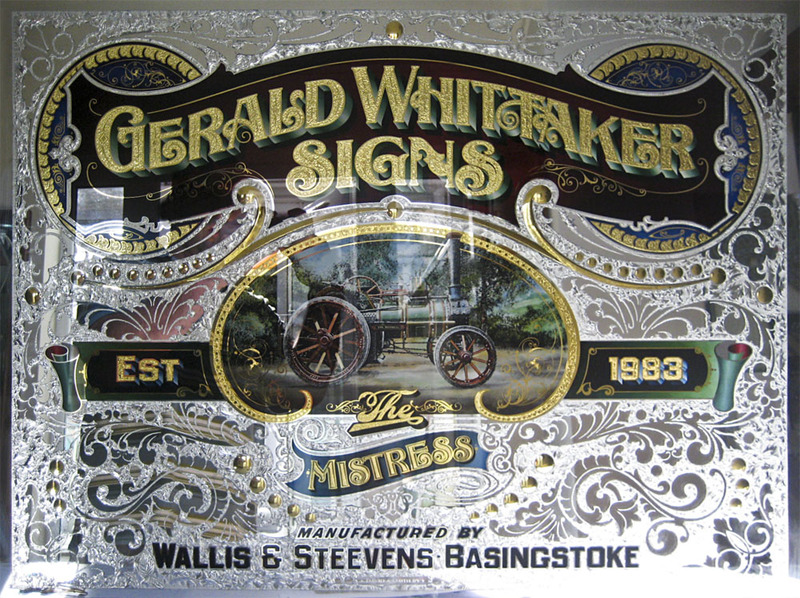 The sign was made in 2004. 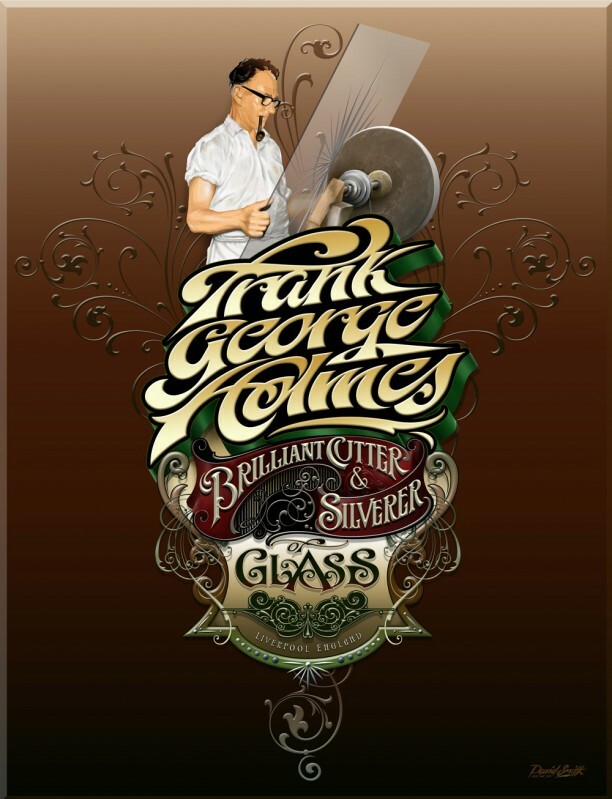 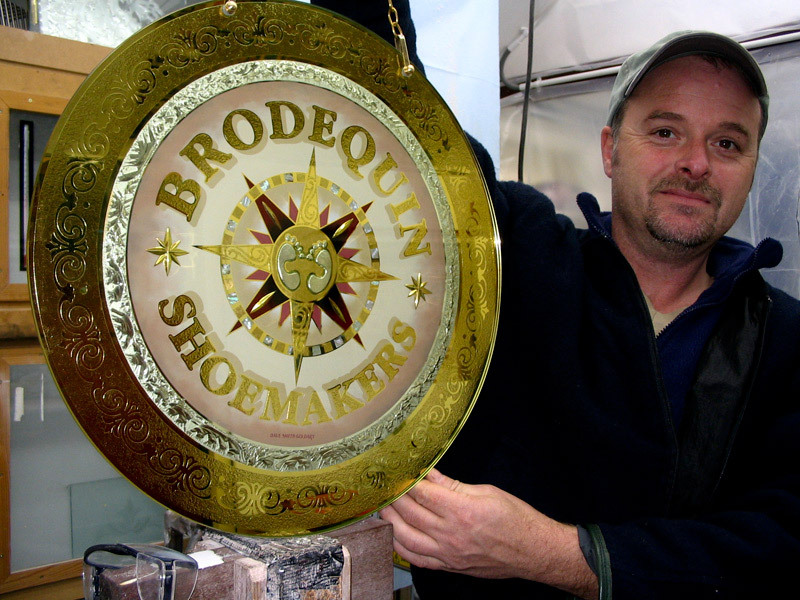 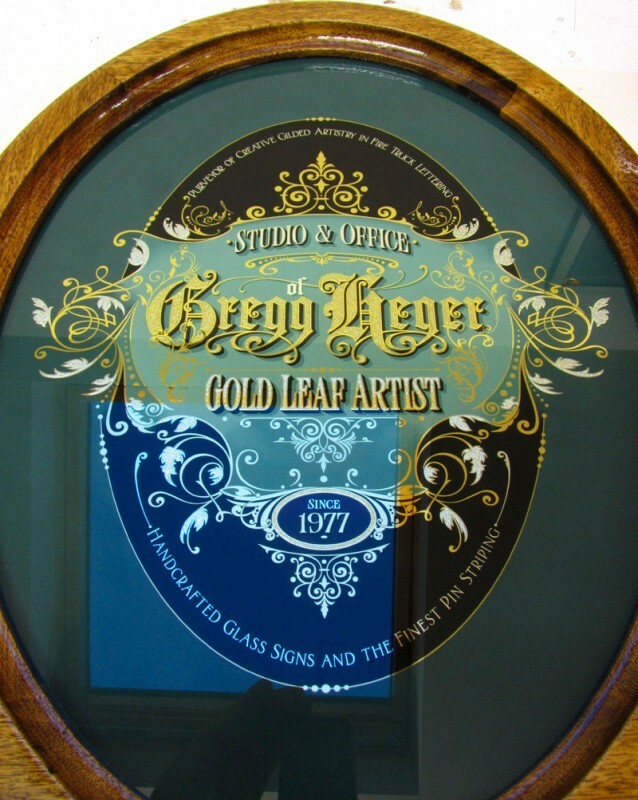 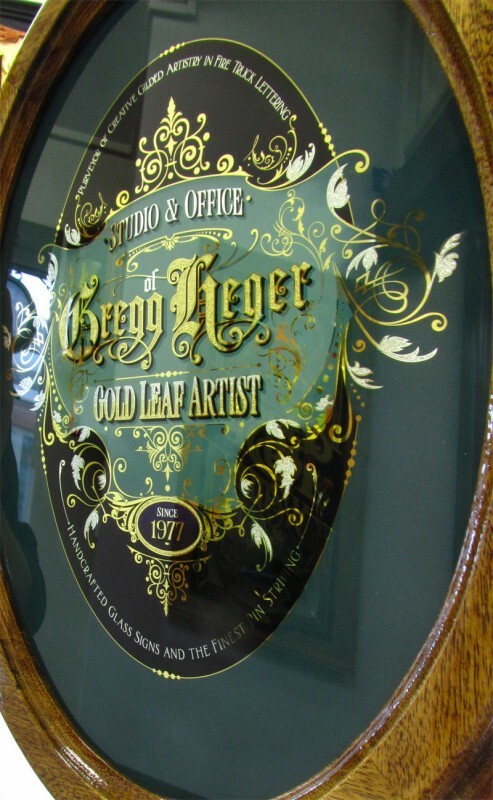 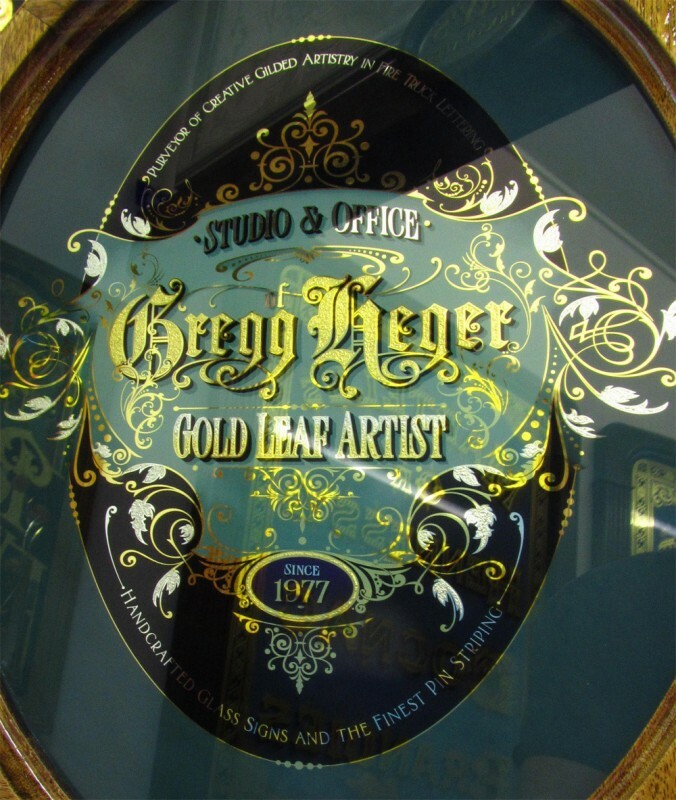 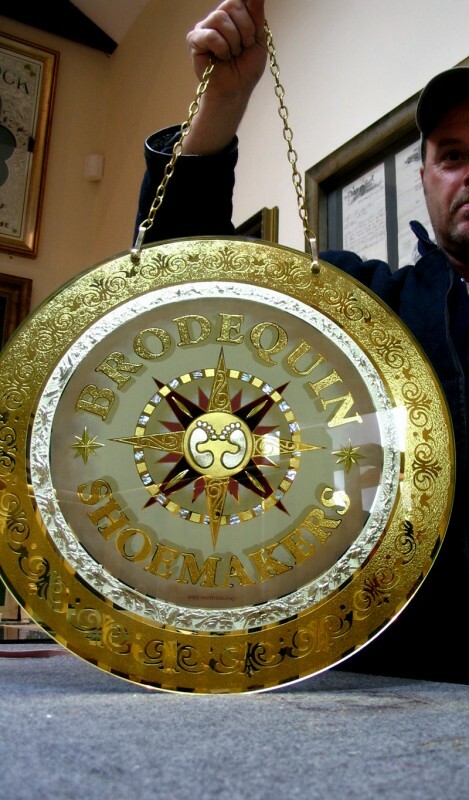 This oval glass Sign was made for a good friend named Gregg Heger in Boston, Mass, USA in 2010. 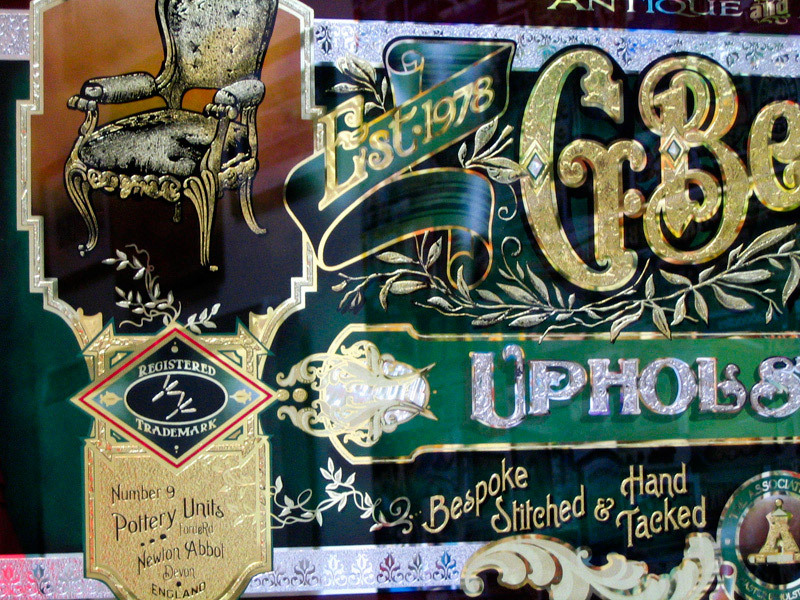 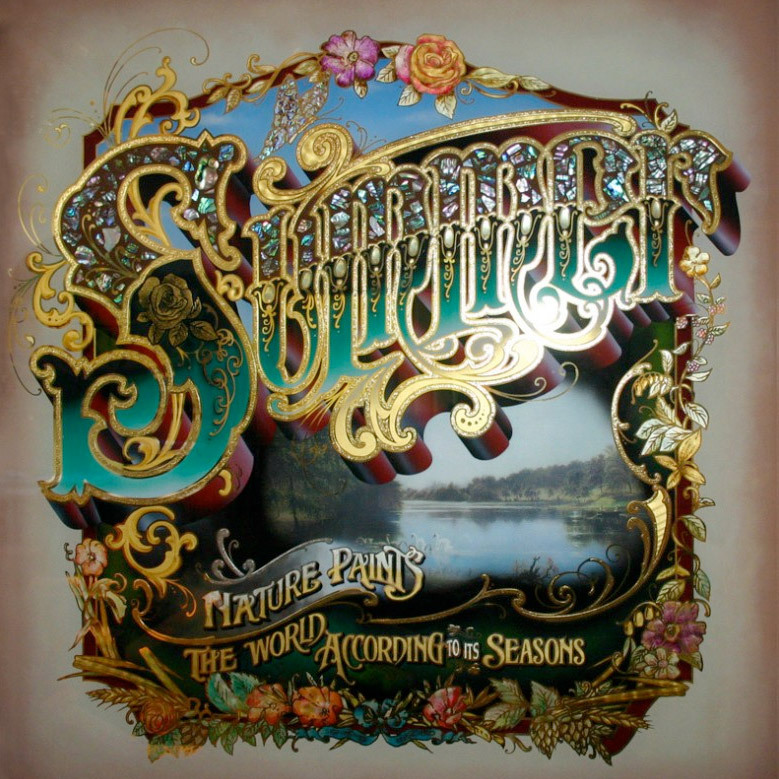 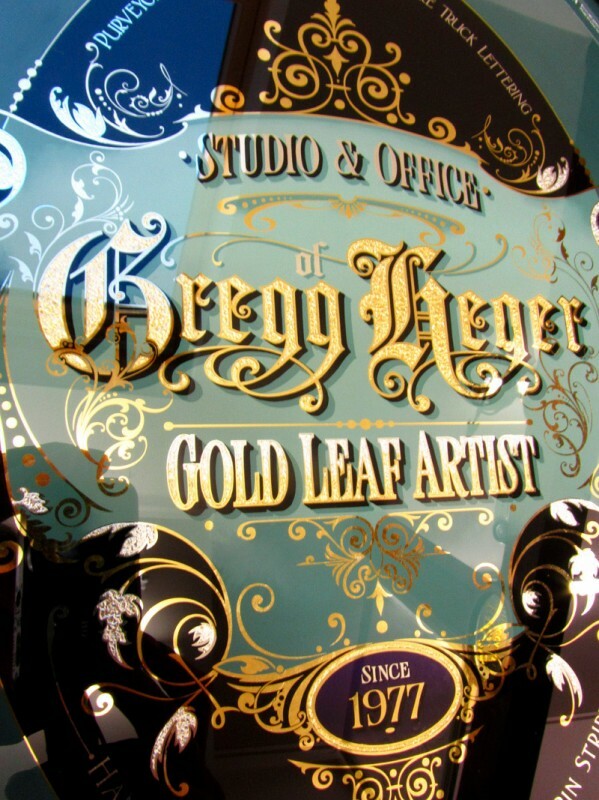 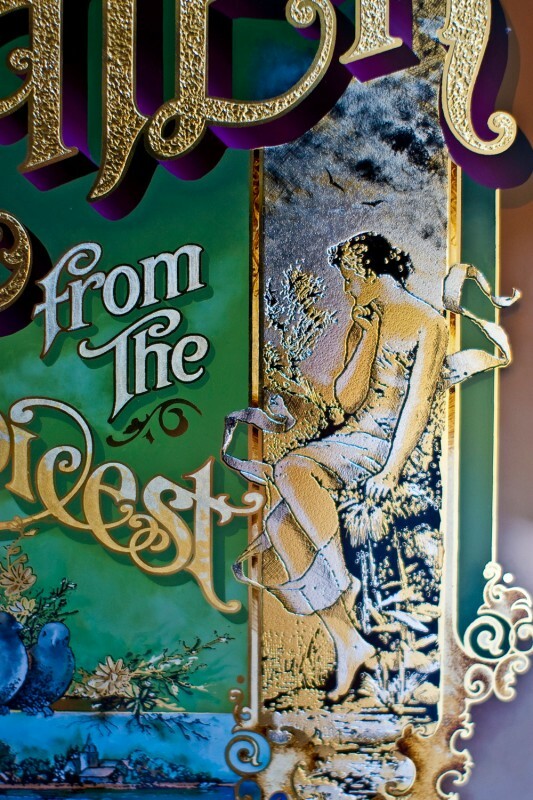 The techniques used to make this sign were acid mica stippled letters and the scrolled leaves were embossed, 23crt Gold Leaf and 12crt leaf was used for the letters and scrolls with blended shades. 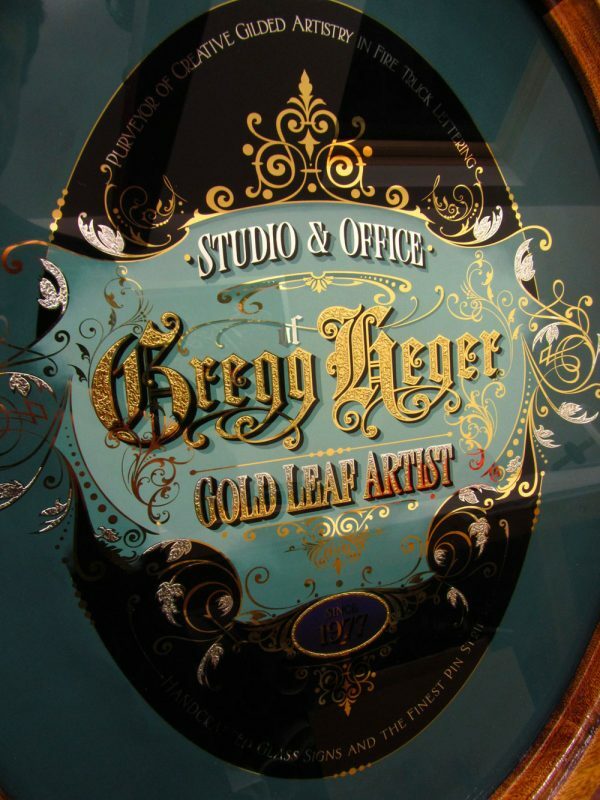 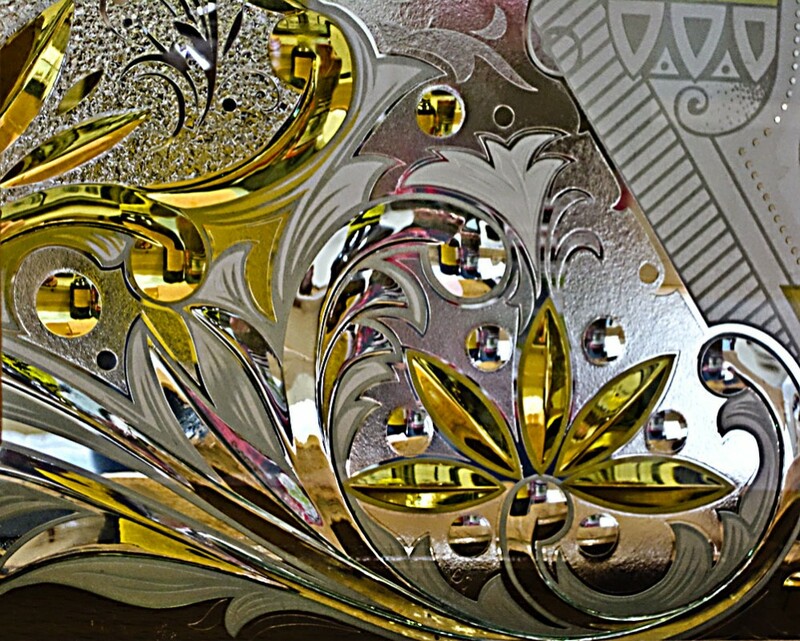 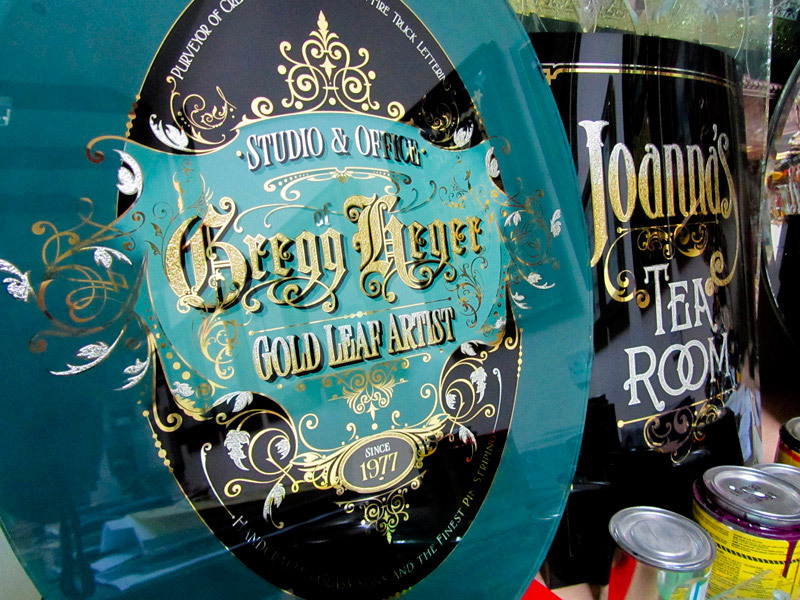 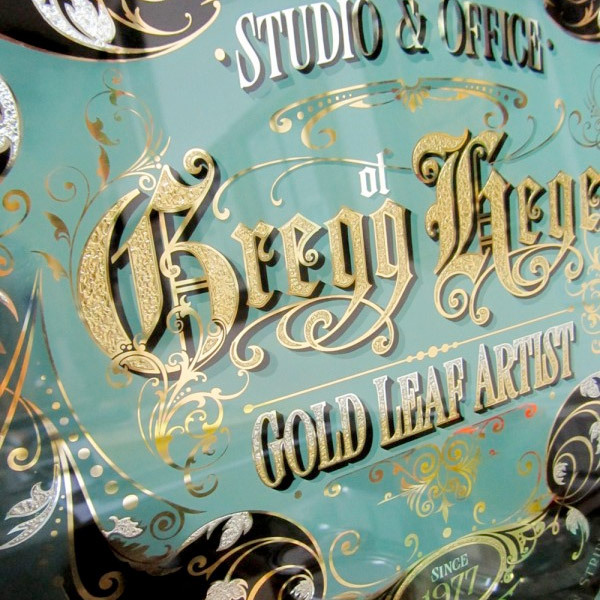 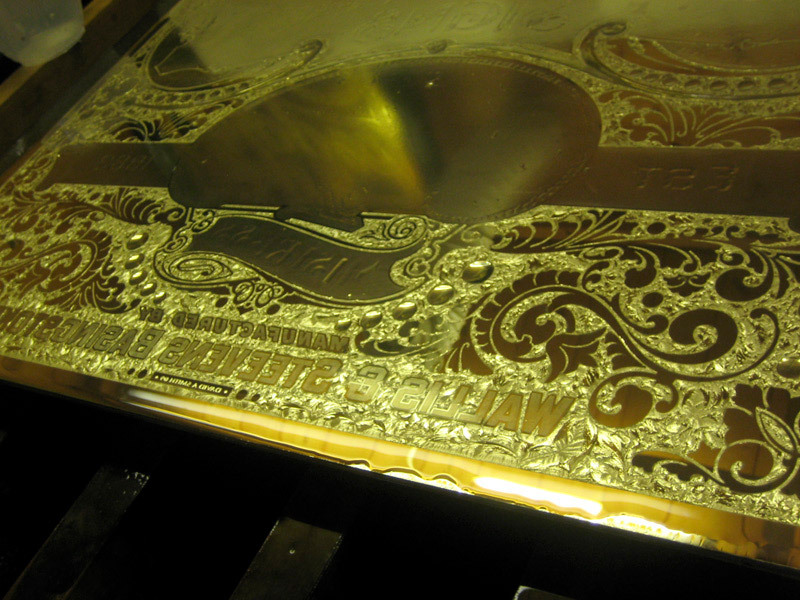 The wording Gold Leaf Artist has a blended effect of gold to silver. 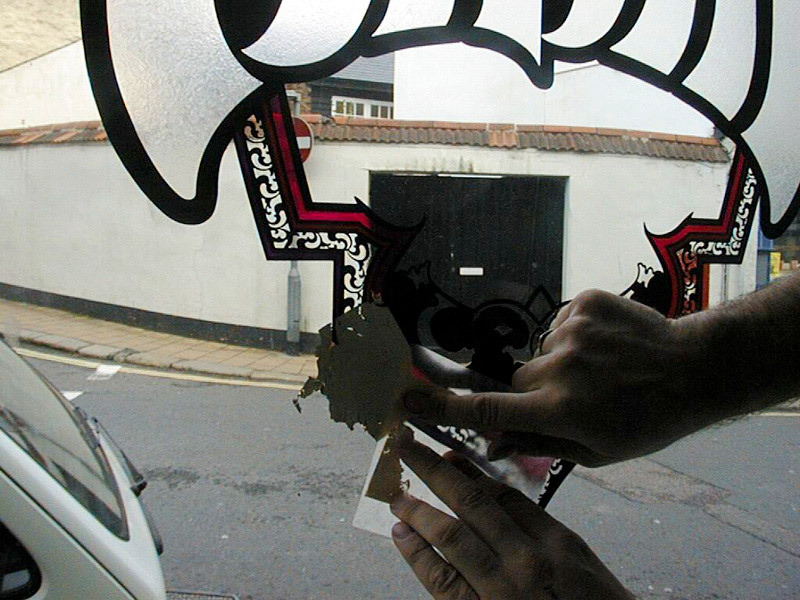 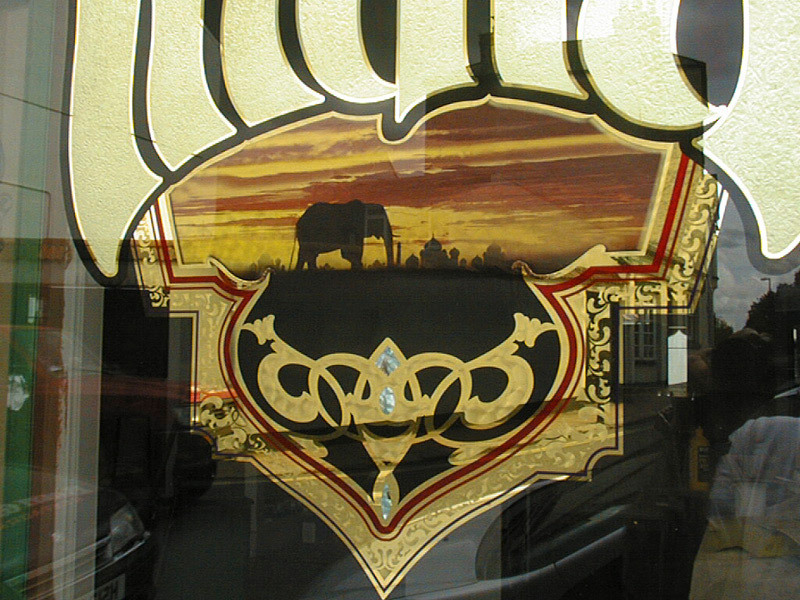 I made this glass advertising sign for a shop window in Teignmouth, Devon. 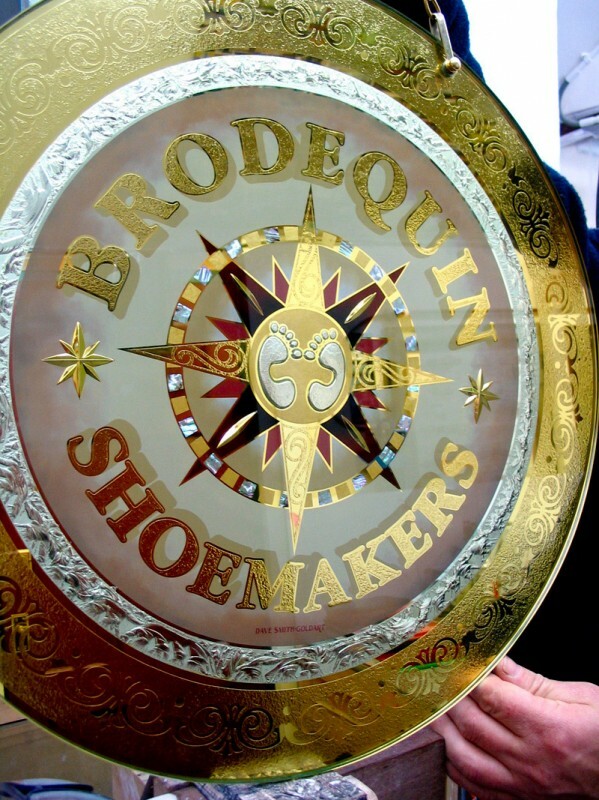 The proprietors make the most wonderful hand crafted shoes. 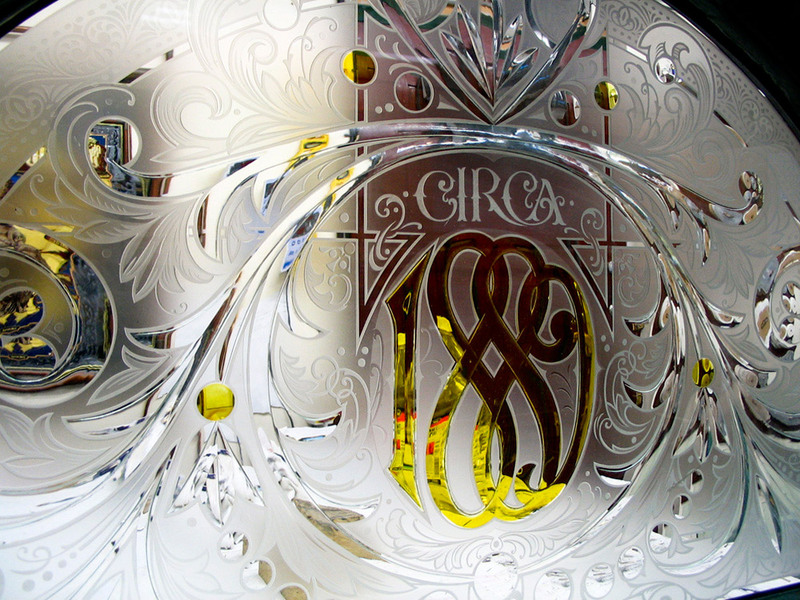 They had there own design and I built it into a circle of glass. 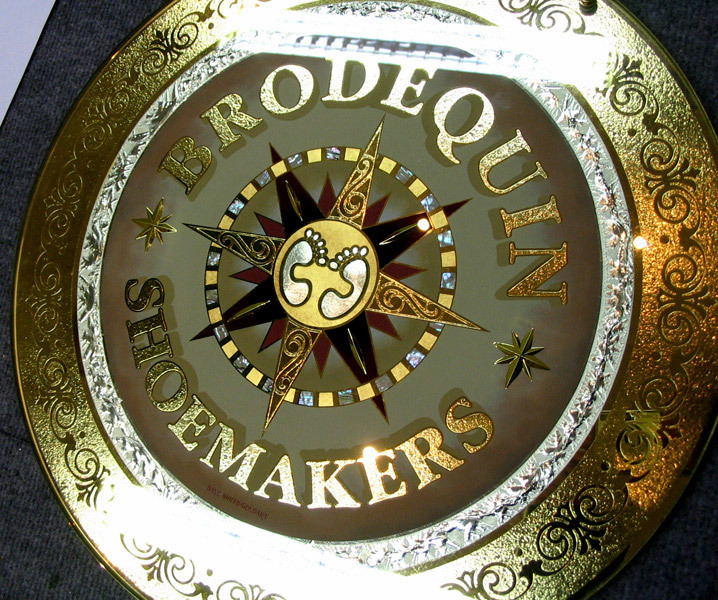 The outer ring with scrolls is acid etched, the feet are deep sandblasted and water gilded with 18crt gold. 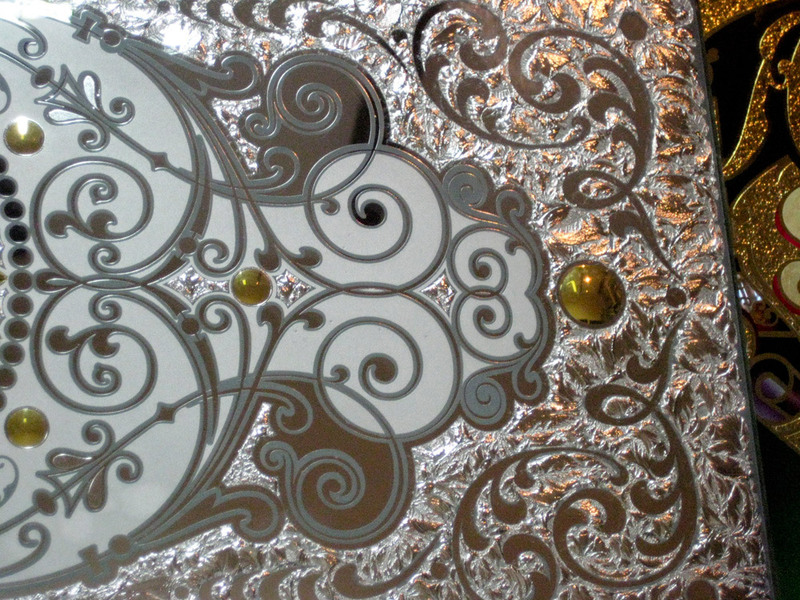 Mother of pearl is round the inside border and the silver line is 12crt gold and glue chipped. 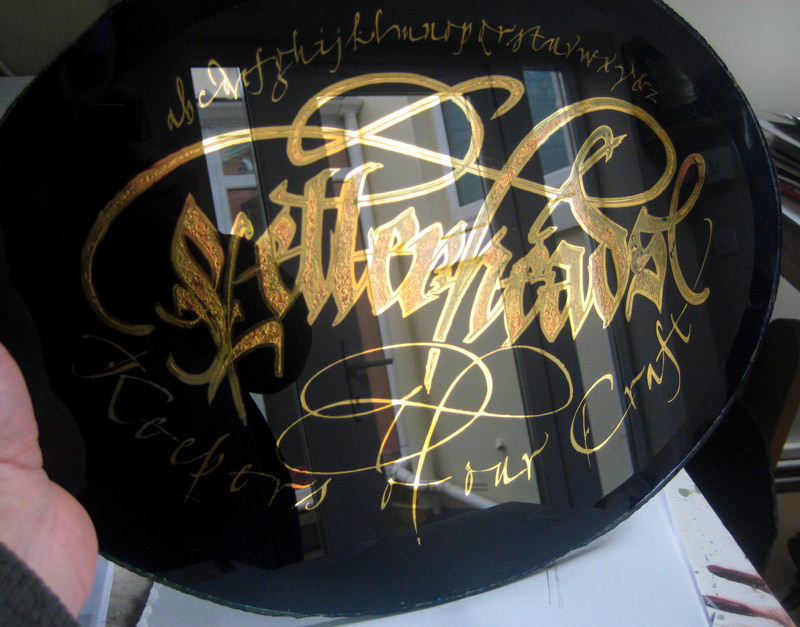 The background is hand sign written and finger blended. 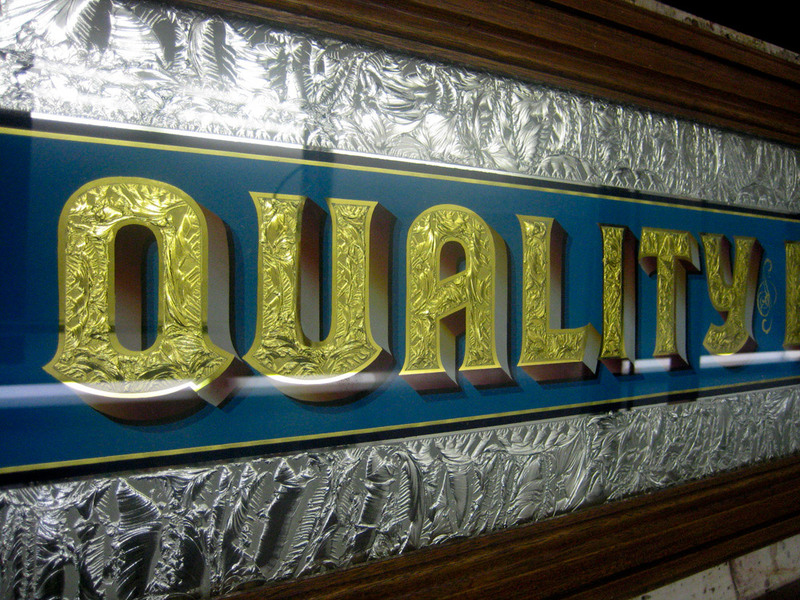 This sign was made in 2004. 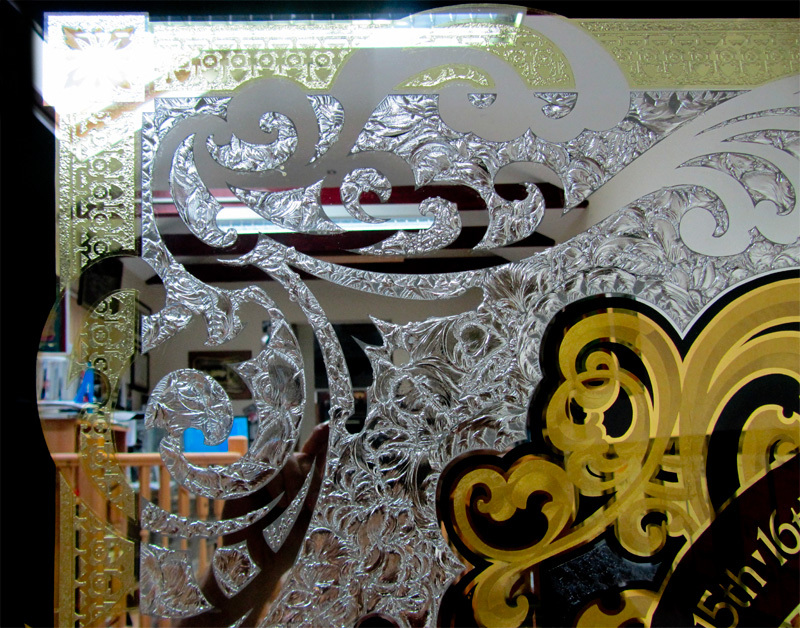 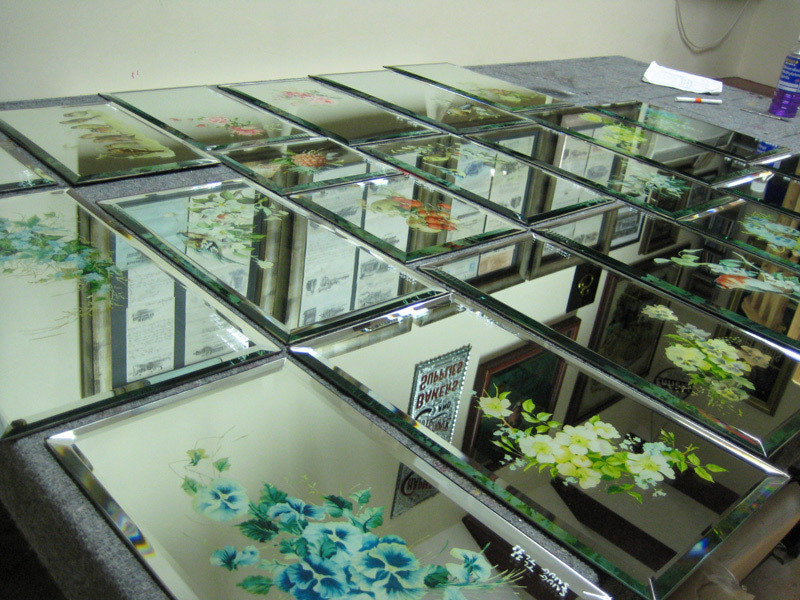 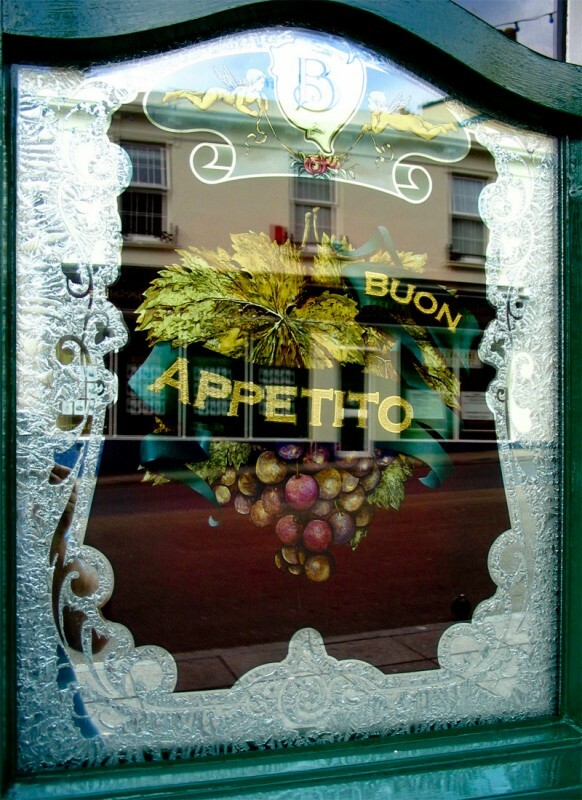 5 glass panels commissioned by Biancos Restaurant Torquay in 2004. 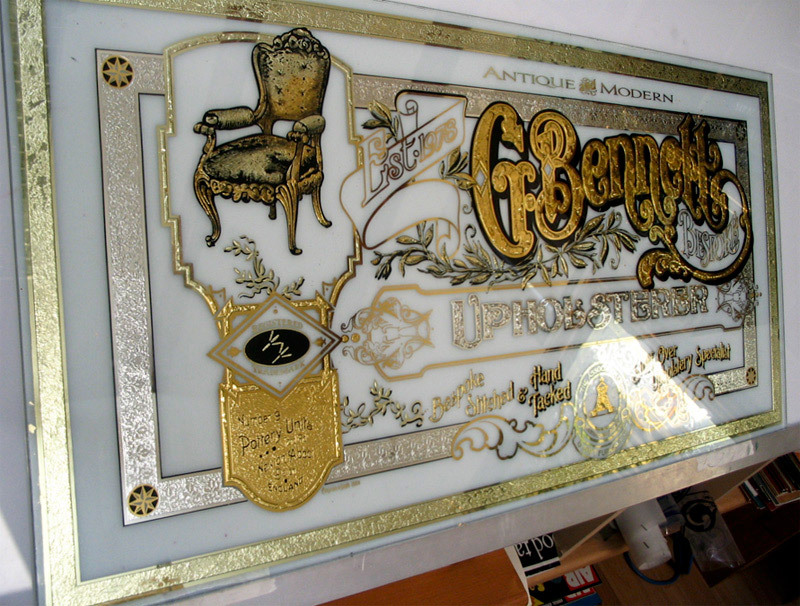 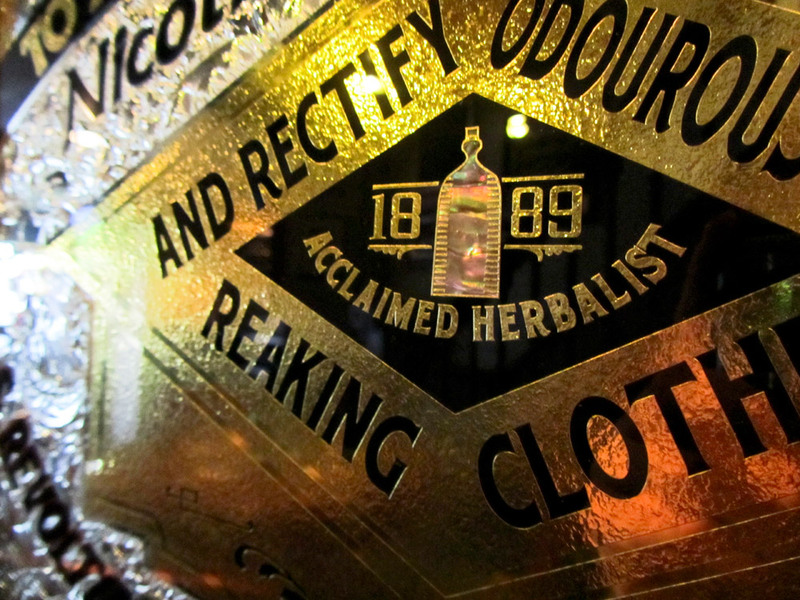 Heavily glue-chipped, silvered, gilded and hand-painted on the reverse side of the glass. 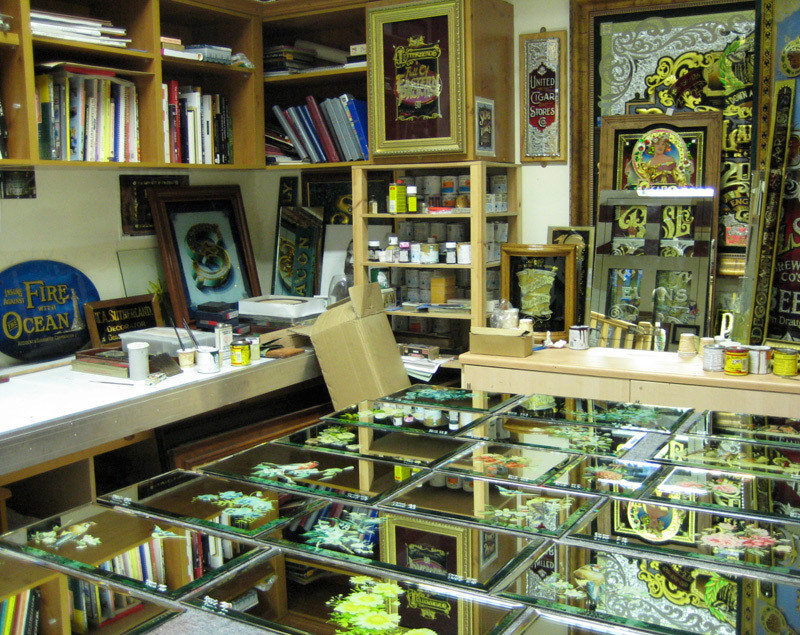 These hand-painted pictorials face out into the street, surrounded by the bespoke, wooden frames as seen in picture three. 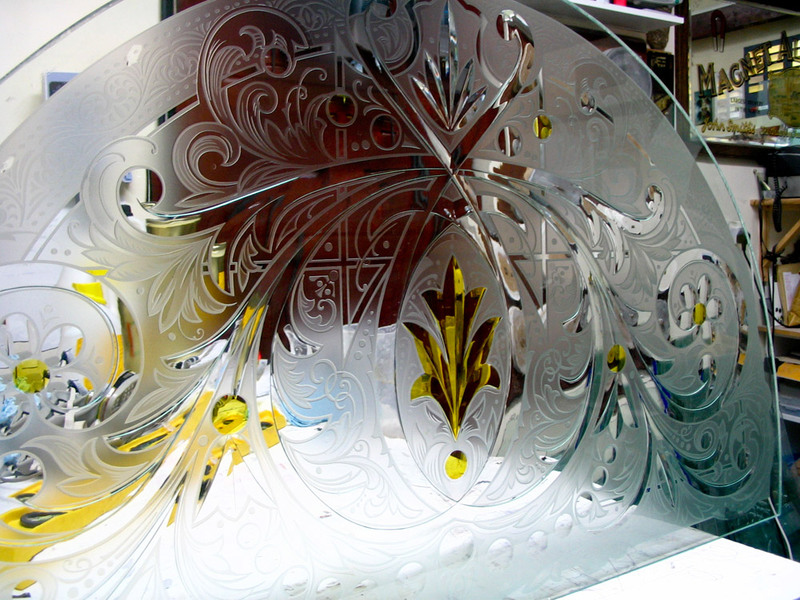 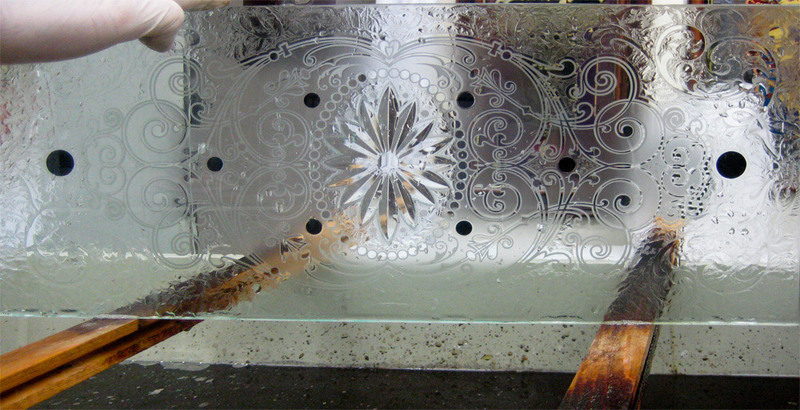 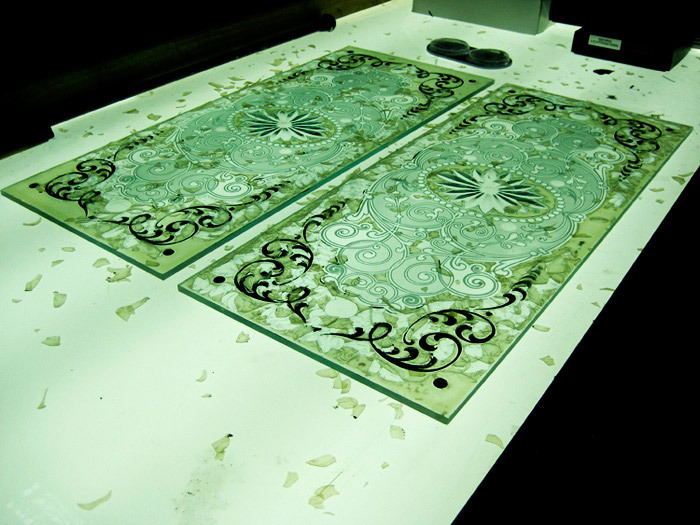 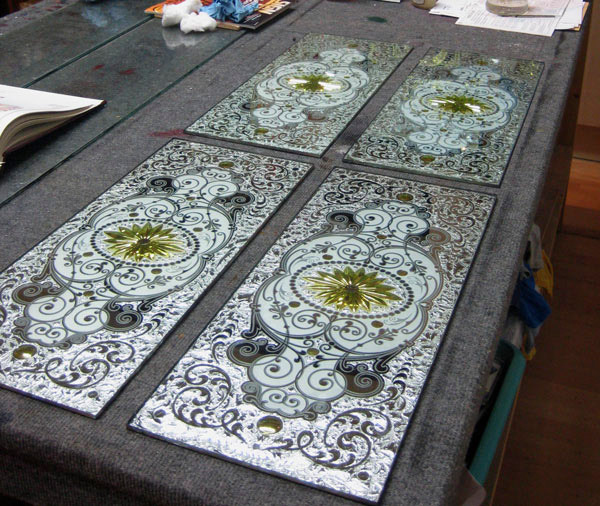 I designed and made these glass panels in 2005. 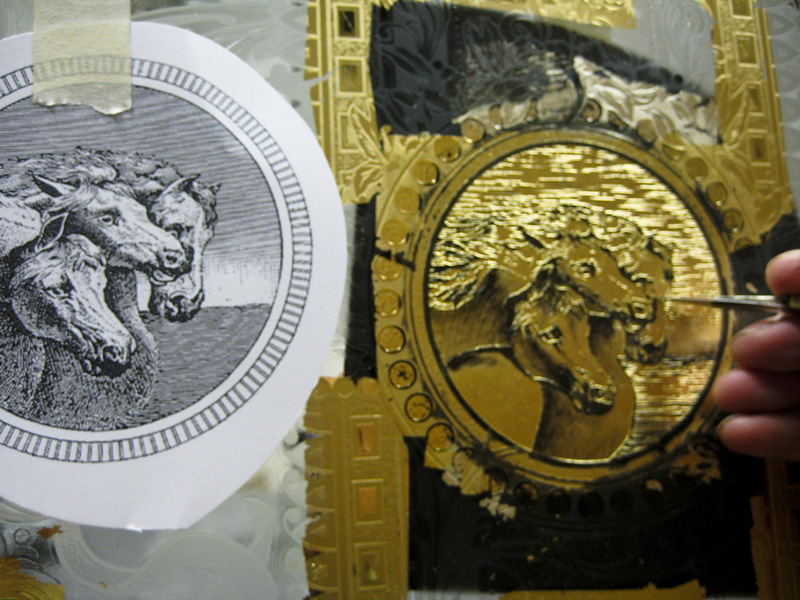 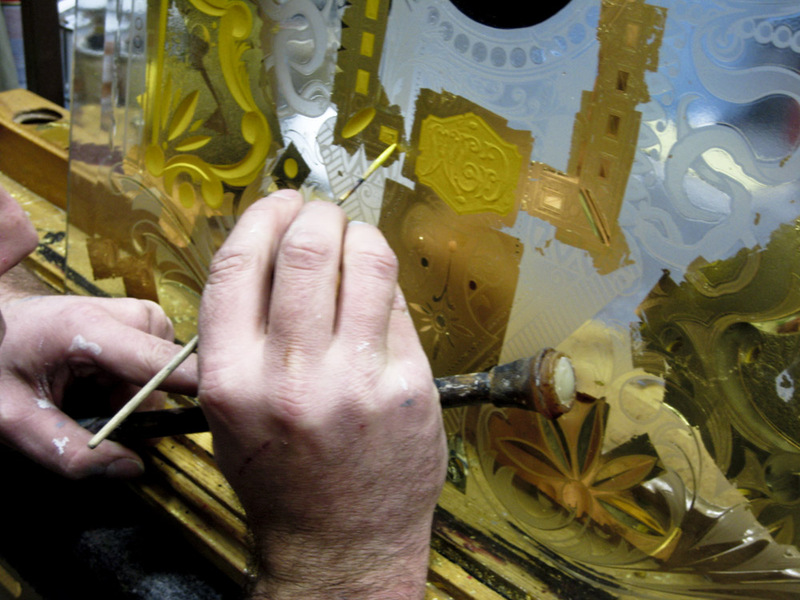 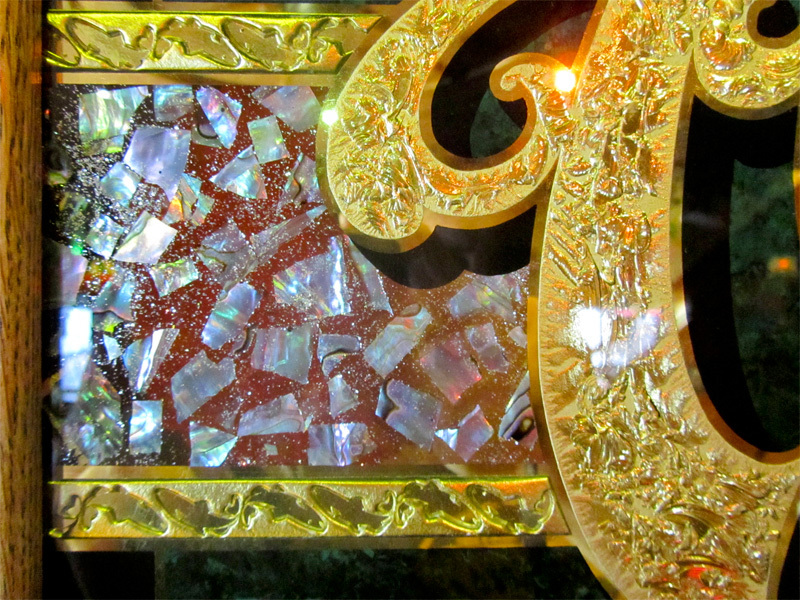 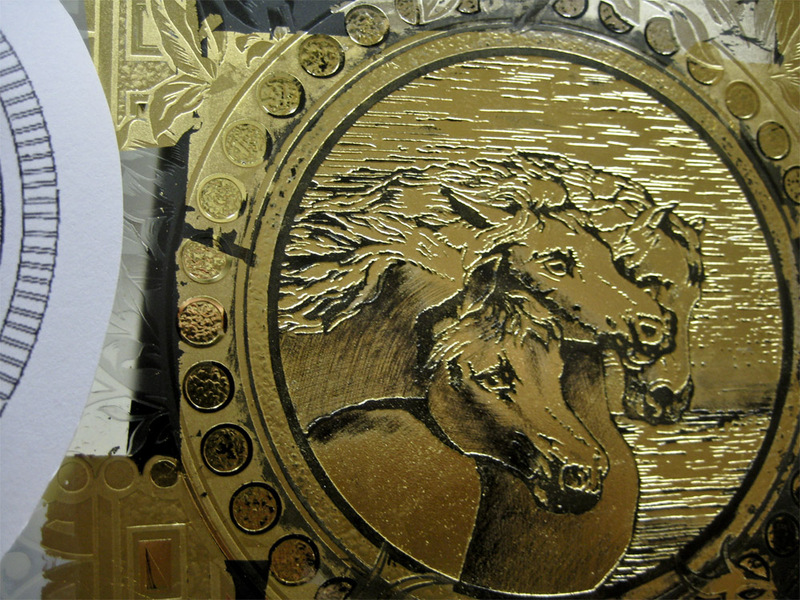 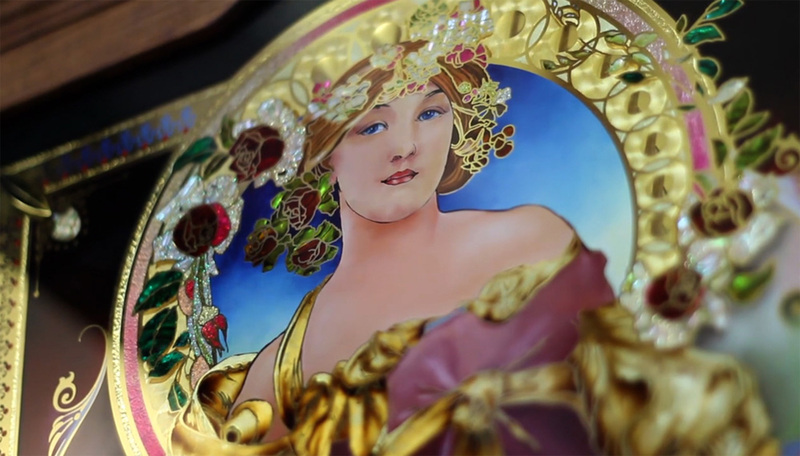 They consist of hand painted and screen printed work with mother-of-pearl inlay and various shades of gold leaf. 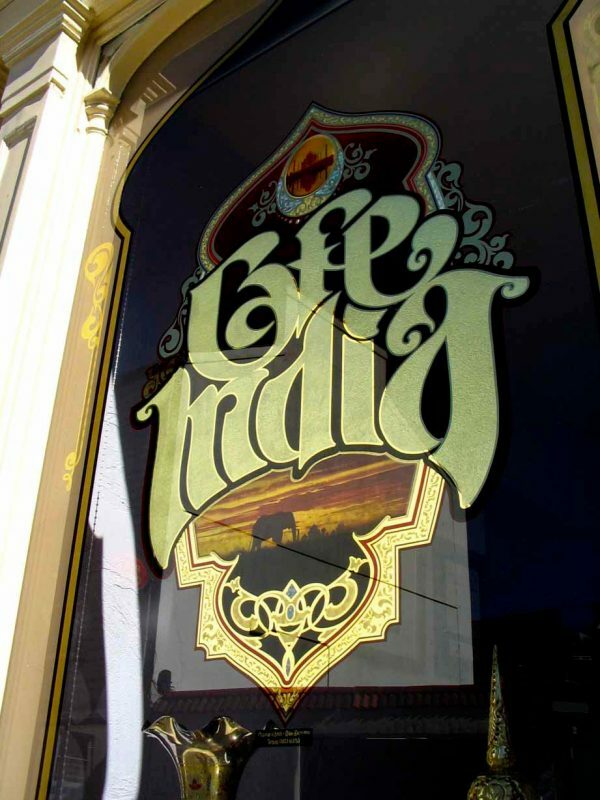 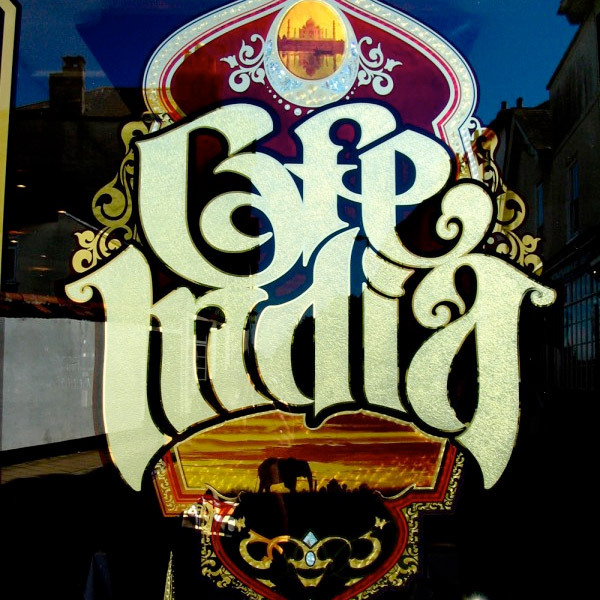 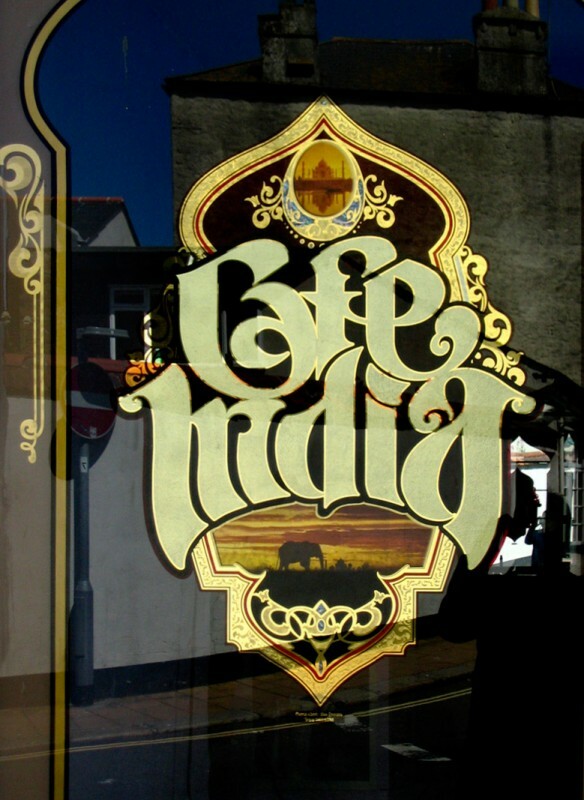 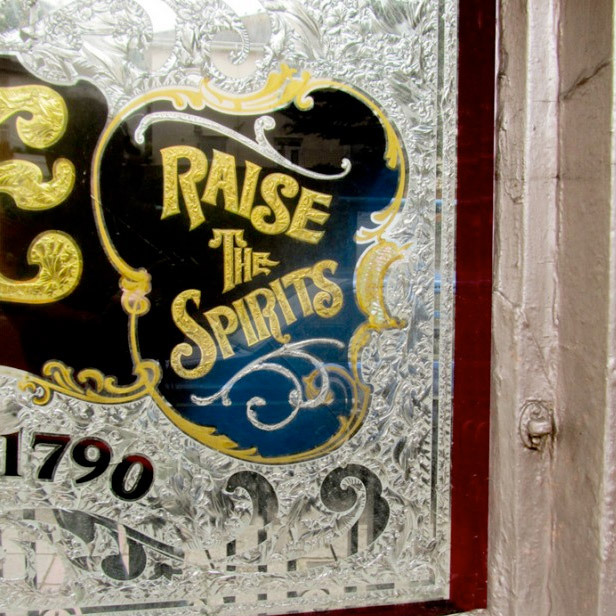 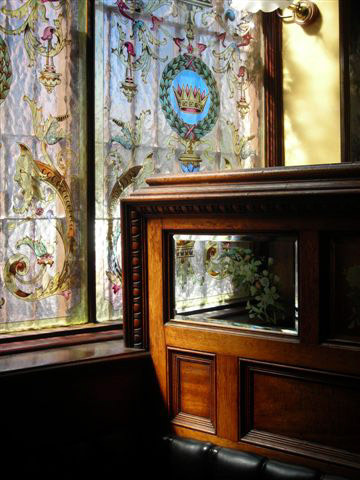 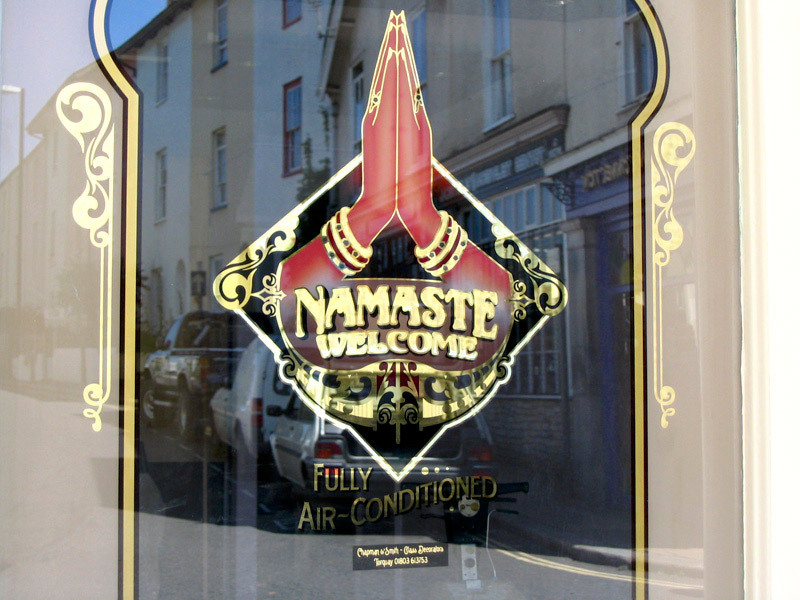 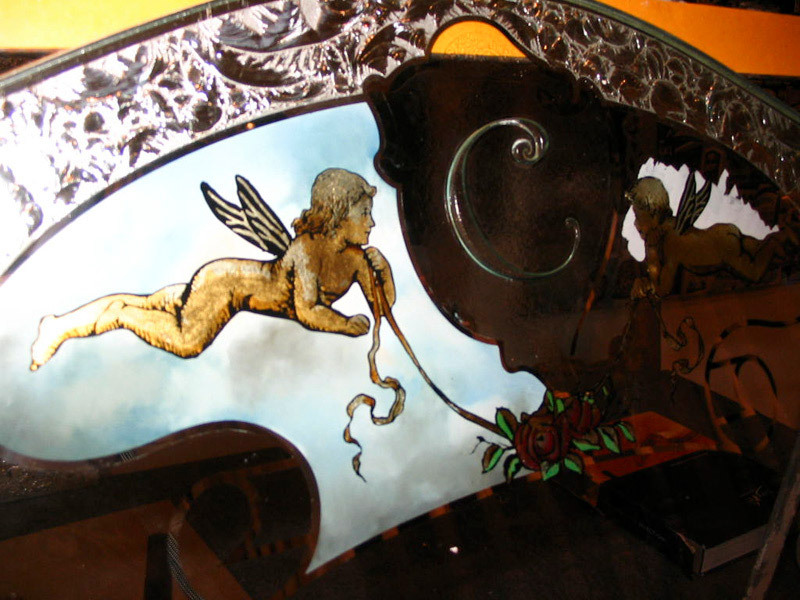 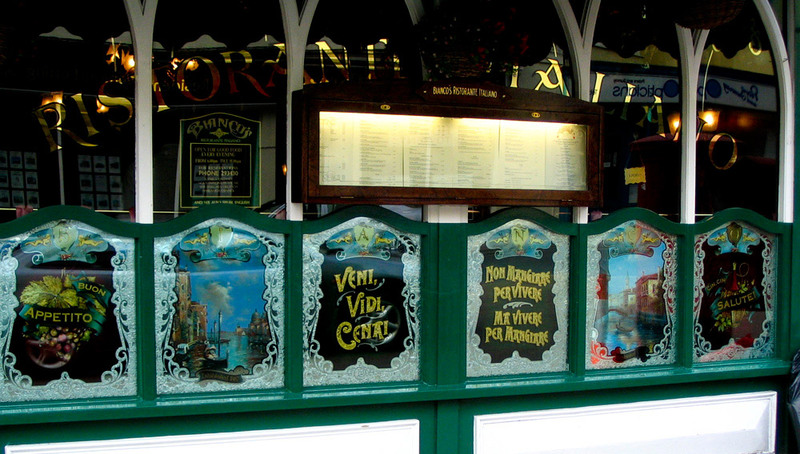 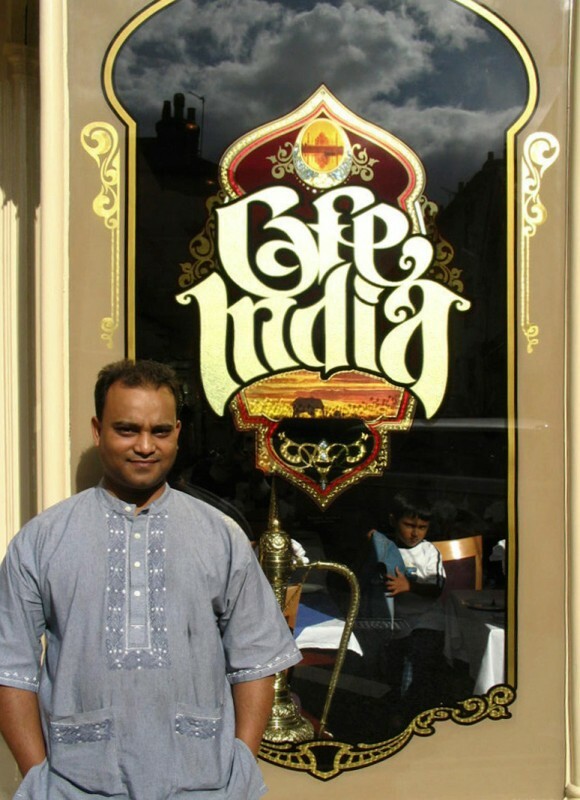 This reverse glass work can still be seen on the windows of Café India, Totnes. 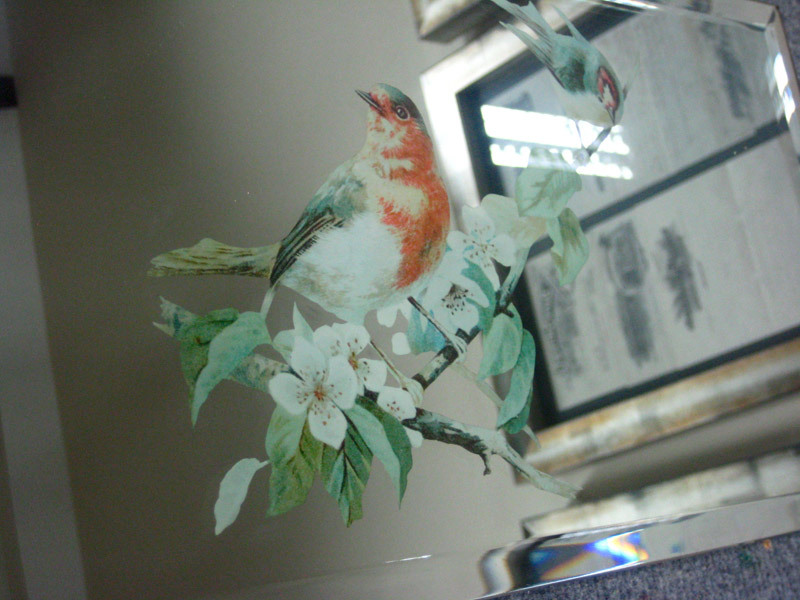 Commisioned by Joby Carter and Sons. 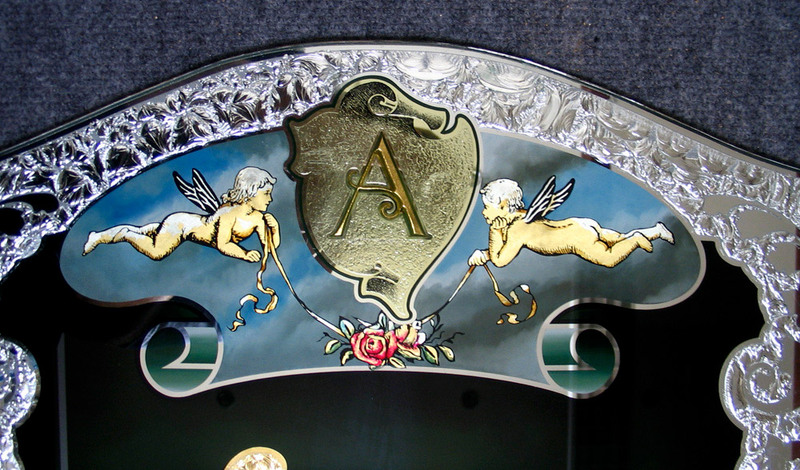 Vintage & Antique Restoration specialists in 2009. 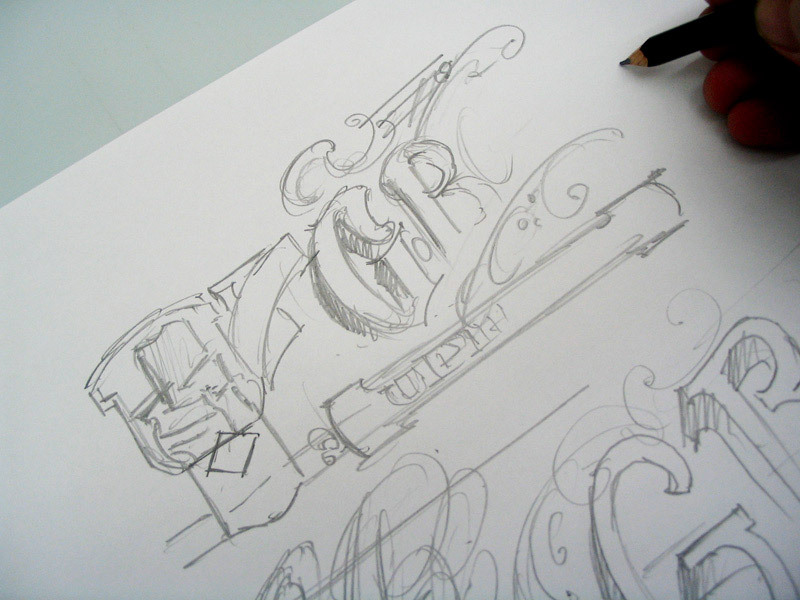 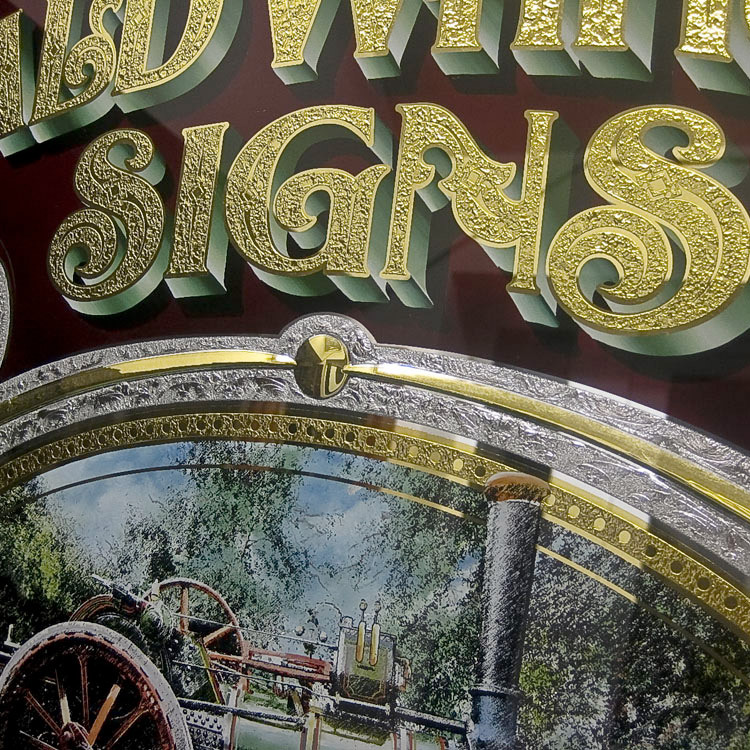 This was an attempt to capture the spirit of the fairground style lettering that adorns the work that is their stock in trade. 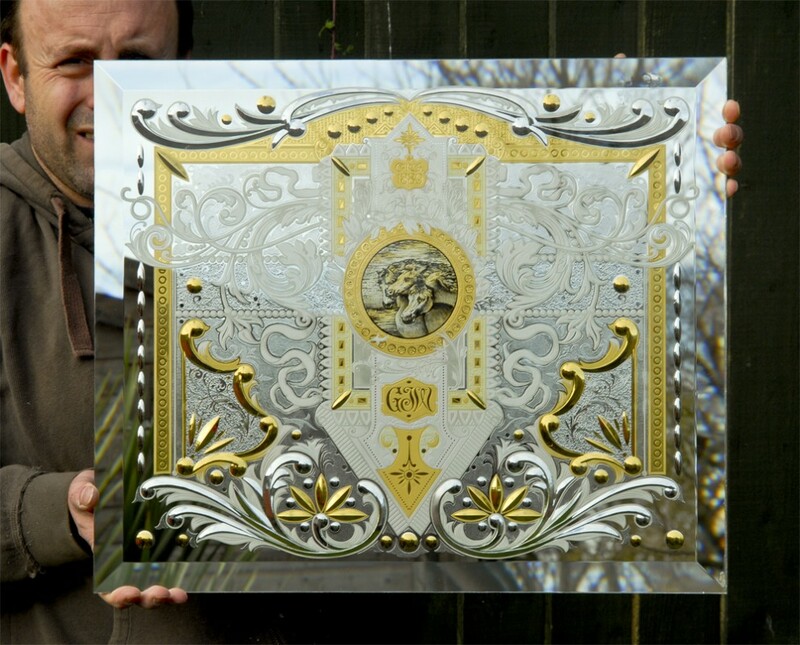 One of my early silvered, gilded and acid etched panels 5ftx3ft made in 1997. 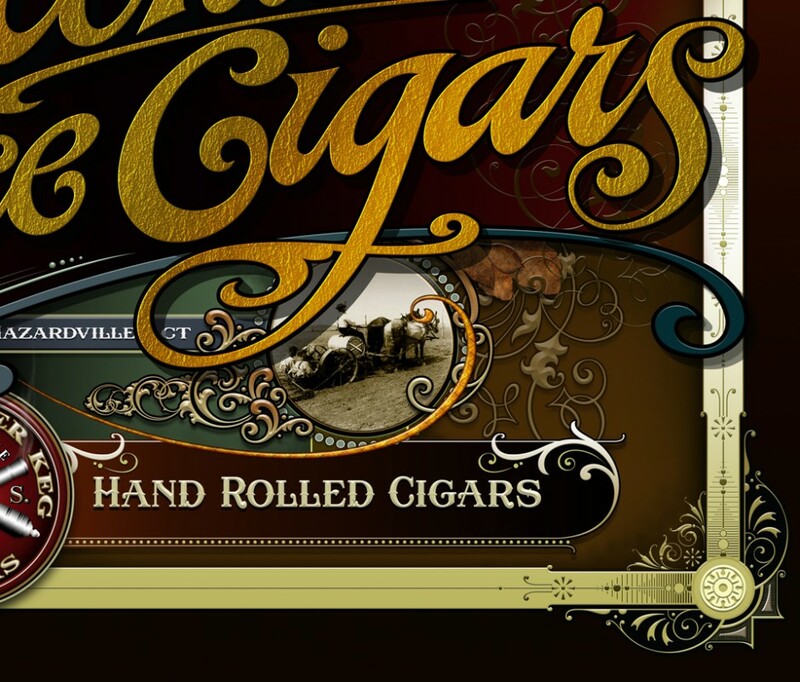 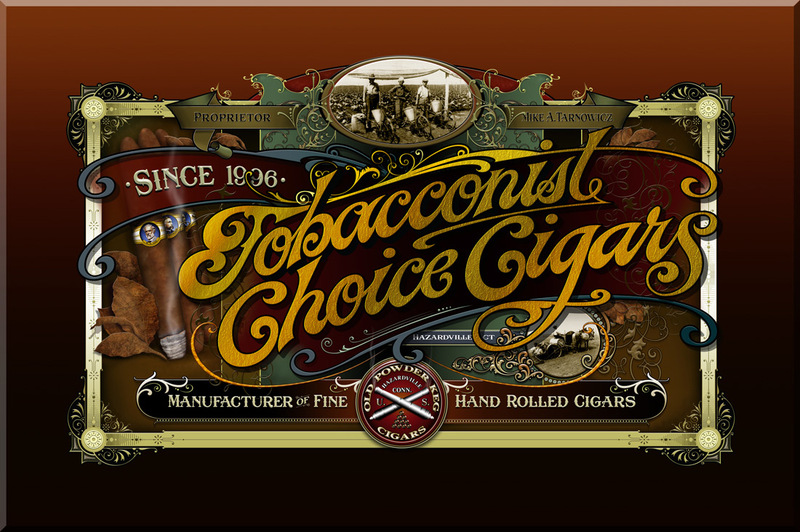 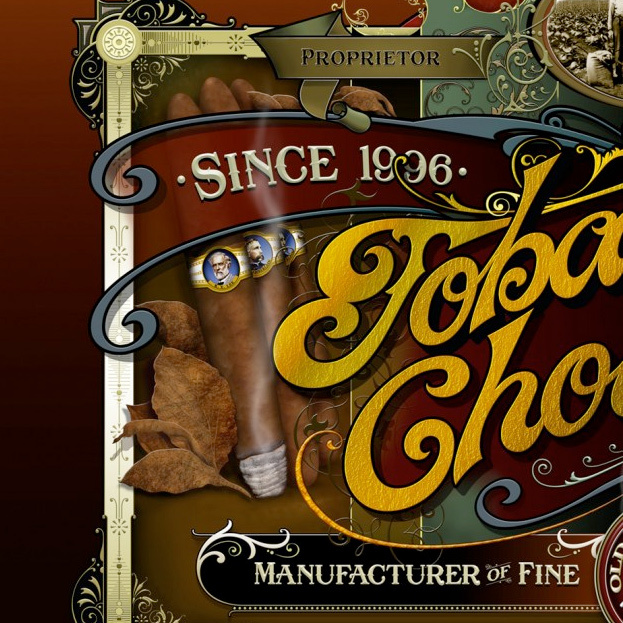 The cigar pictorial to the left of the design was 'painted' using a Wacom tablet in Photoshop. 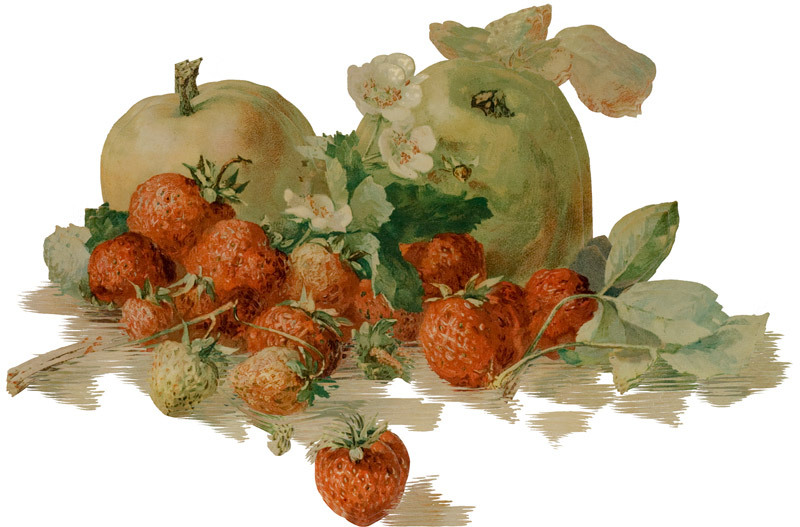 Probably took just as long with these computer tools as it would have been using oil paints with a brush and painting by hand. 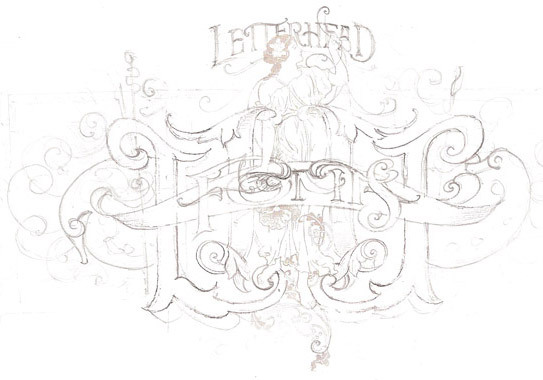 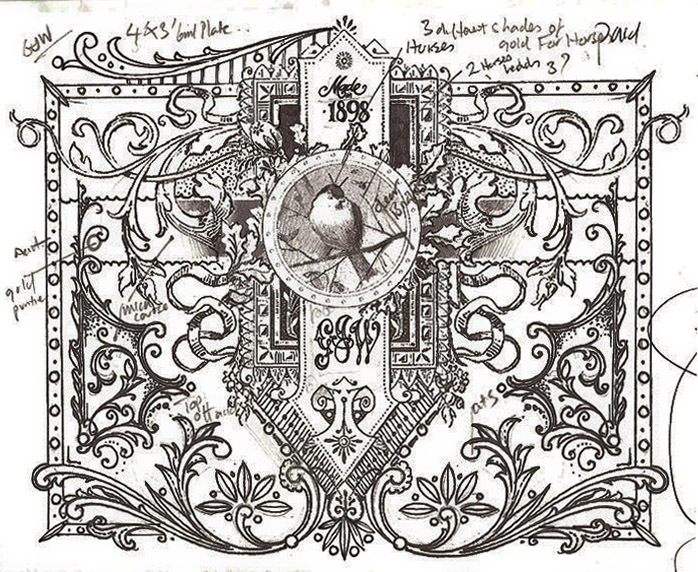 Designed for Jeff Lang Letterhead Magazine USA in 2006. 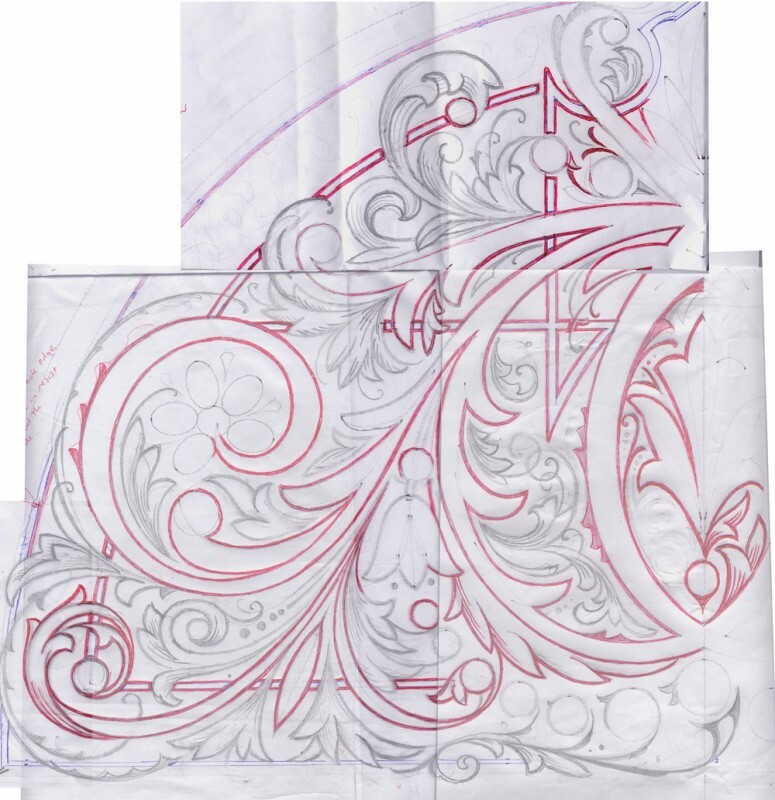 A combination of mostly hand-sketches and then built in a vector programme and coloured in Photoshop using a Wacom tablet. 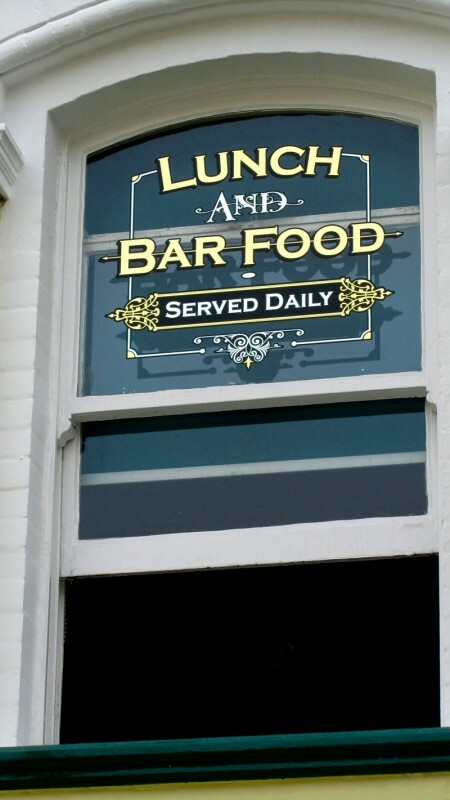 This glass sign I made for a local pub in my town. 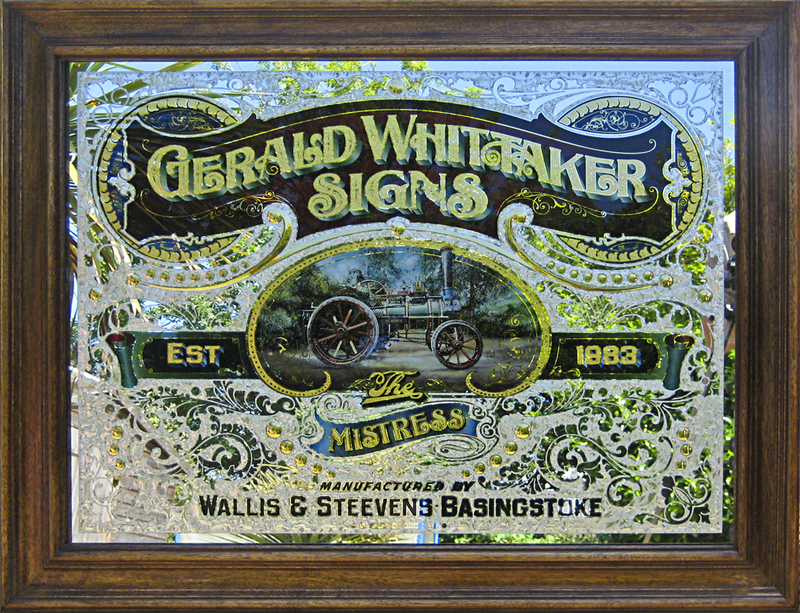 It was designed from an original trade card that Rick Glawson bought from an advertising show in Los Angeles. 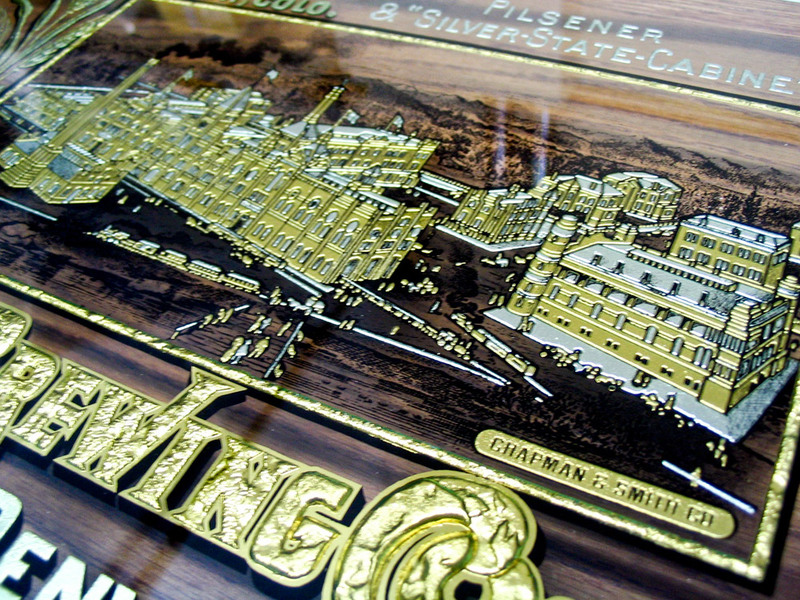 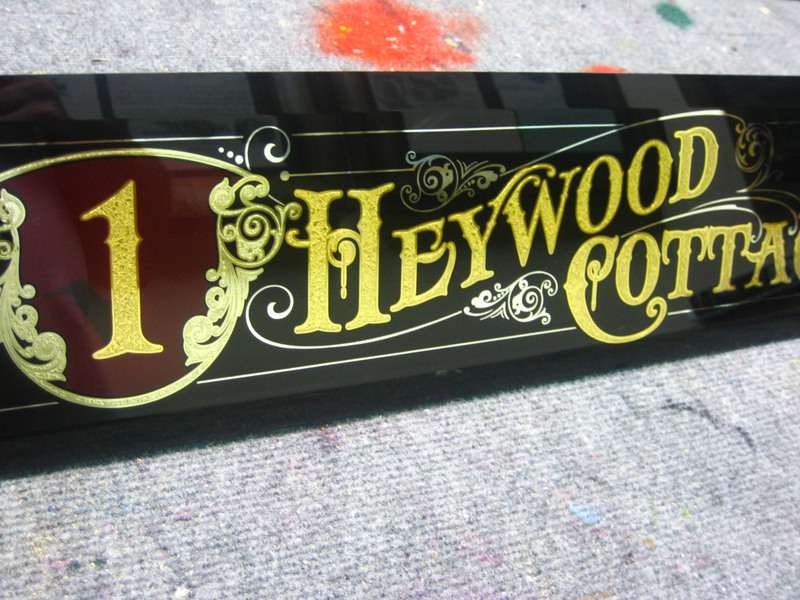 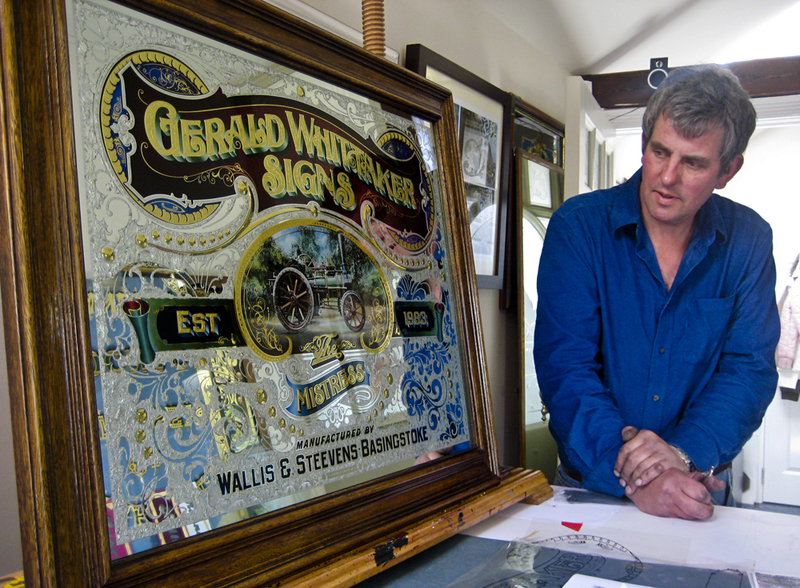 Rick made the original sign for his front shop counter in Wilmington, California. 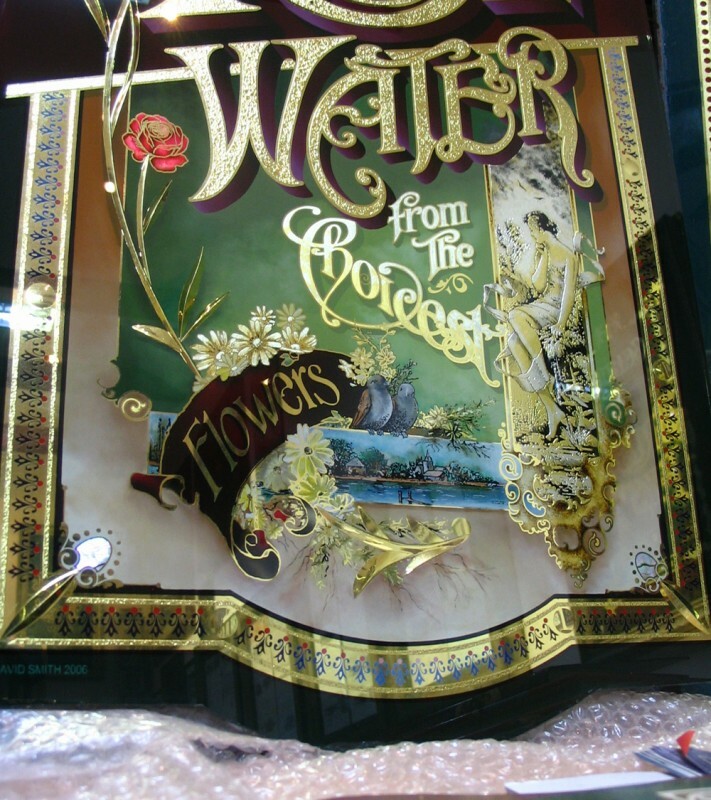 He mainly used it for display ,but it was also designed for customers to pay for there supplies by placing there coins and notes directly on to the glass. 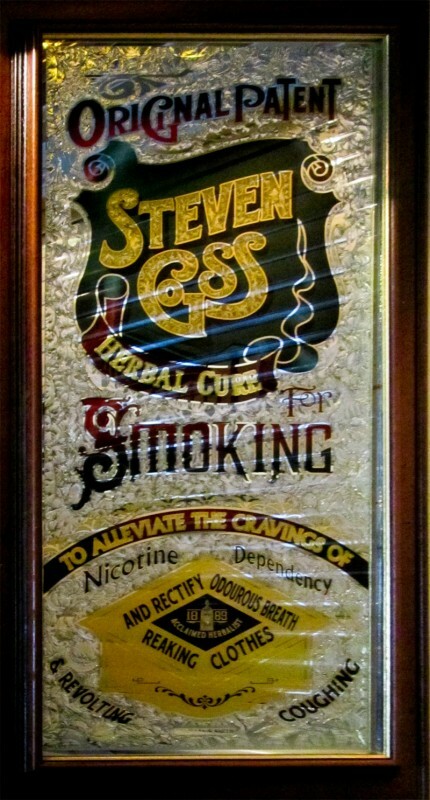 His Brother kindly sent it to me after Rick passed away in 2003. 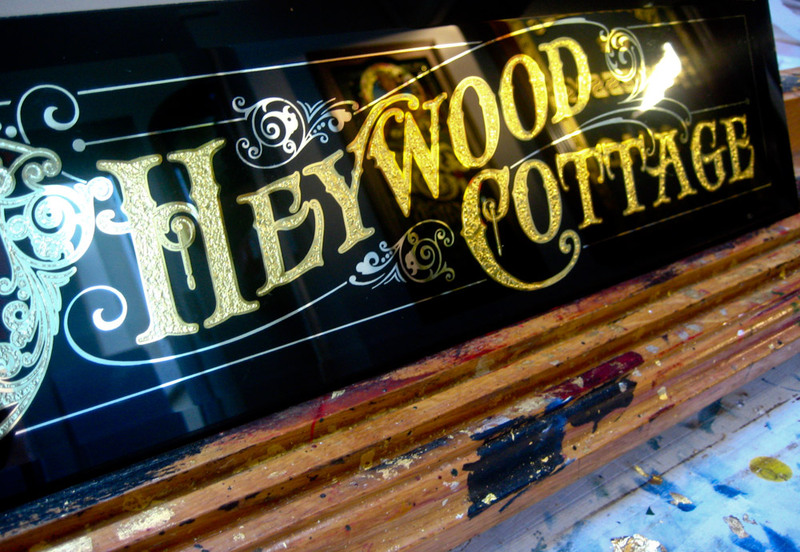 I showed it to a local pub owner called Steve Goss who asked me if I could make one for him to hang above the optics behind his bar. 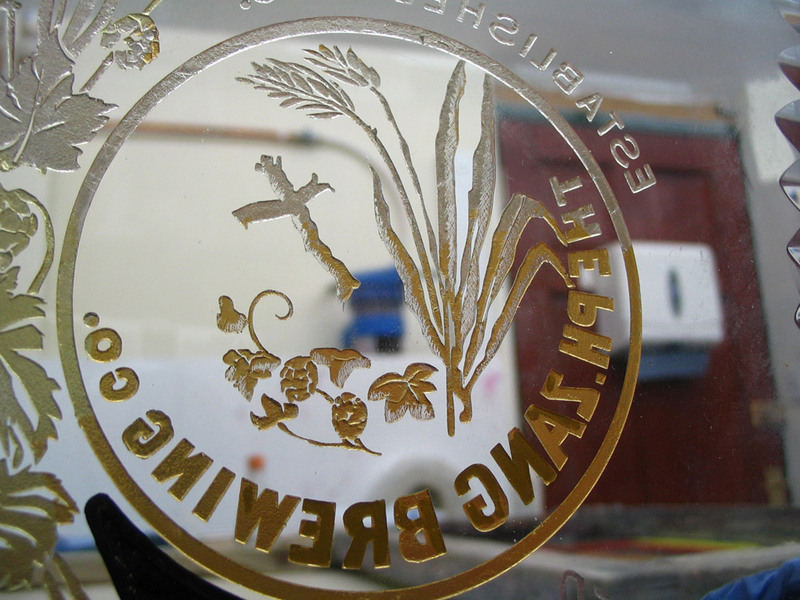 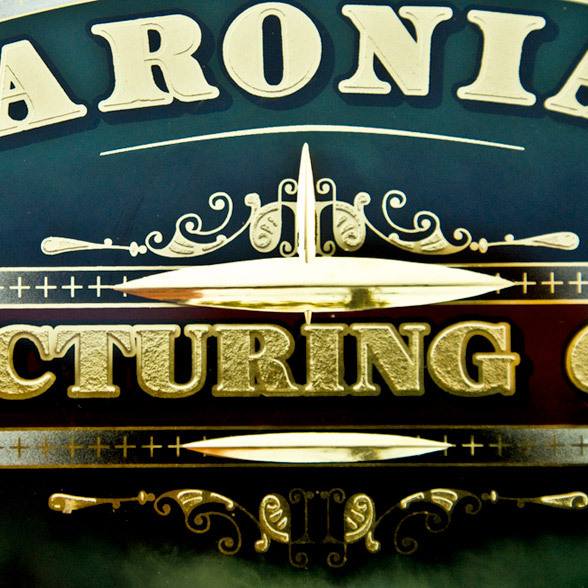 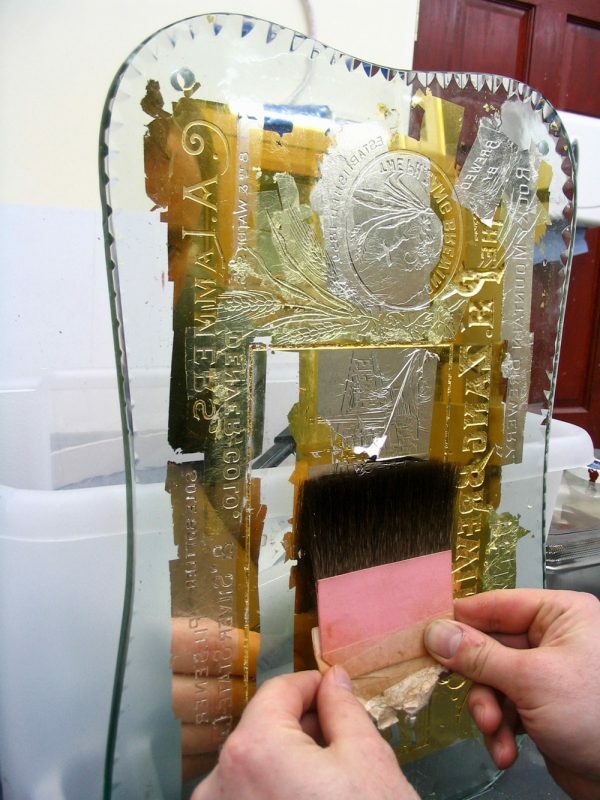 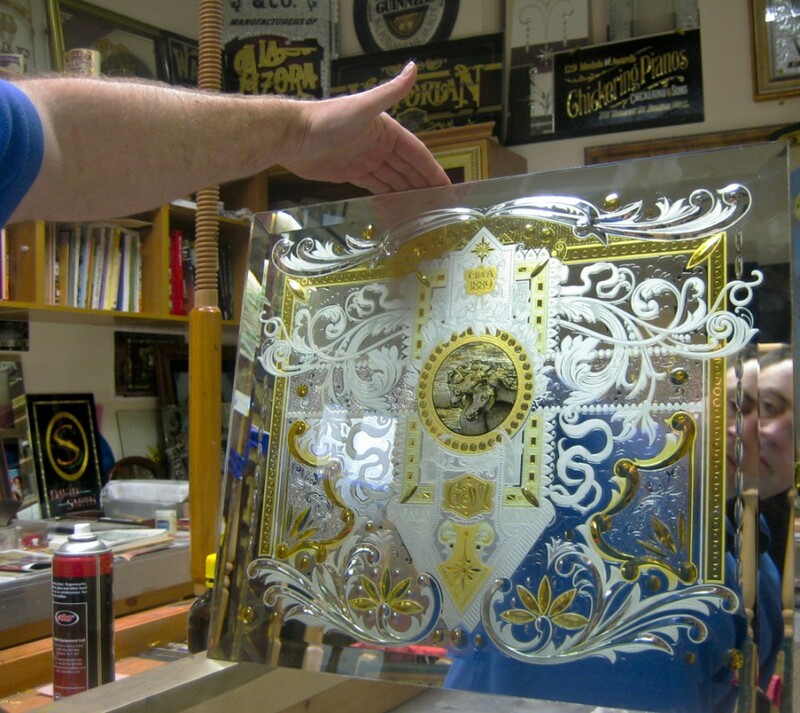 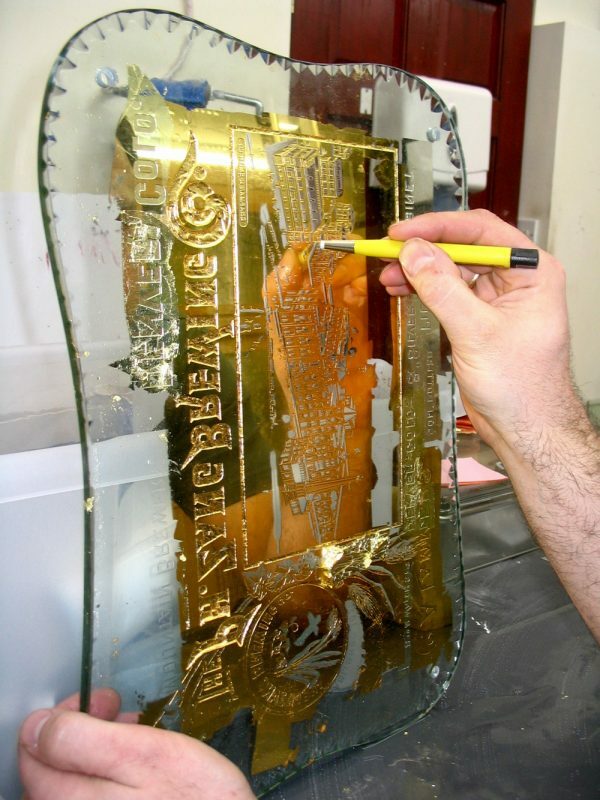 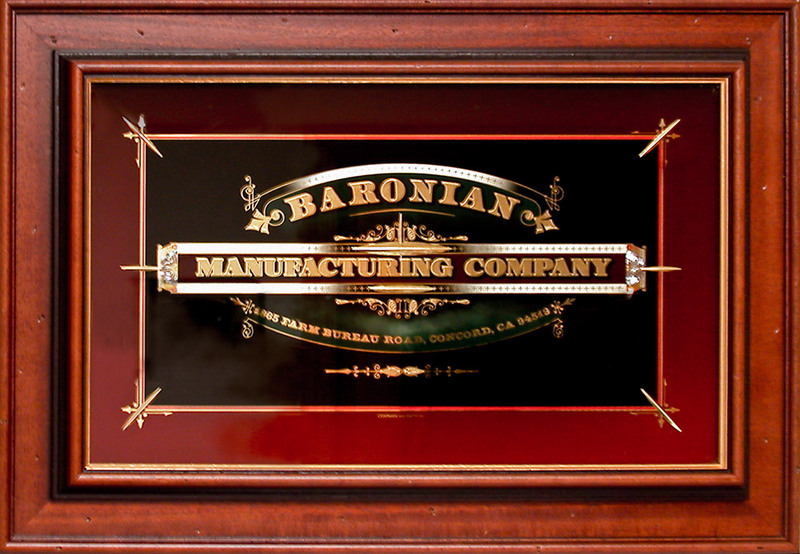 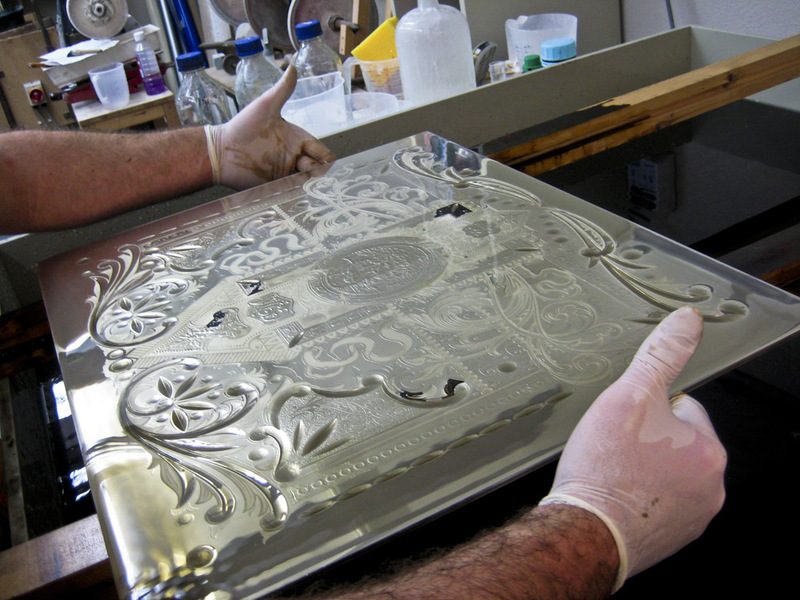 This small gilded glass sign was made for The Baronian Manufacturing Company in California USA in 2006. 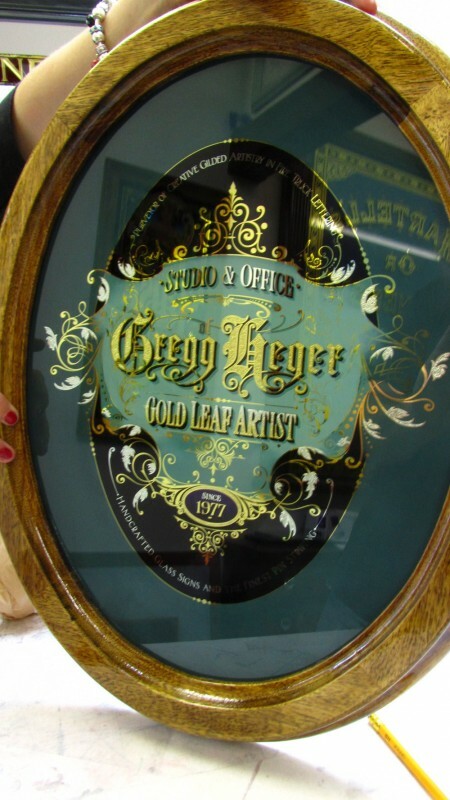 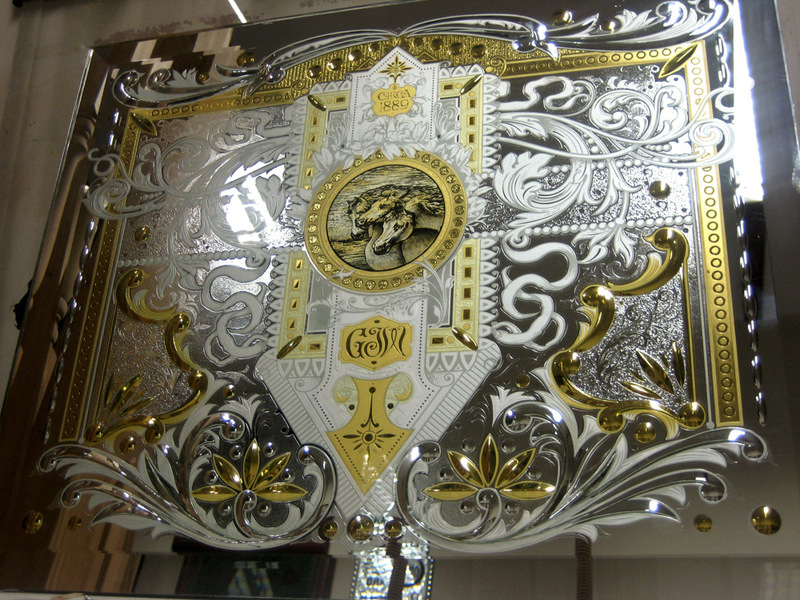 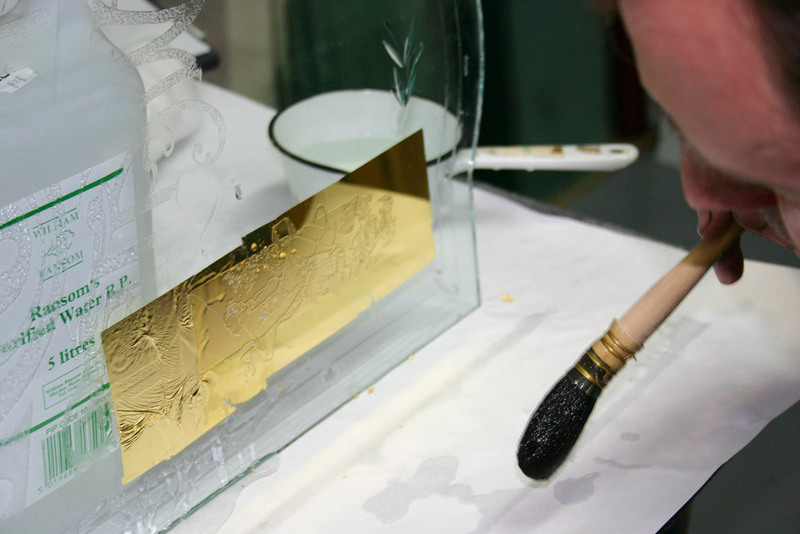 It employs matt finished gold and shading, mirror gilded-gold leaf, acid embossing and finger blending it also has small details of cut glass. 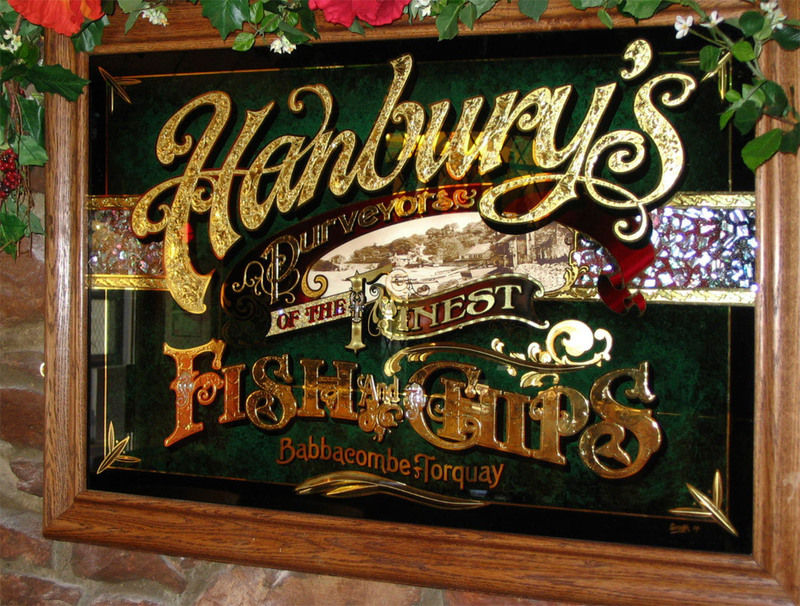 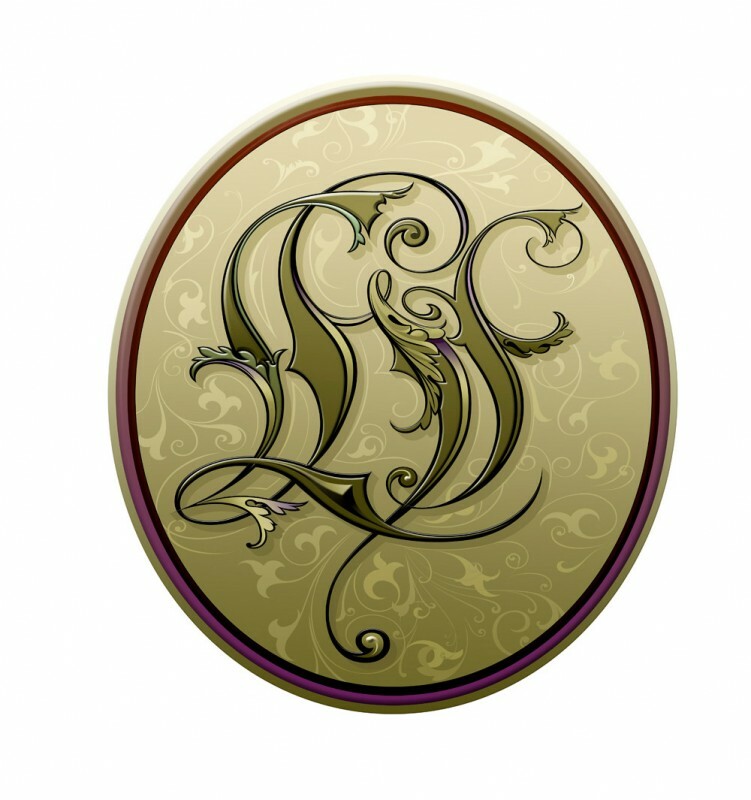 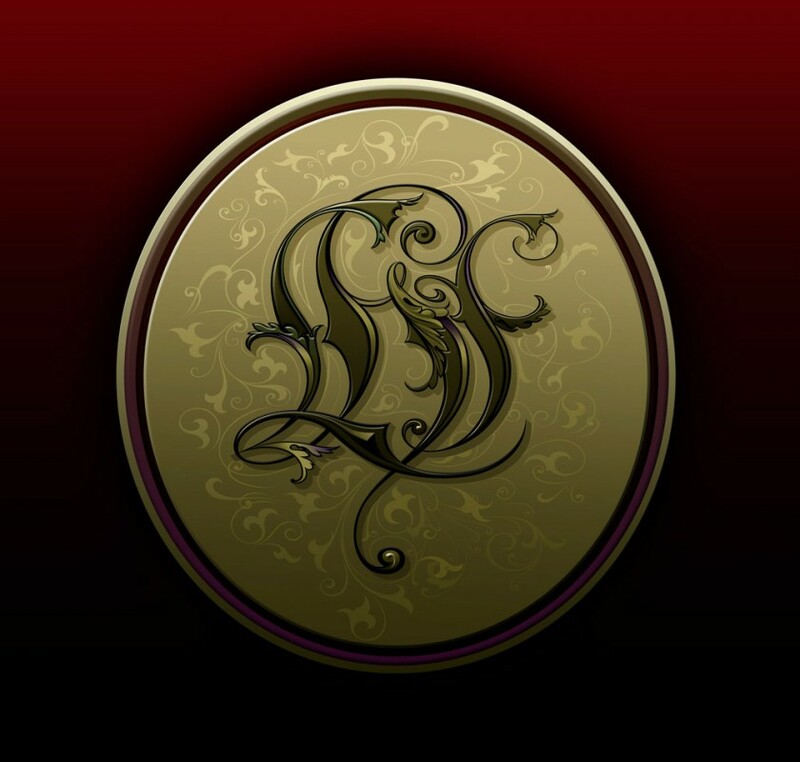 The background was glazed in Dragons blood red enamel which originally was purchased from Rick Glawsons Fine Gold Sign co. 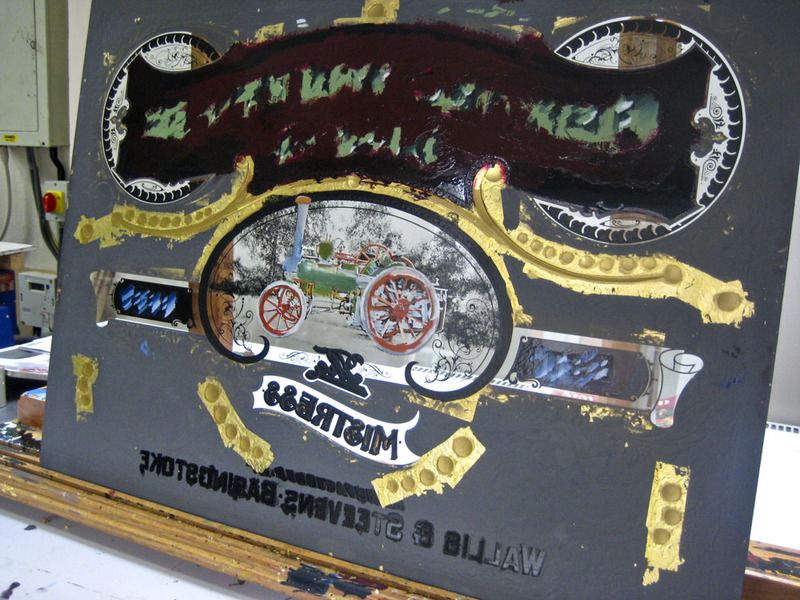 The red was laid down and when dry the background was blended from red to black giving the colour a deep maroon finish from the front. 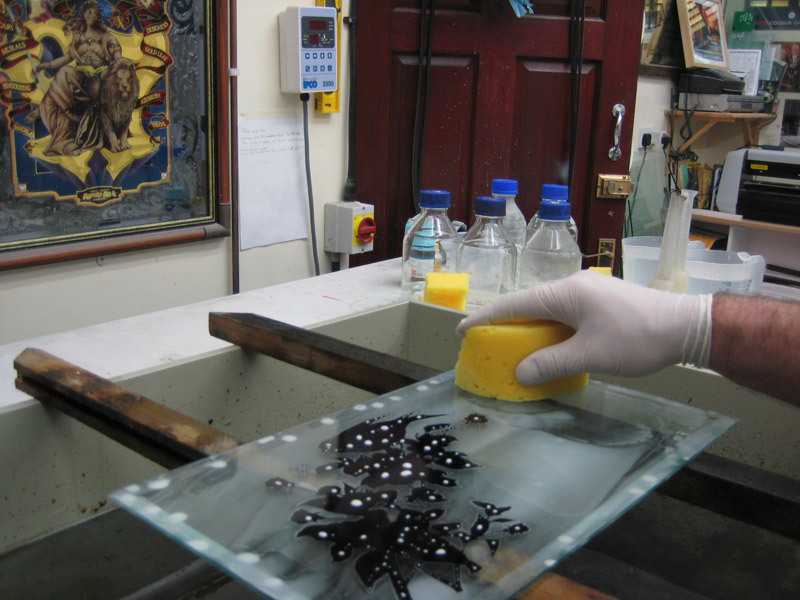 Some great colours and effects can be made using these glazes. 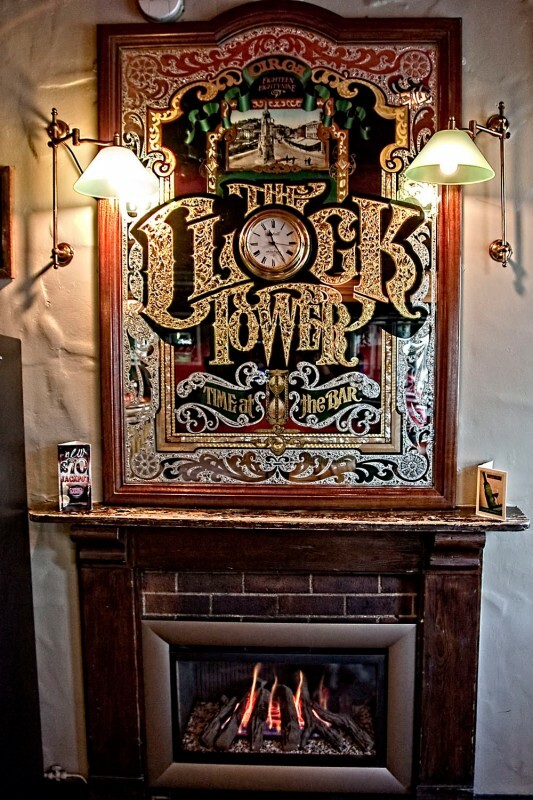 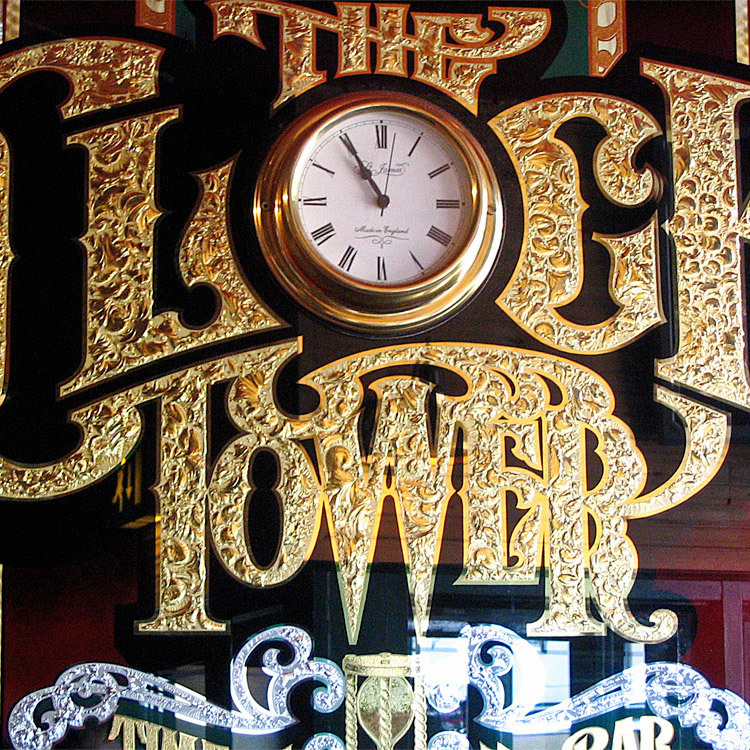 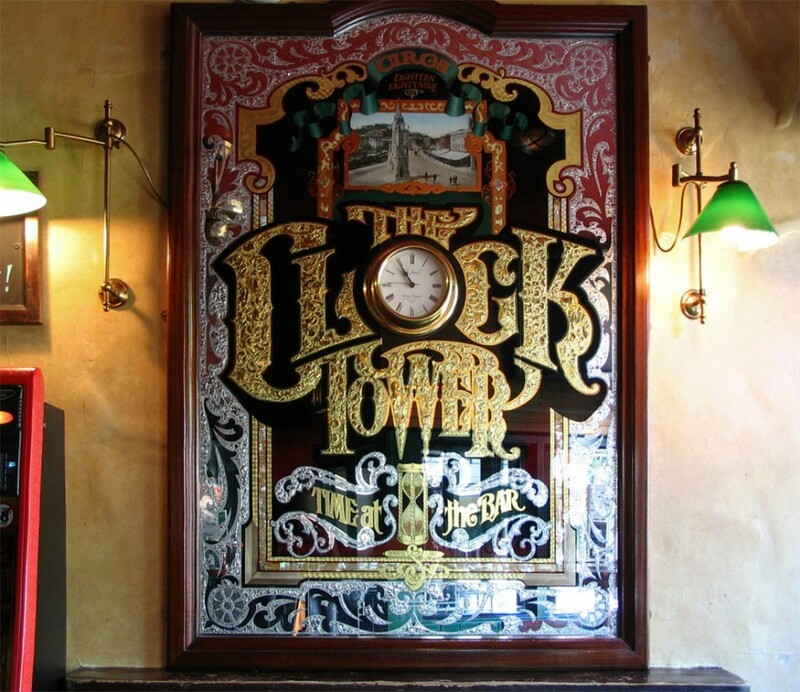 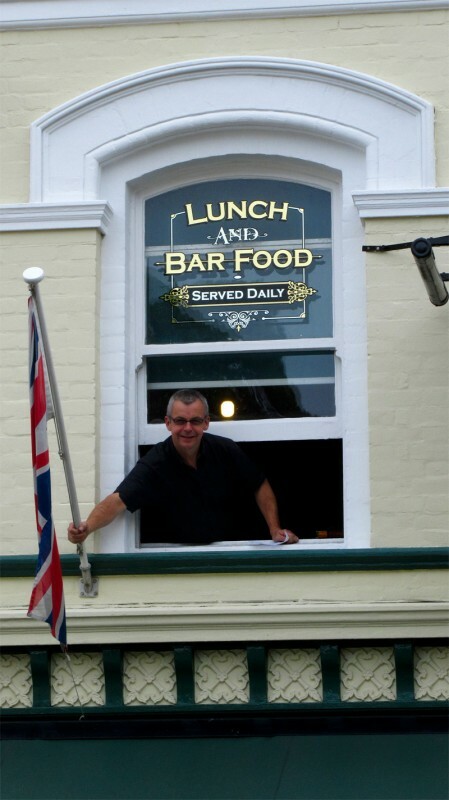 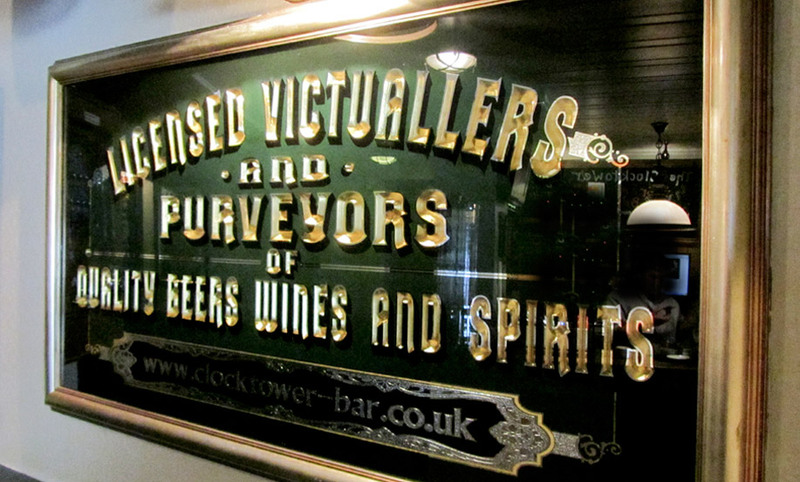 The Landlord of the Clocktower, Torquay has been one of the most regular customers for my work over the years, gradually commissioning me to transform his pub into a London style Gin Palace using Victorian glass techniques that he has a passion for. 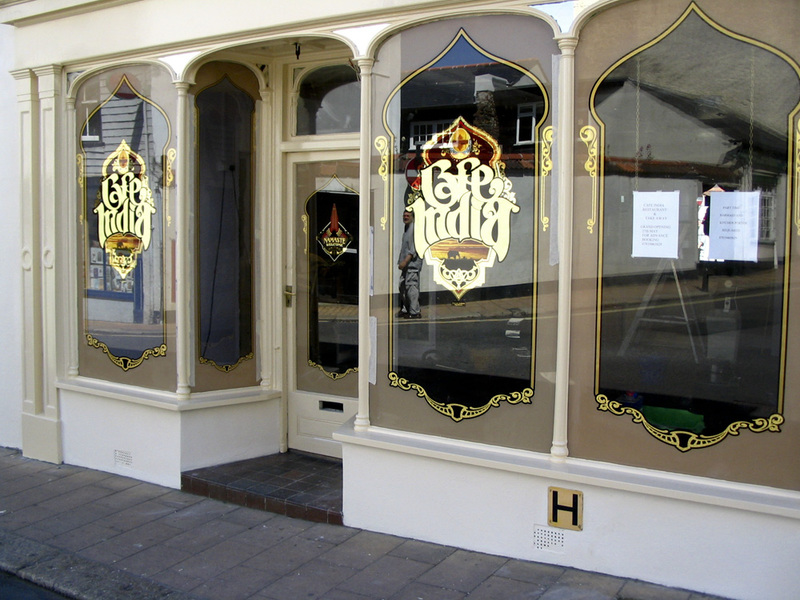 Later next year all the front main windows will be brilliant cut and acid toned in 3 shades to match the half round panels of cut glass already part of the pub frontage. 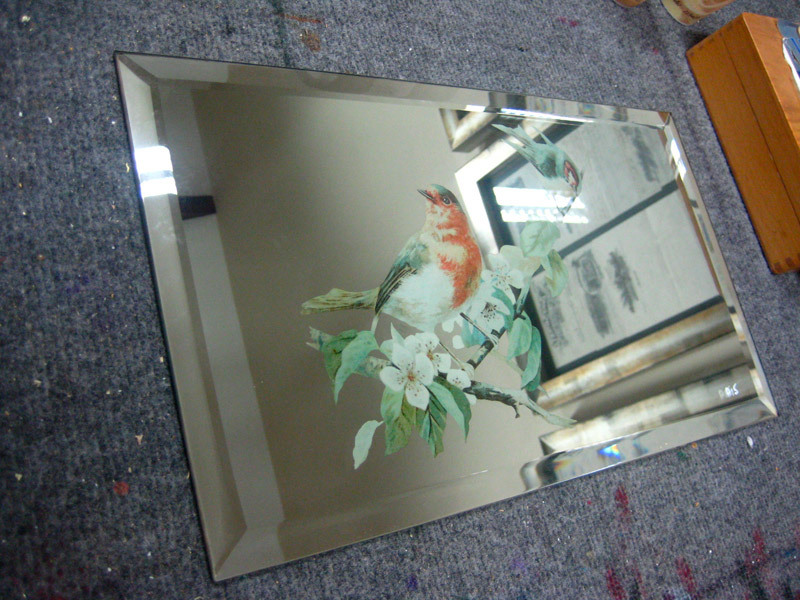 This is one of four decorative cut glass beveled mirrors. 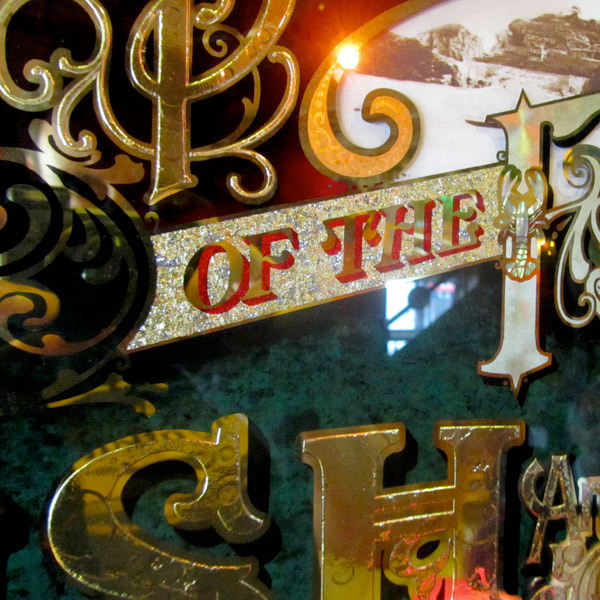 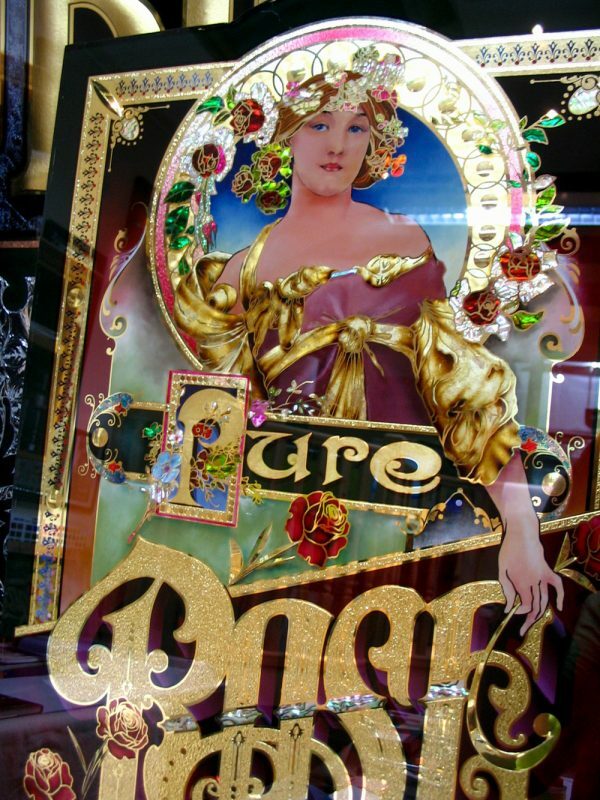 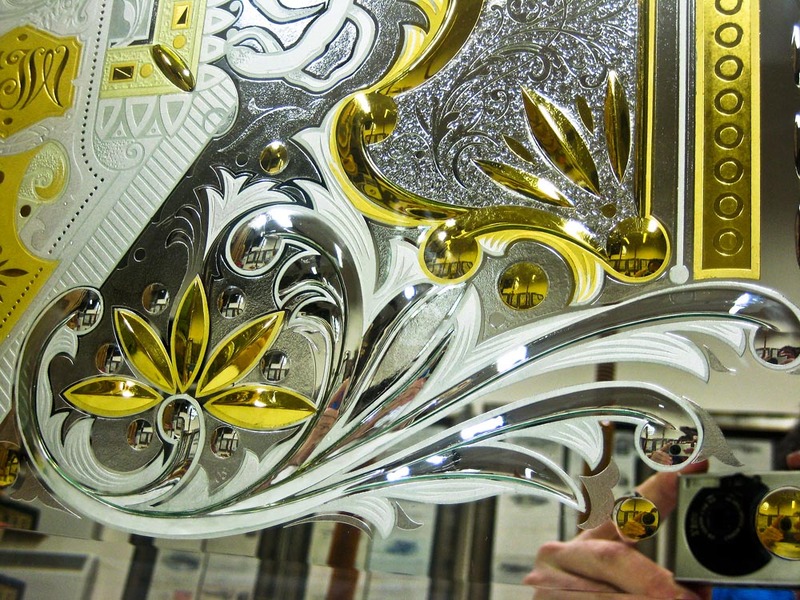 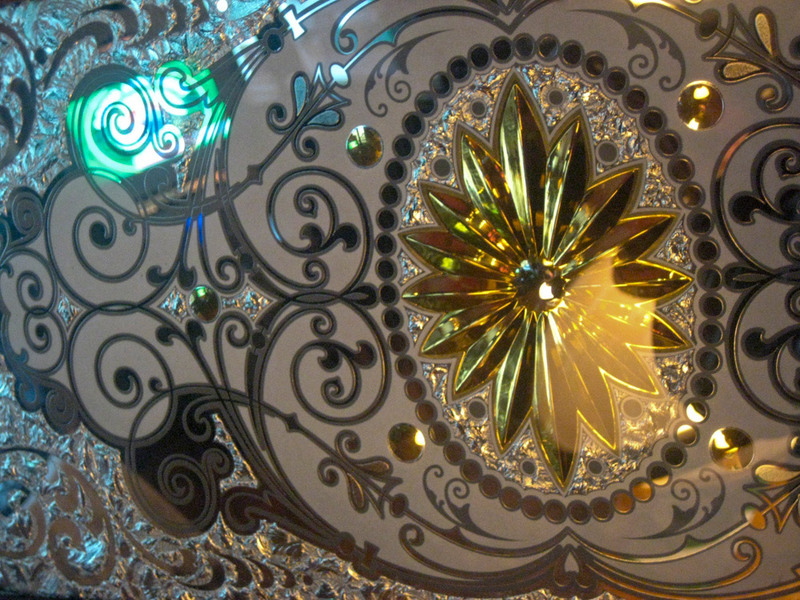 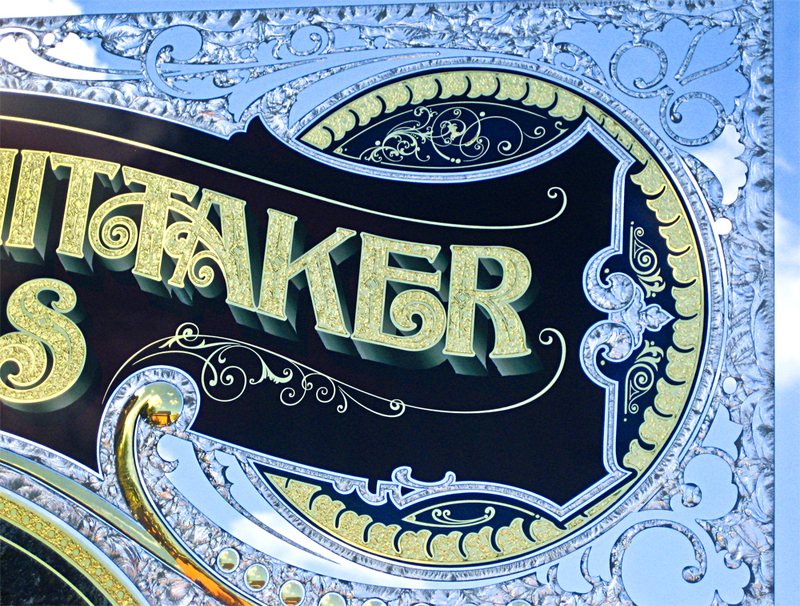 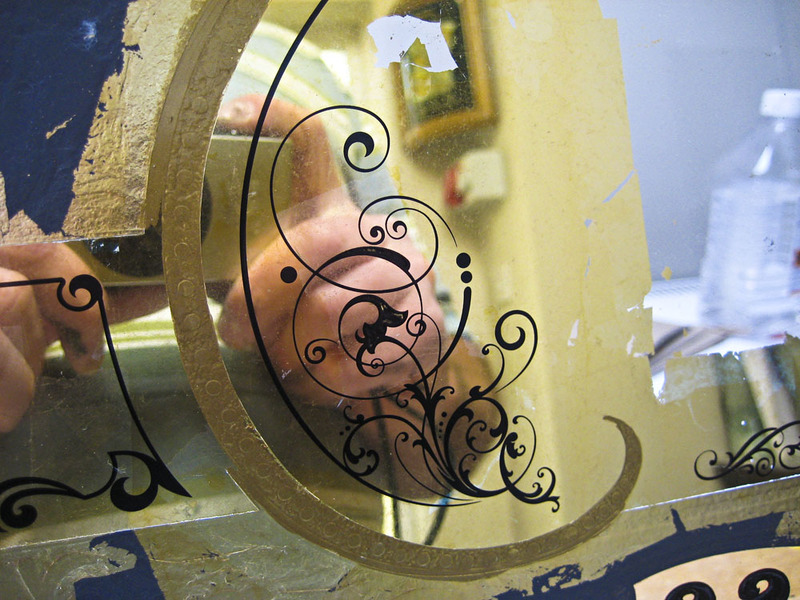 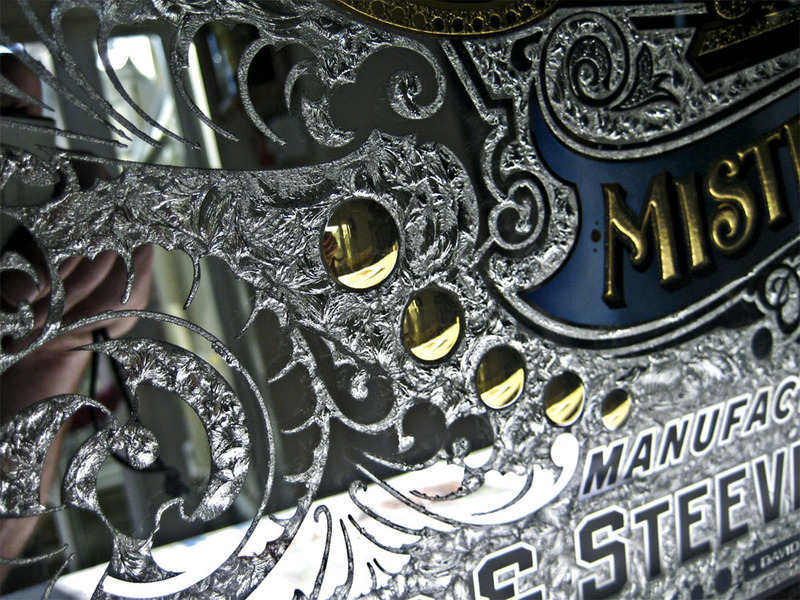 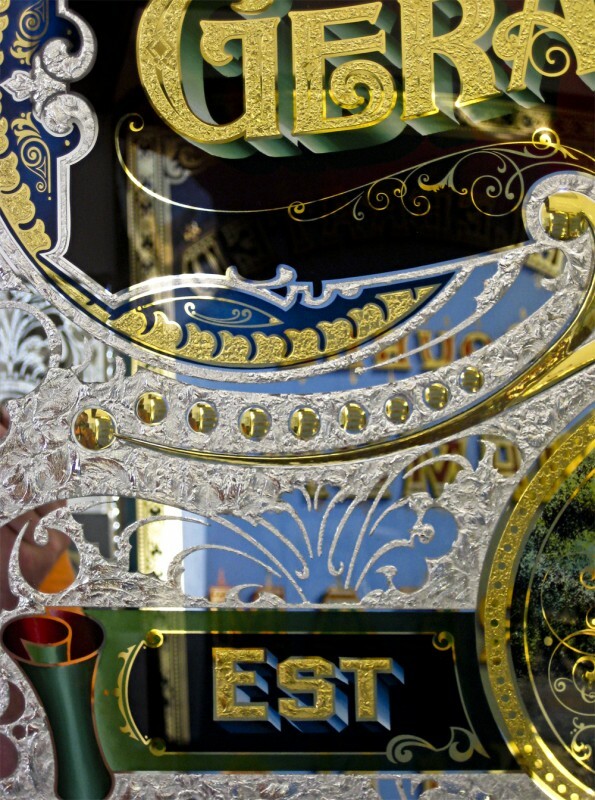 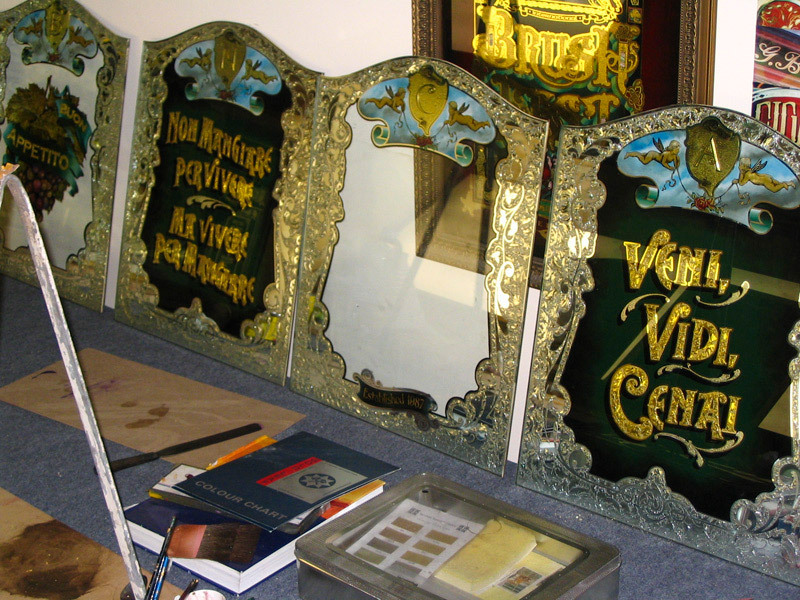 These mirrors were made in 2008 for ornate fairground gypsy caravans. 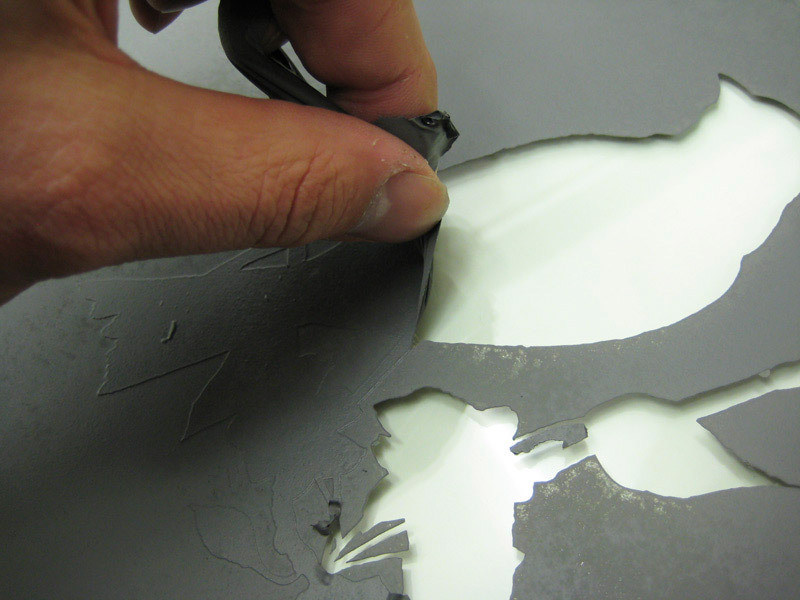 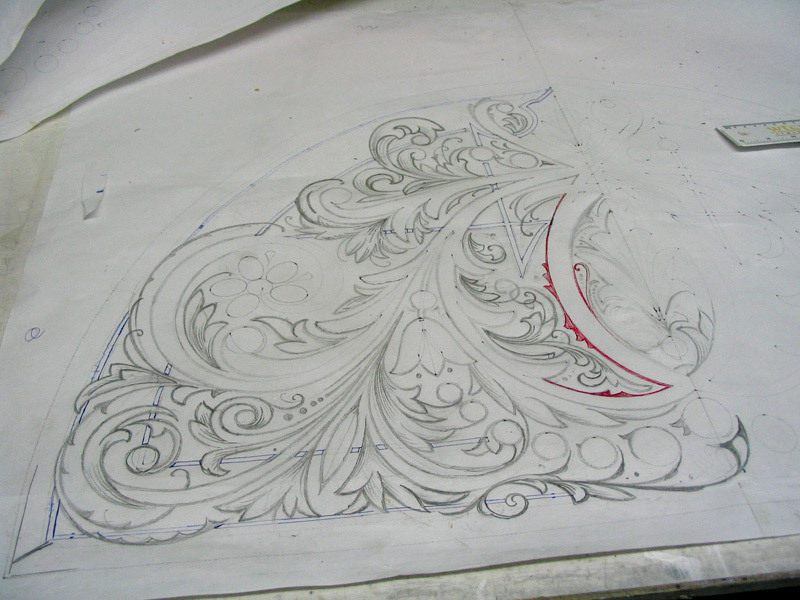 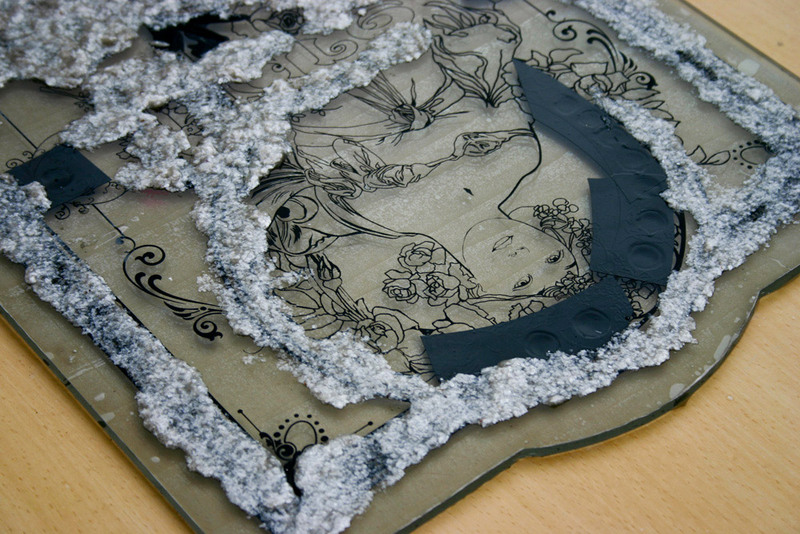 The techniques include brilliant cutting, four toned acid etching and a large mica stipple. 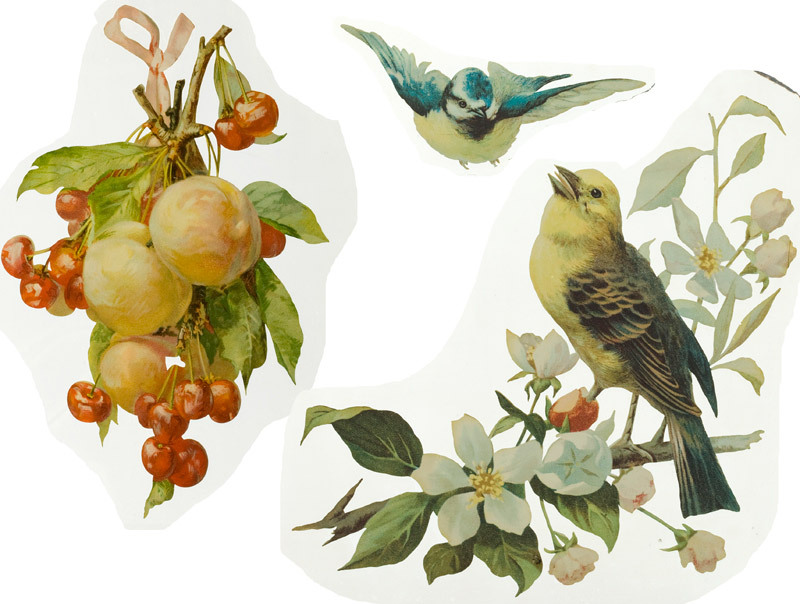 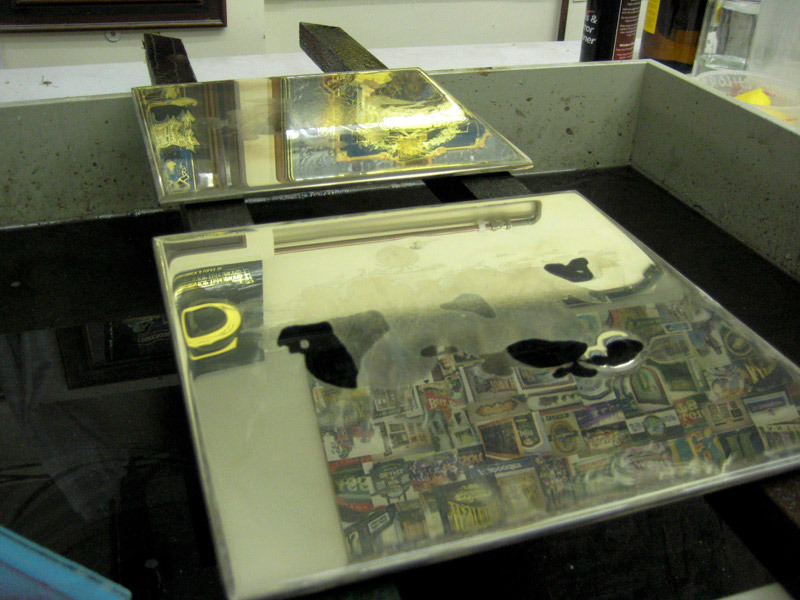 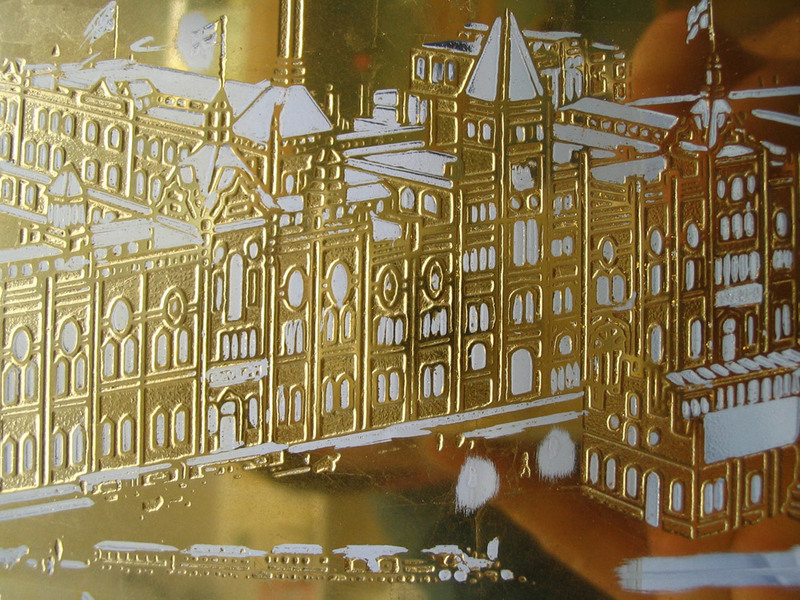 The centre pictorial was acid etched and a technique called ver eglomise was used for the detail in the pictorial. 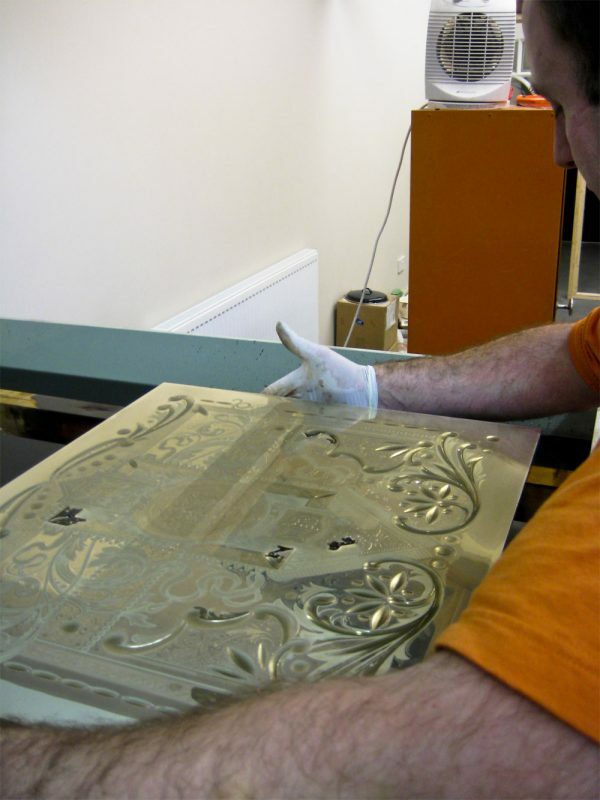 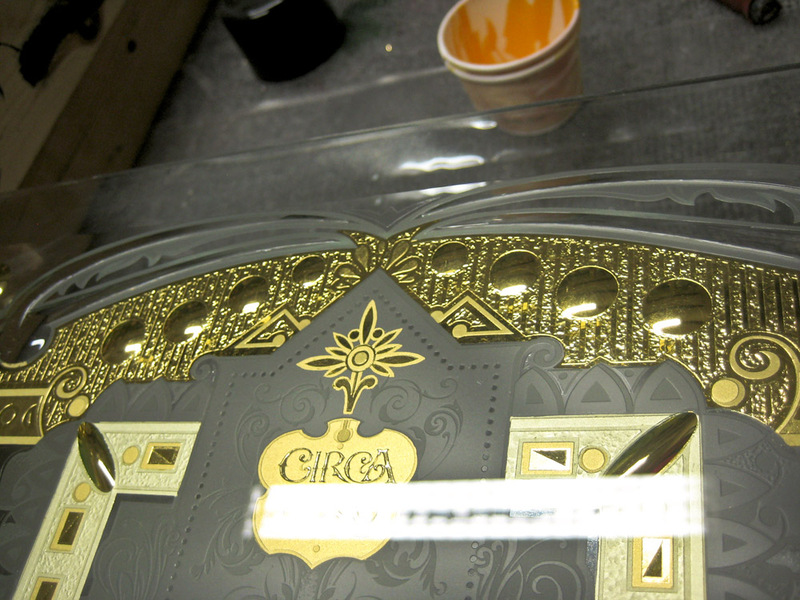 24 carrot gold leaf was then applied using gelatine watersize. 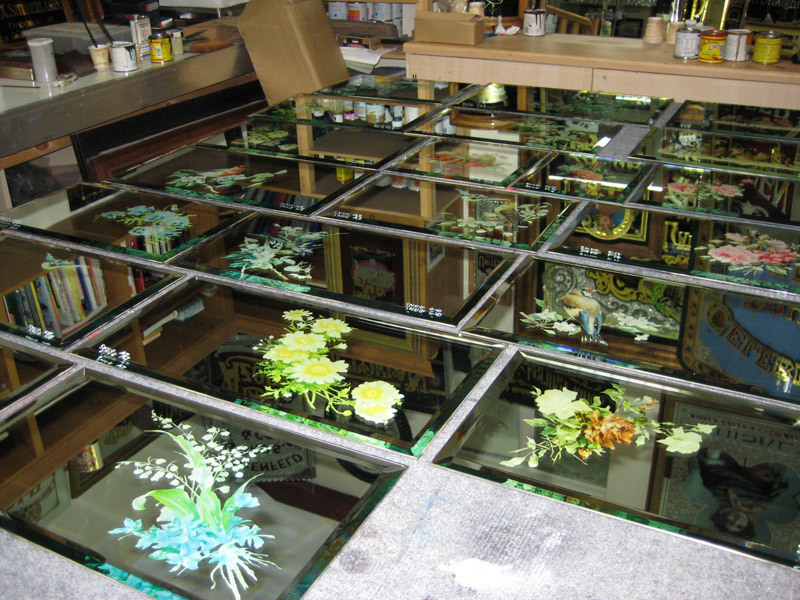 Each piece of glass is 36"s x 29"s with a 1" bevel. 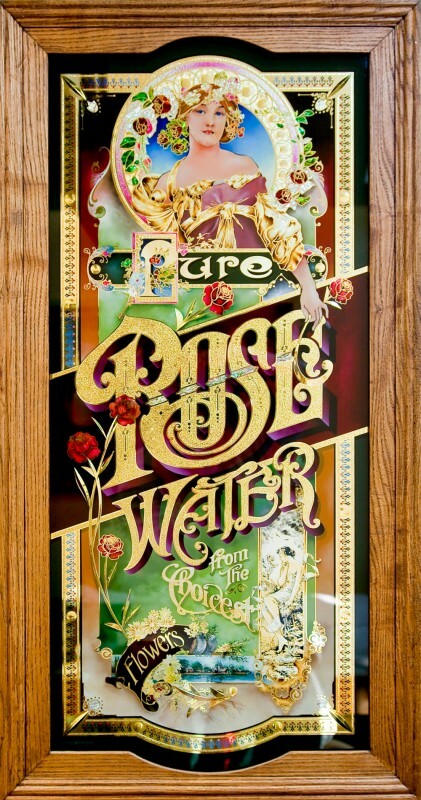 The Rose Water glass panel was designed for a Gold Leaf workshop with my friend Gary Godby who came here from Virginia, USA in 2006. 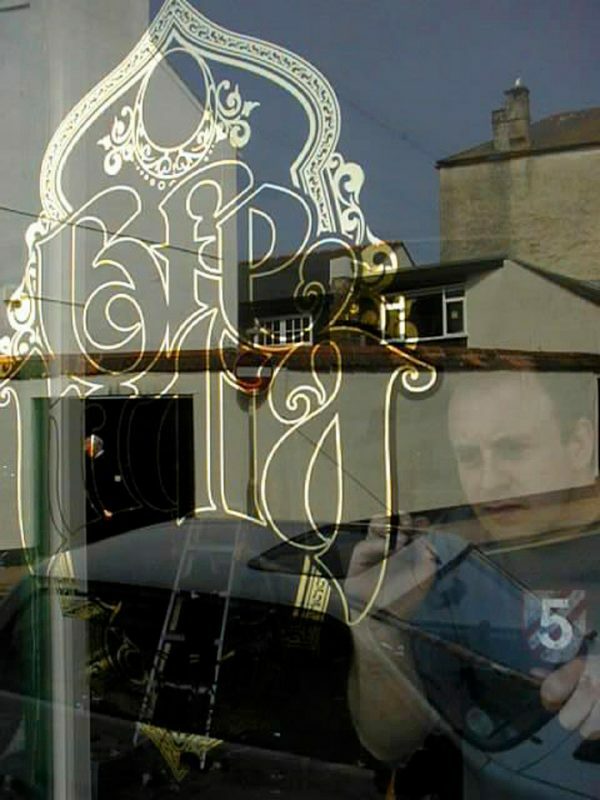 The company he works for sent him to learn advanced techniques of reverse glass work. 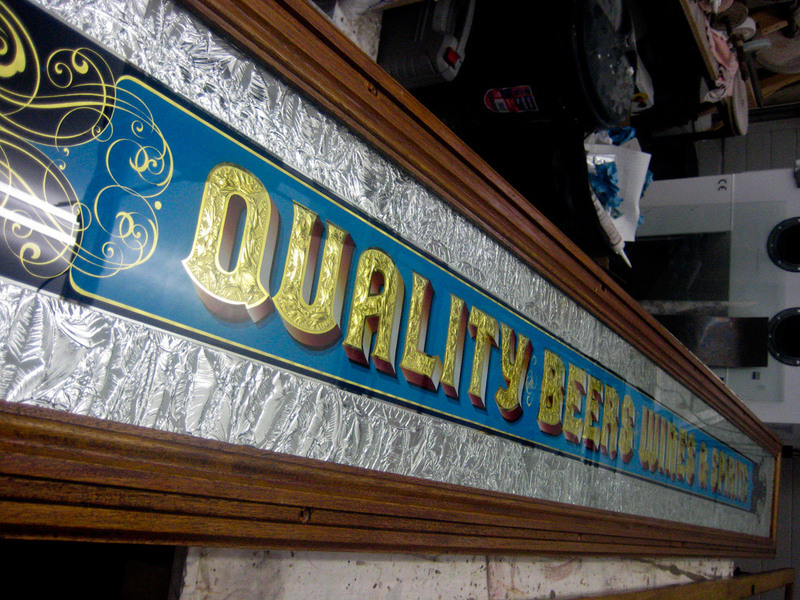 The panel took over 1 week to complete and roughly around 20 hours for me to design, we both made a panel to hang on our walls. 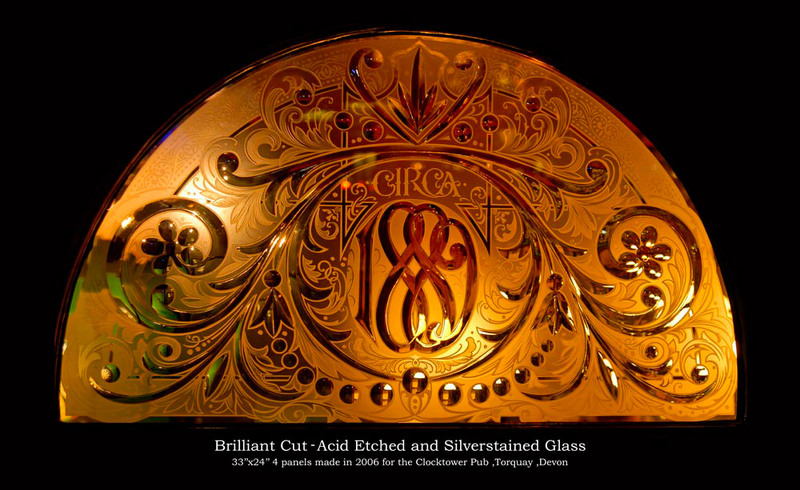 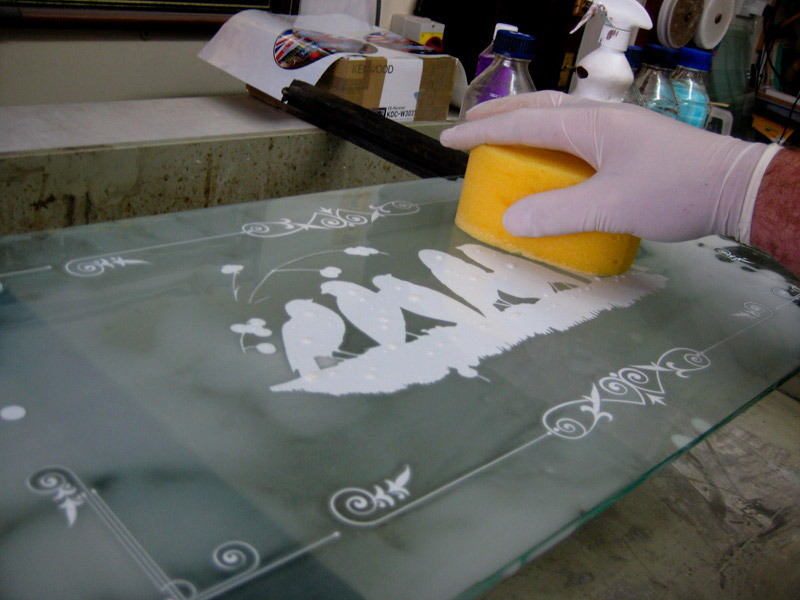 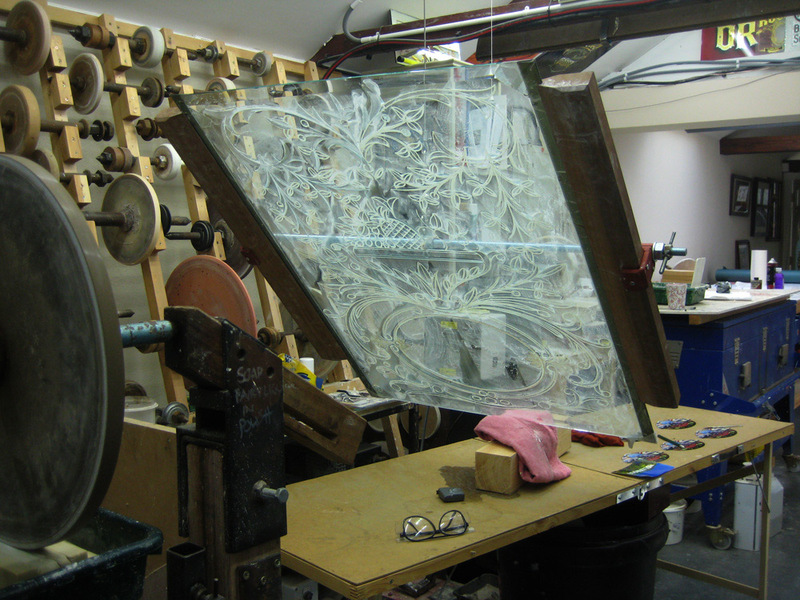 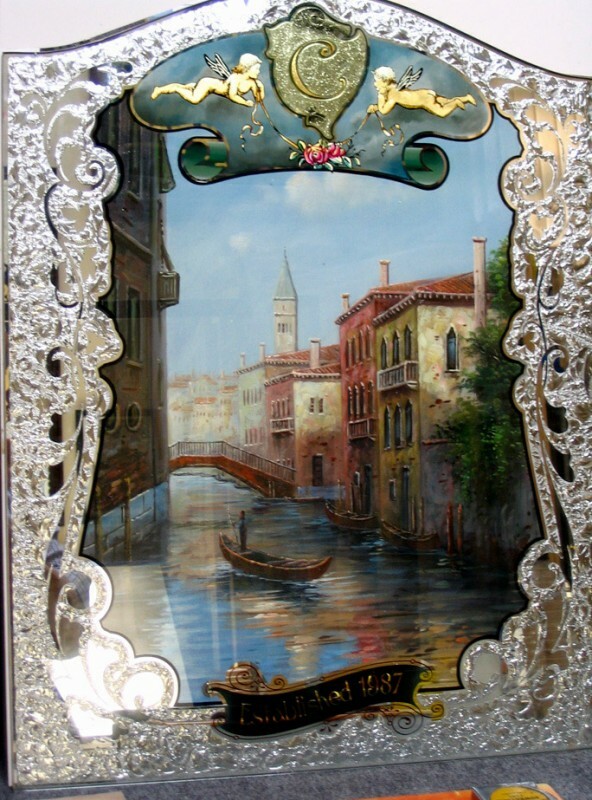 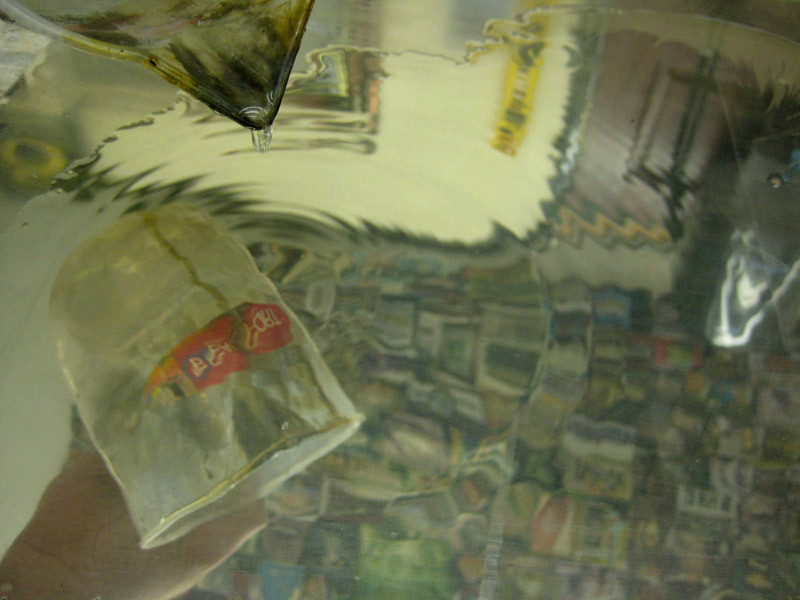 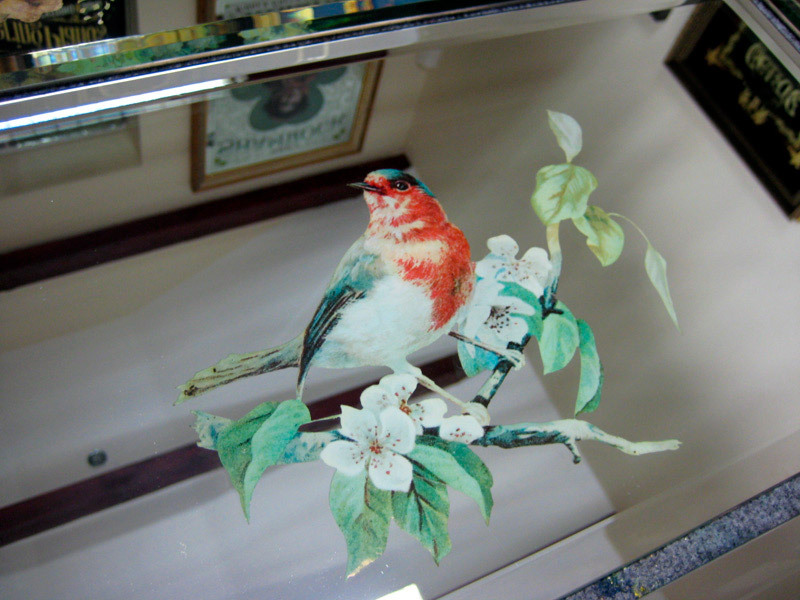 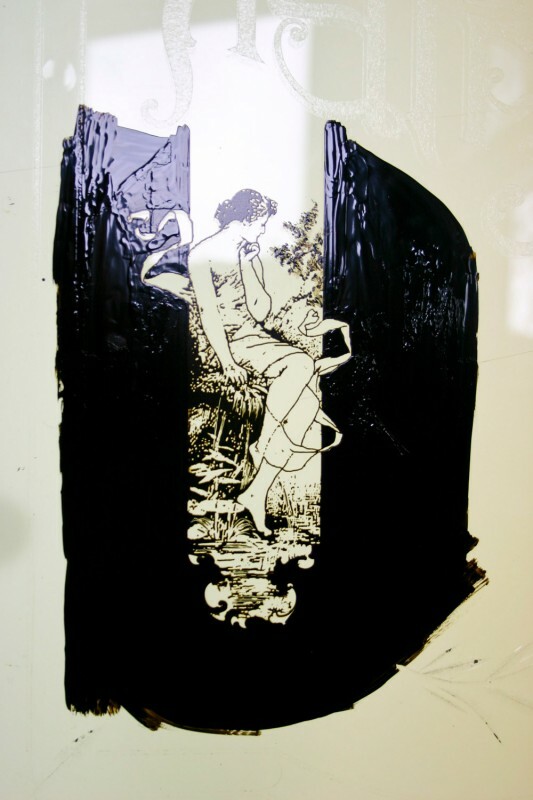 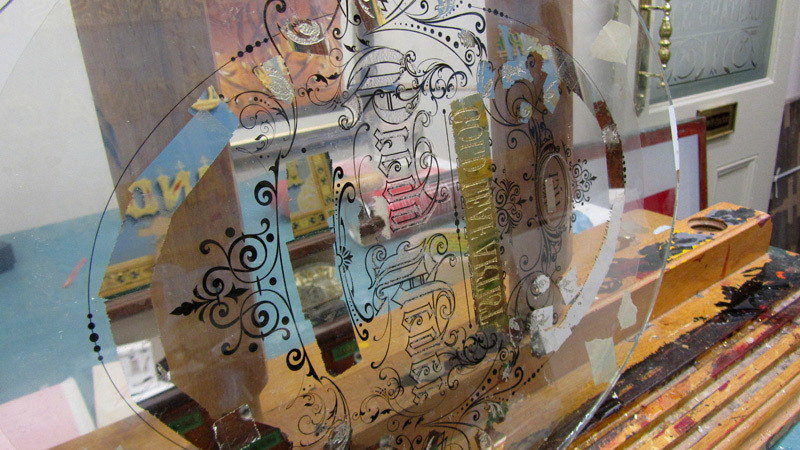 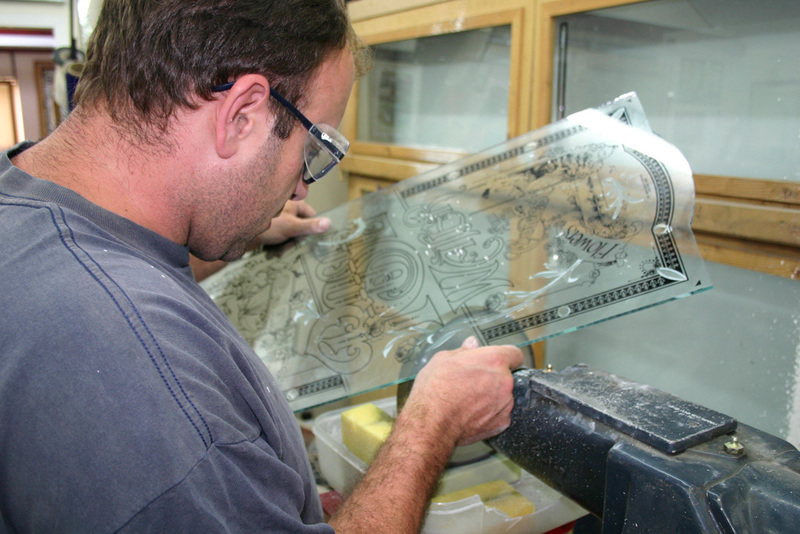 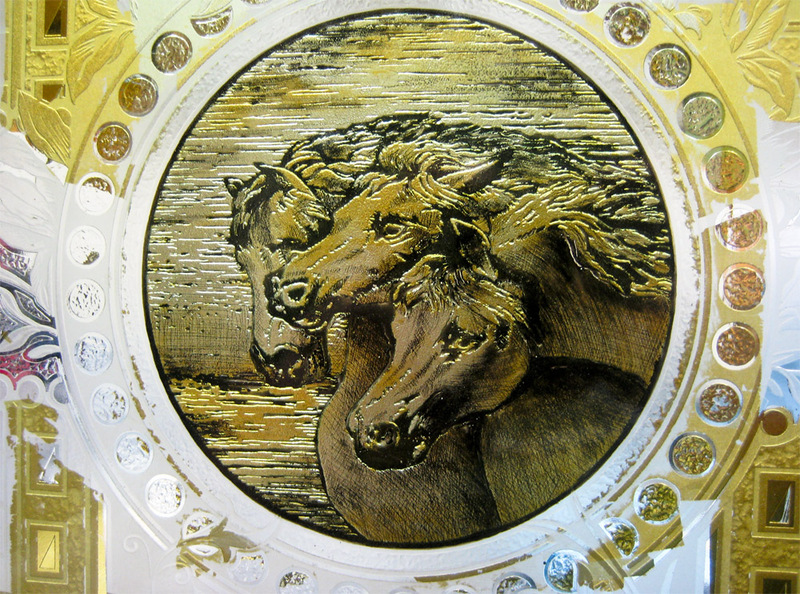 The glass is 3ft by 18's and has various techniques including acid etched pictures, gold leaf in various shades and brilliant cutting. 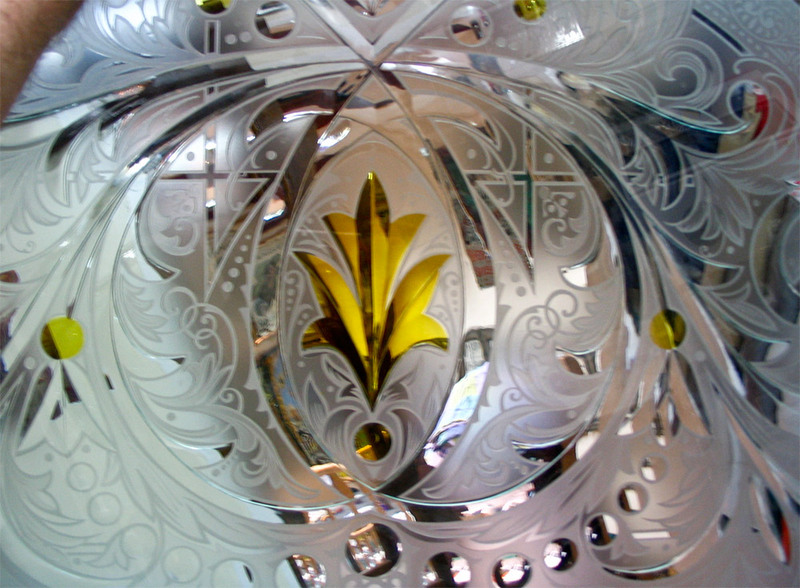 Mother of pearl and abalone shell is used around the circle design. 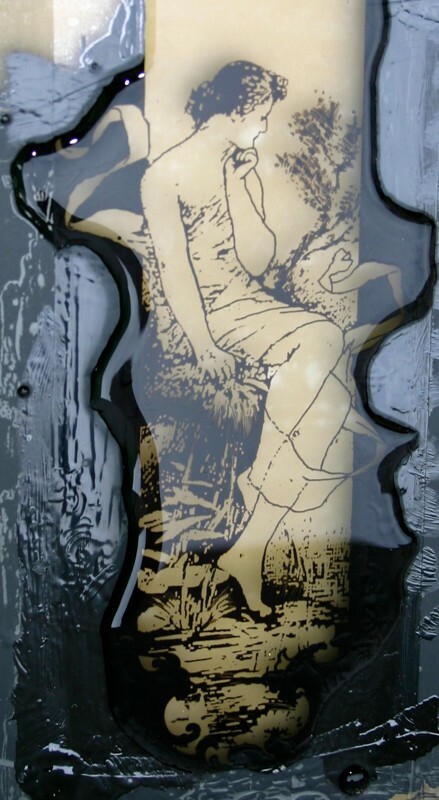 The girl pictorial is hand painted in reverse. 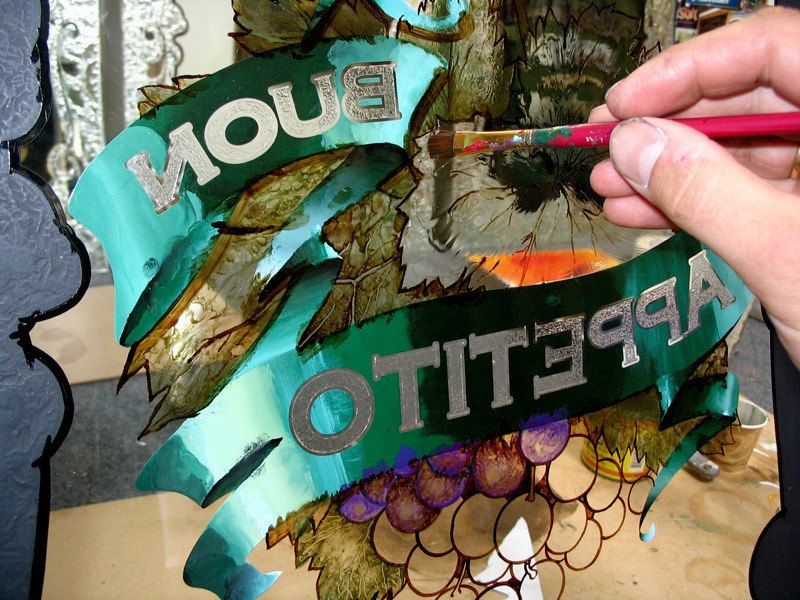 Backgrounds are finger blended along with cast shadows painted and blended around the letters by hand. 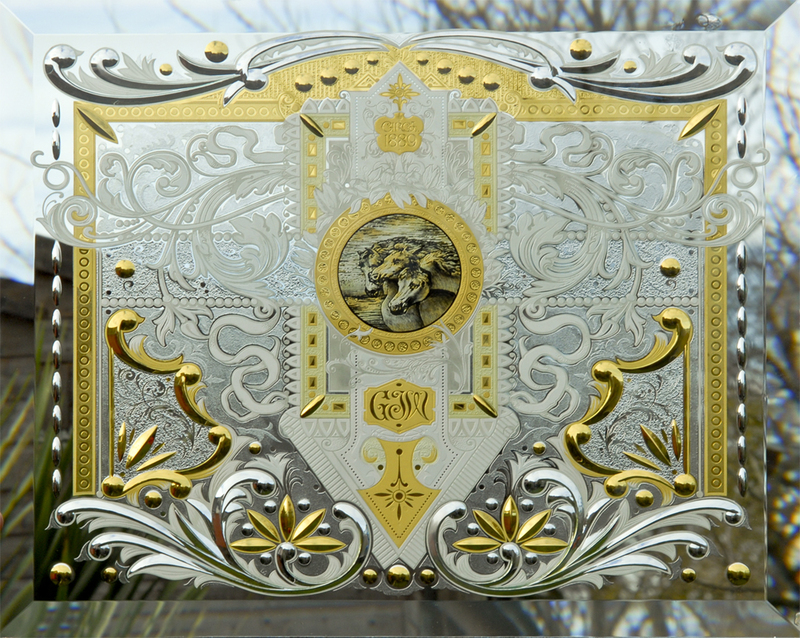 This was a fun project to make and I had good company to work with. 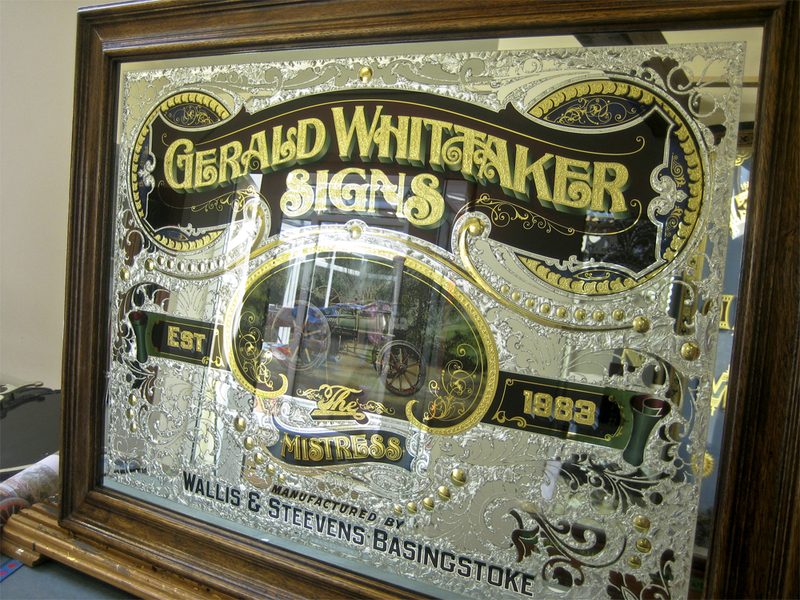 This glass sign was made as a birthday present for Gerald from his wife Sue. 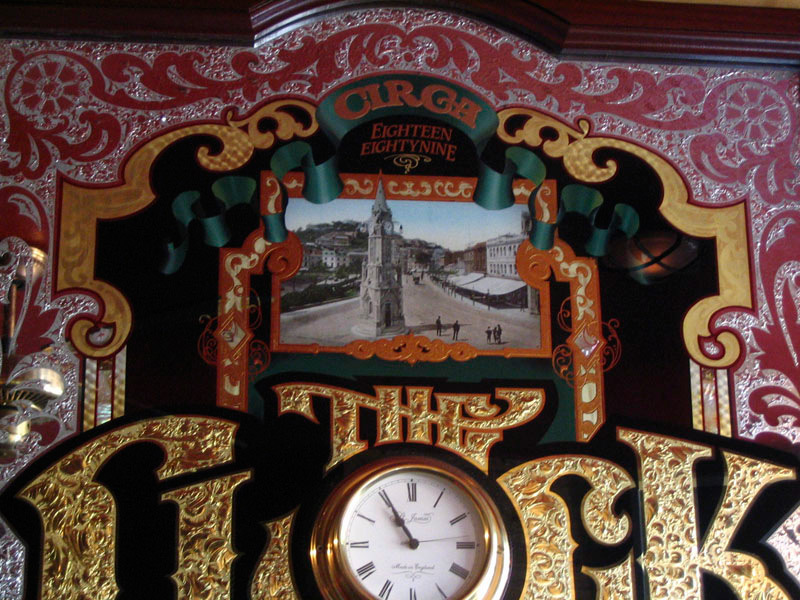 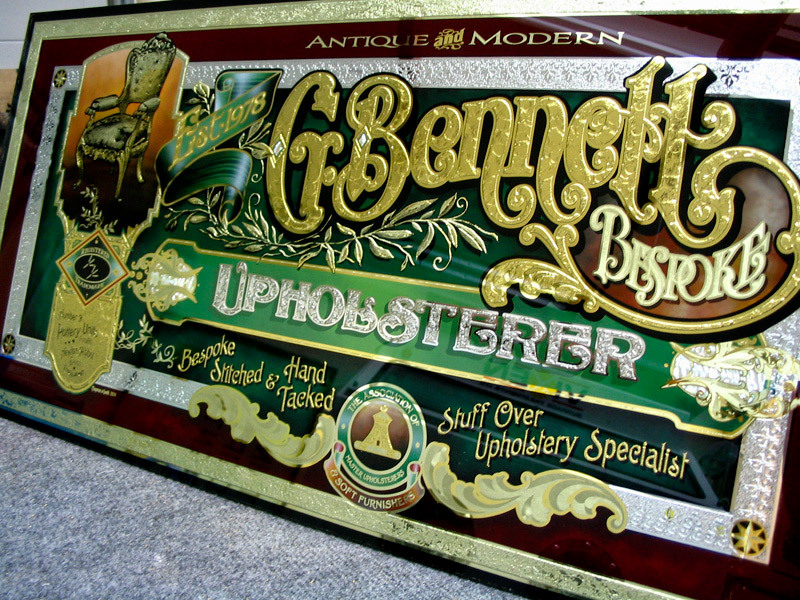 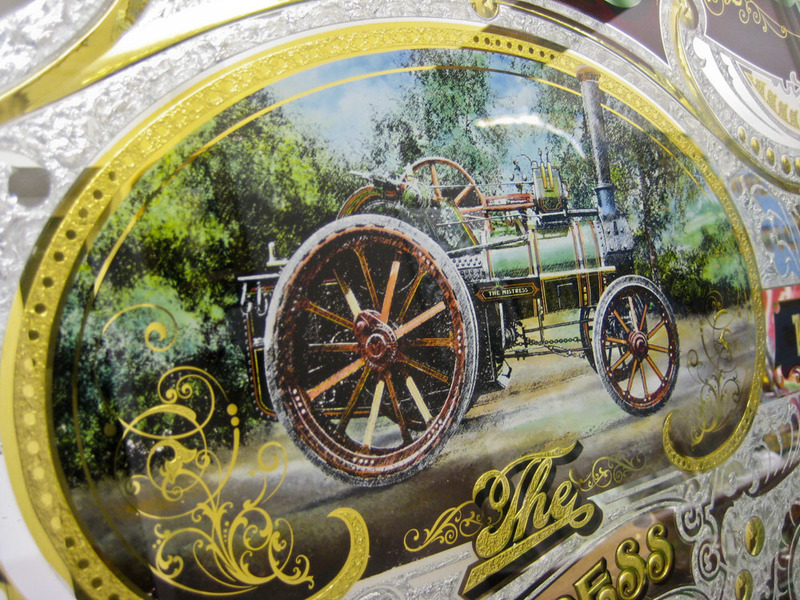 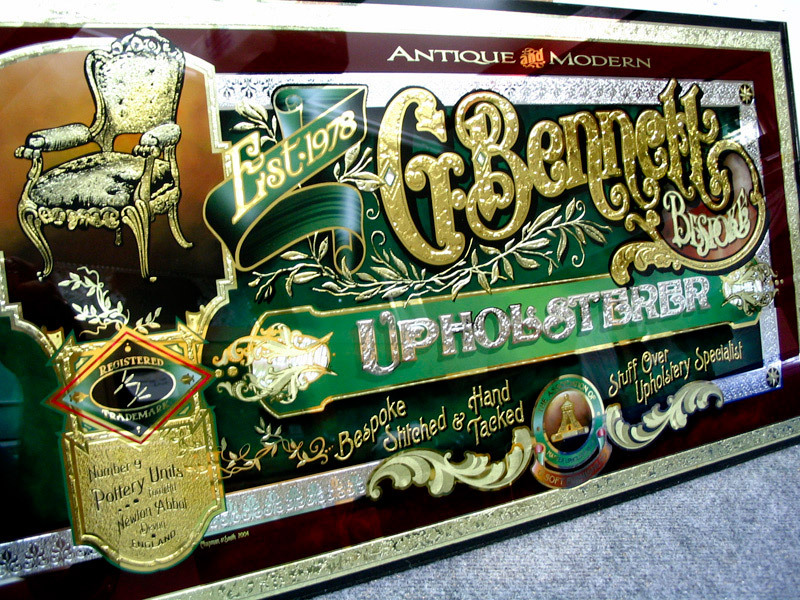 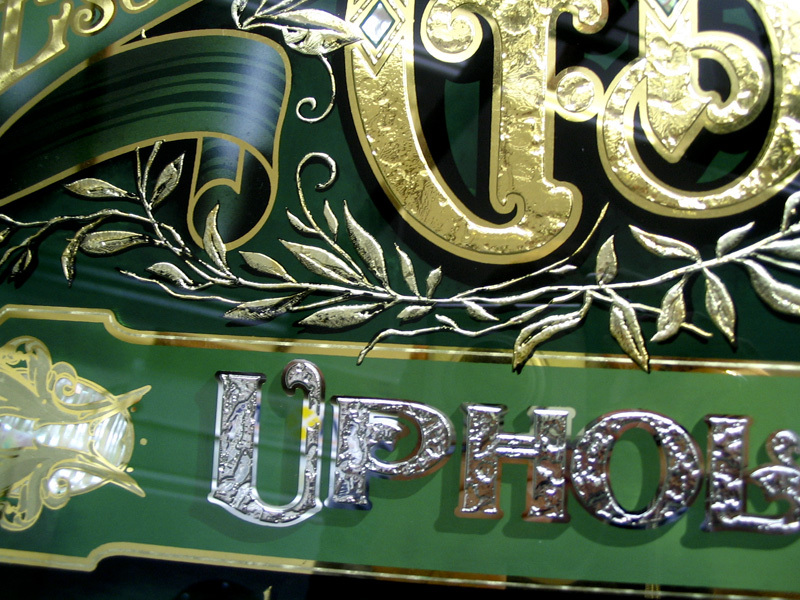 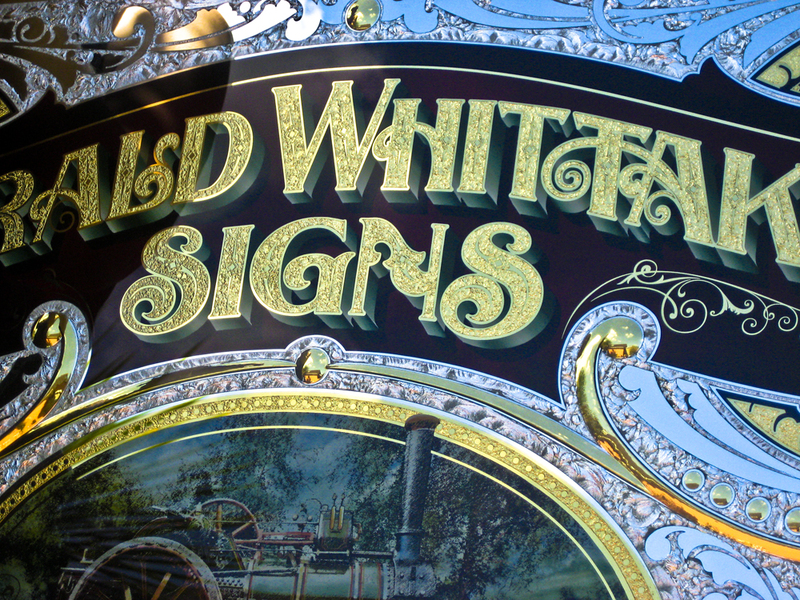 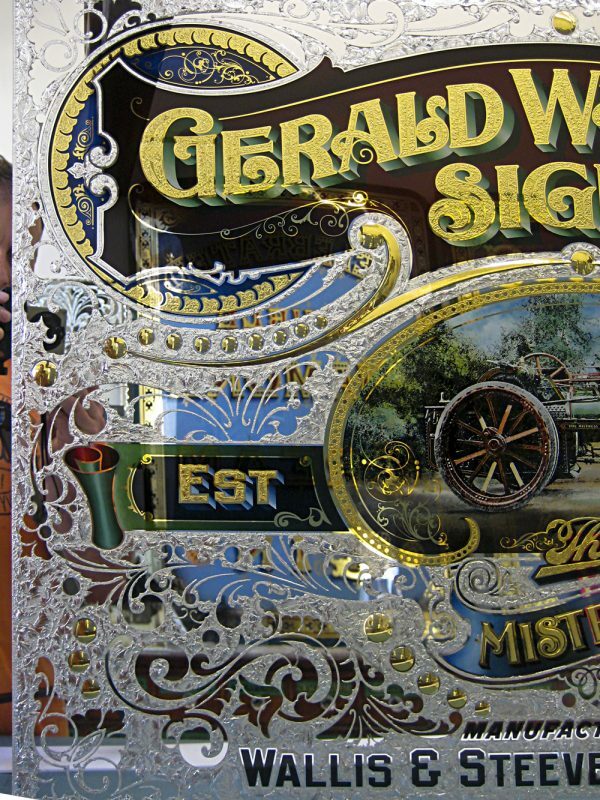 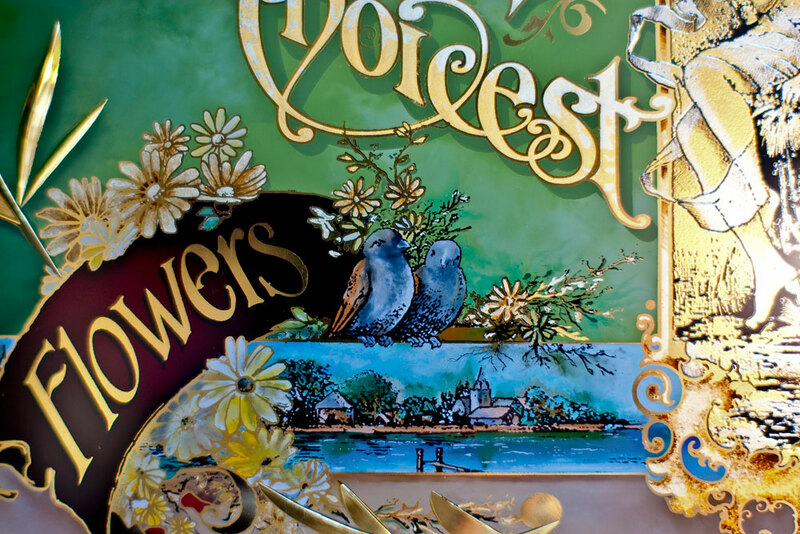 Gerald is also a traditional signwriter, but his main love and hobby is traction engines. 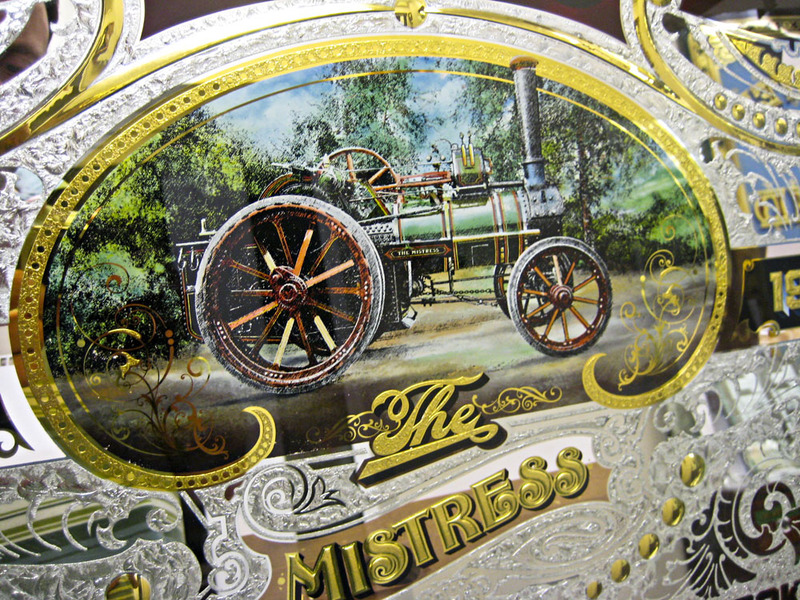 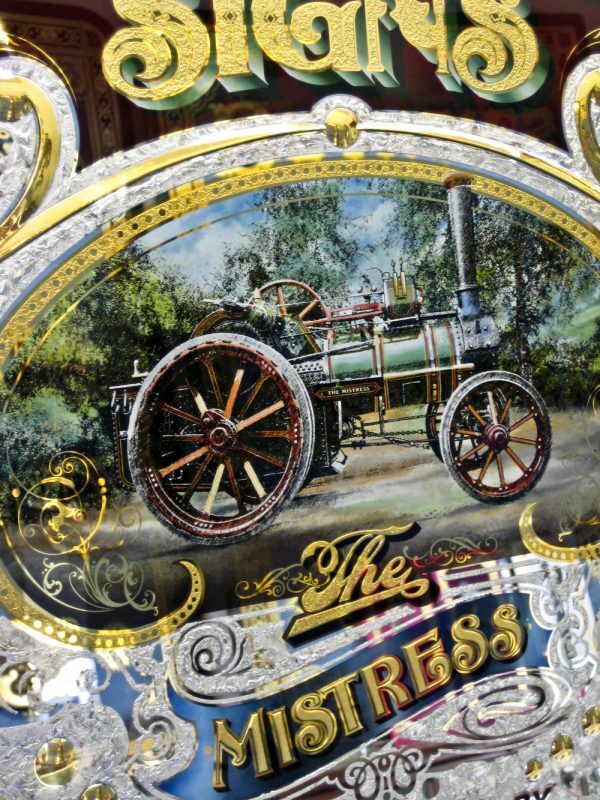 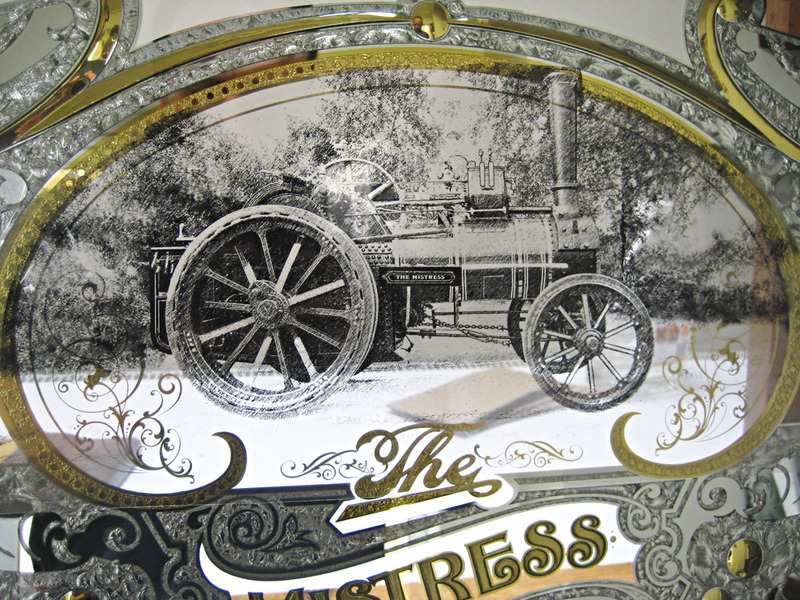 He owns and operates a beautiful original traction engine called the Mistress. 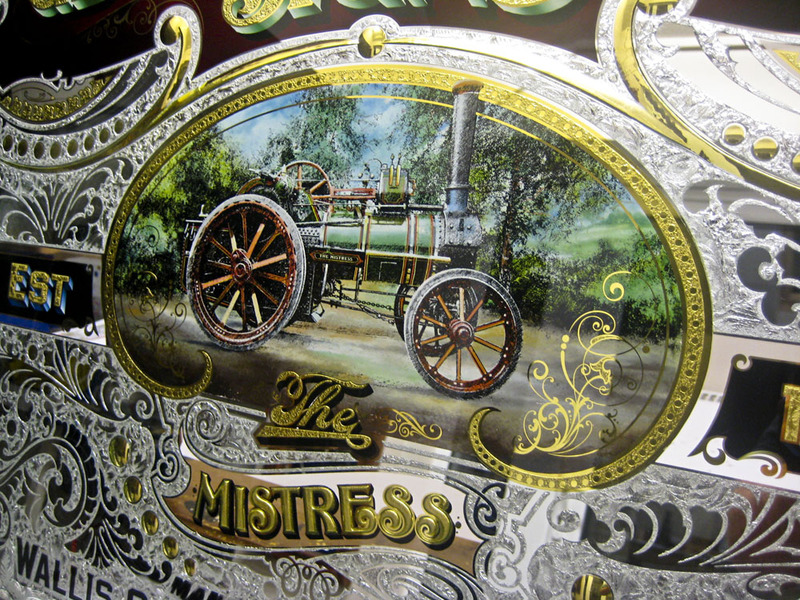 Over the years, he has fully restored the Mistress to its former glory. 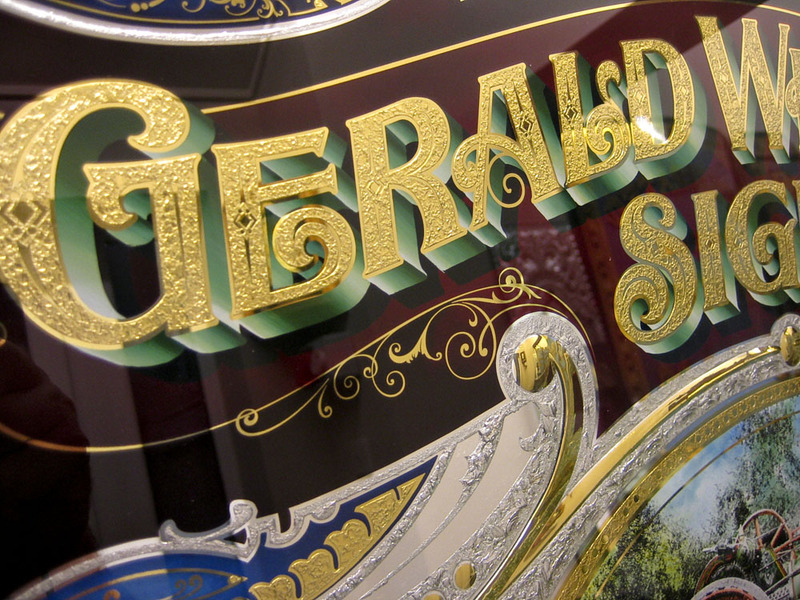 Sue Whittaker commissioned me to make Gerald this glass sign in 2008. 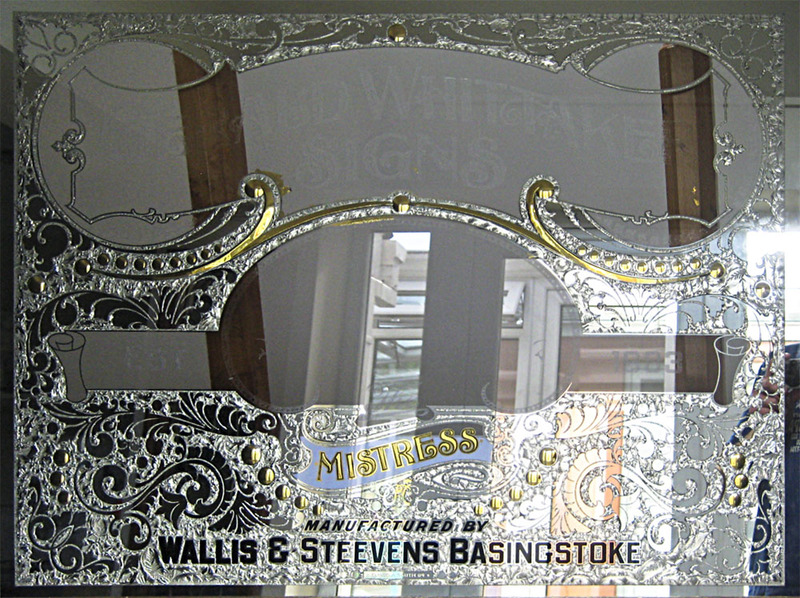 The panel is glue chipped and silvered, the centre artwork is hand-painted, the main copy is acid mica etched and the name Mistress is deep blasted and gilded. 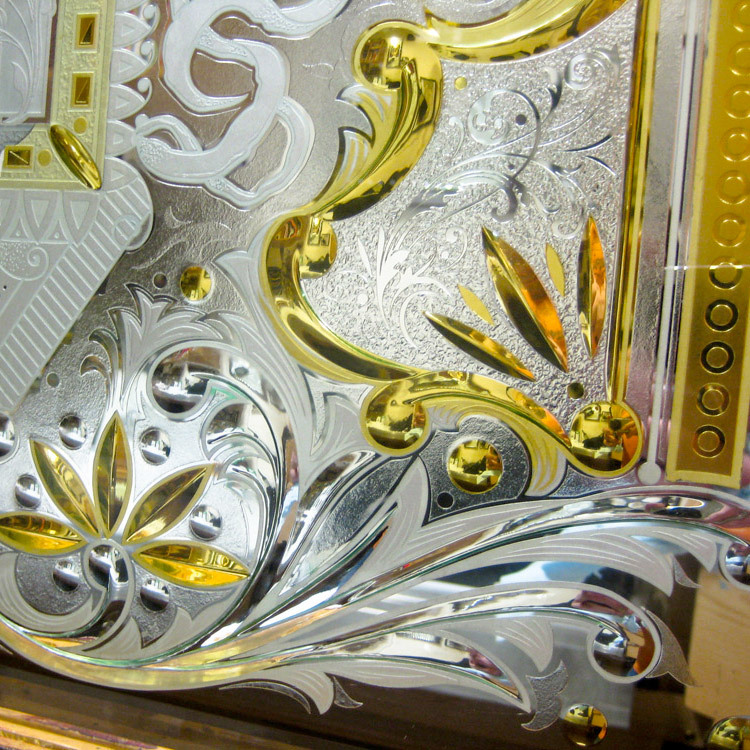 Some of the scroll work is brilliant-cut and water gilded. 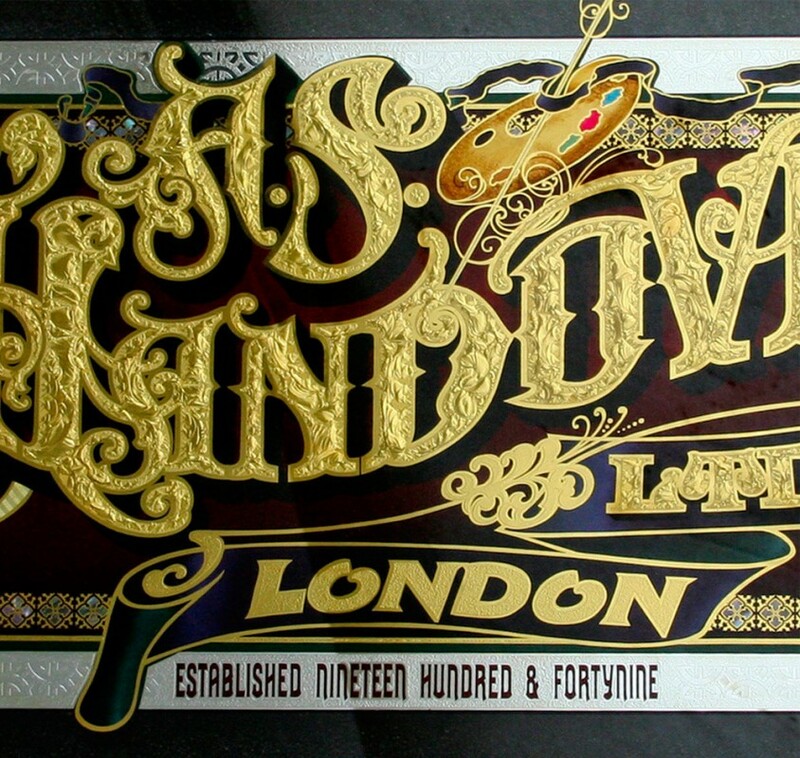 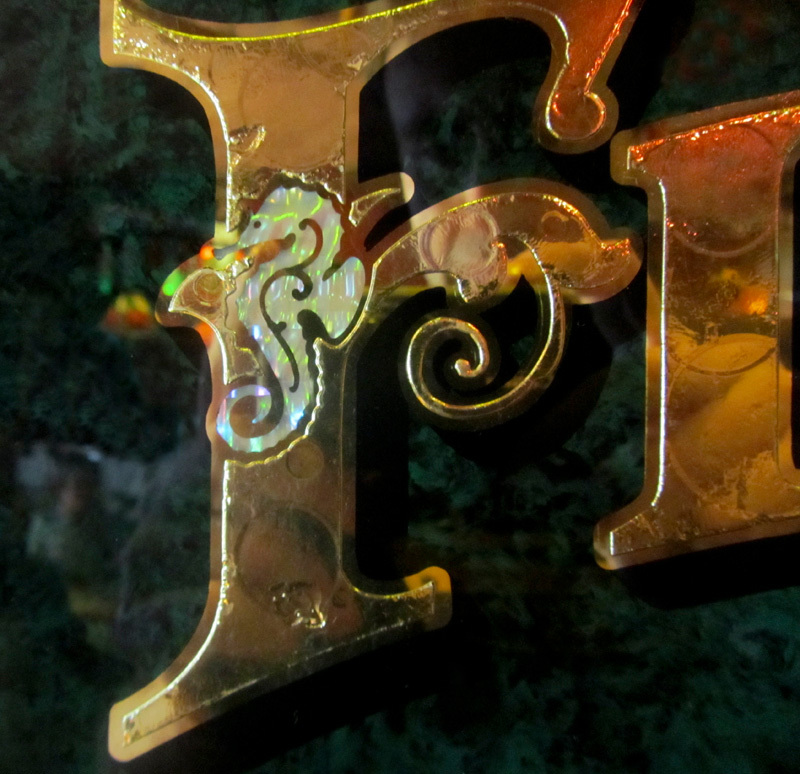 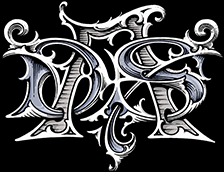 Shaded letters are hand blended with enamels and various shades of gold-leaf were used for the lettering and flourishes. 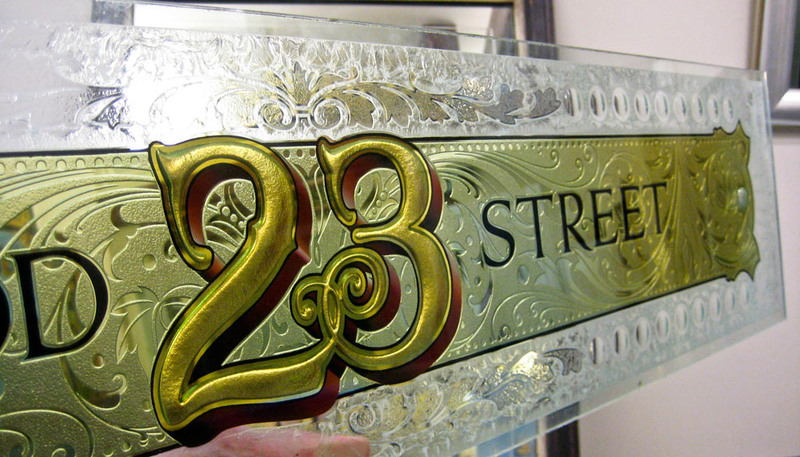 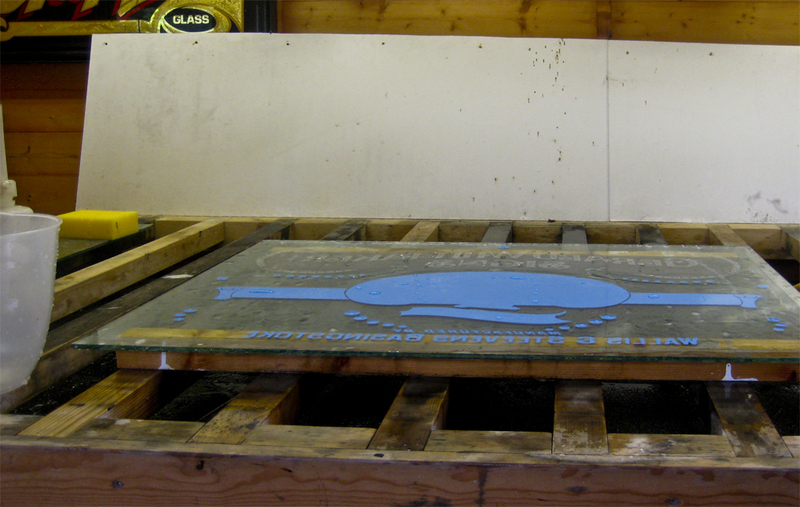 The glass sign is 39"s x 27"s and is quarter inch plate glass. 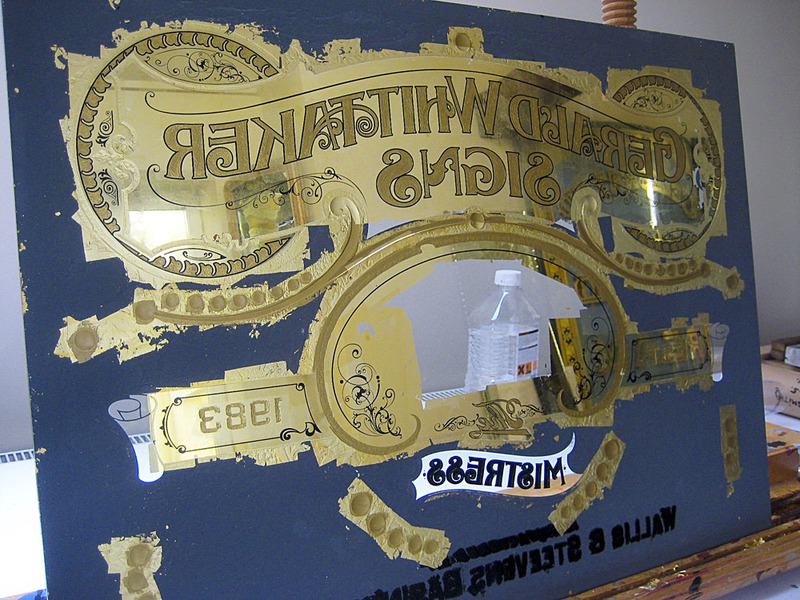 Several of the photos here take you through the making of this sign. 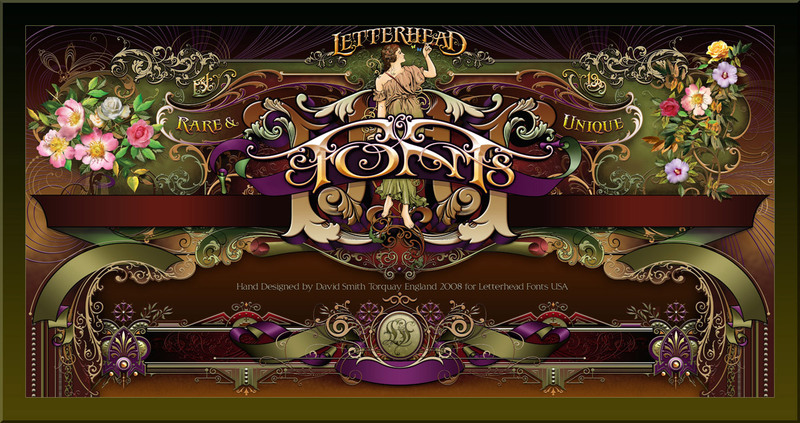 In 2008, Chuck Davis of Letterhead Fonts USA approached me to make him the front page design for his font company. 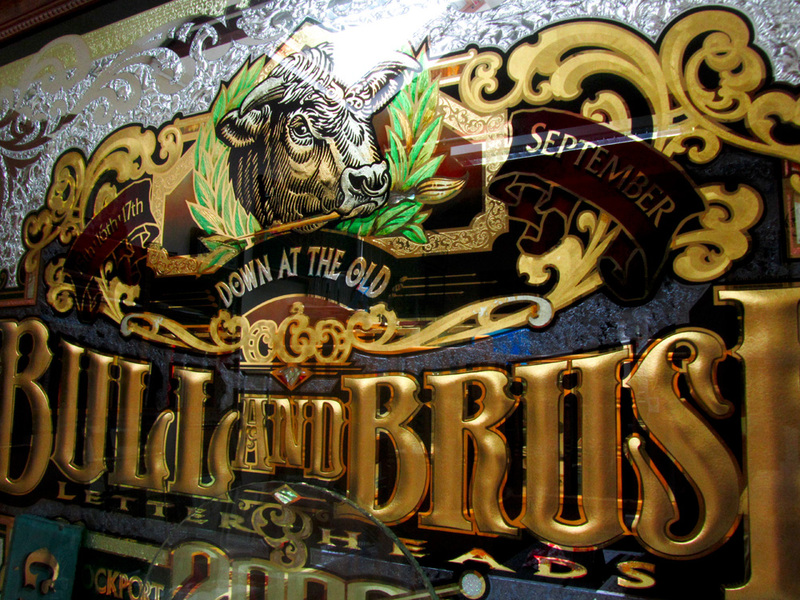 Chuck has brought together sign and design artists from around the world to create the best font styles on the market today. 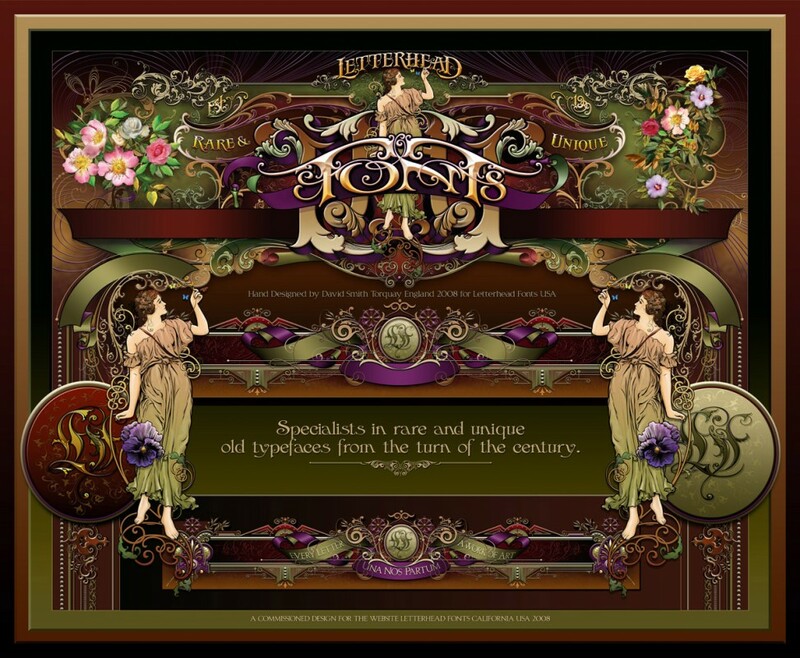 The design for the page that I developed tries to do justice to the artistry and design skills of the many talented contributors to the site. 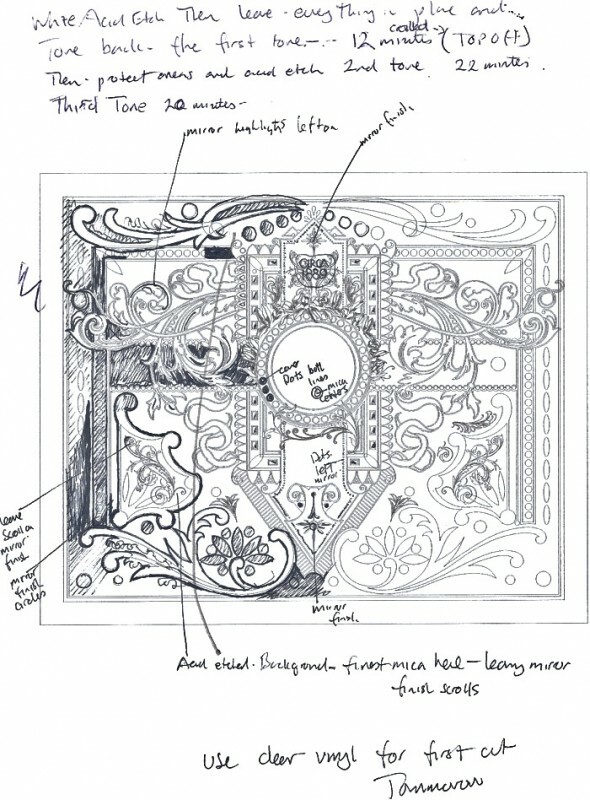 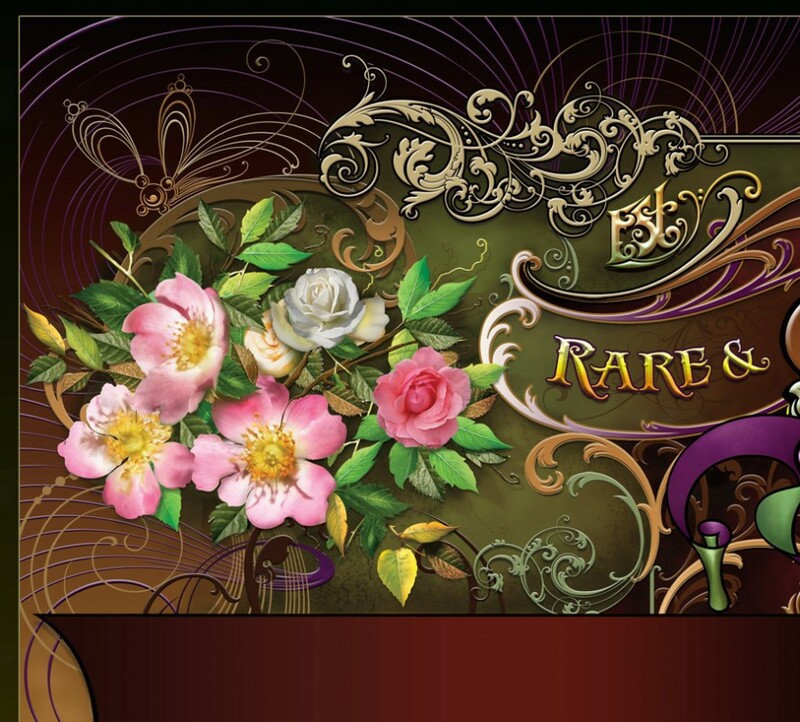 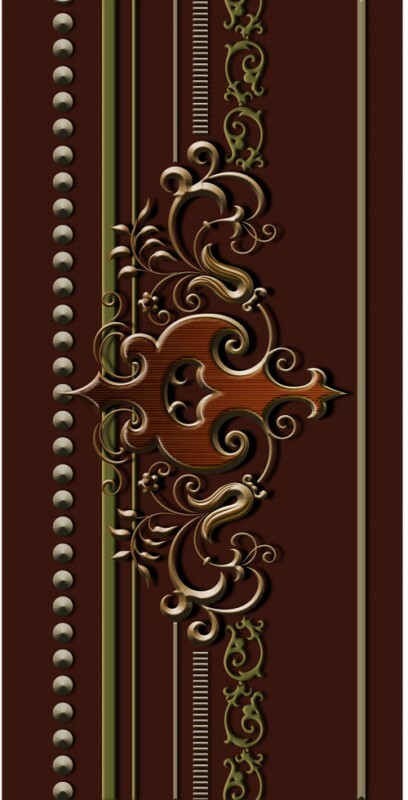 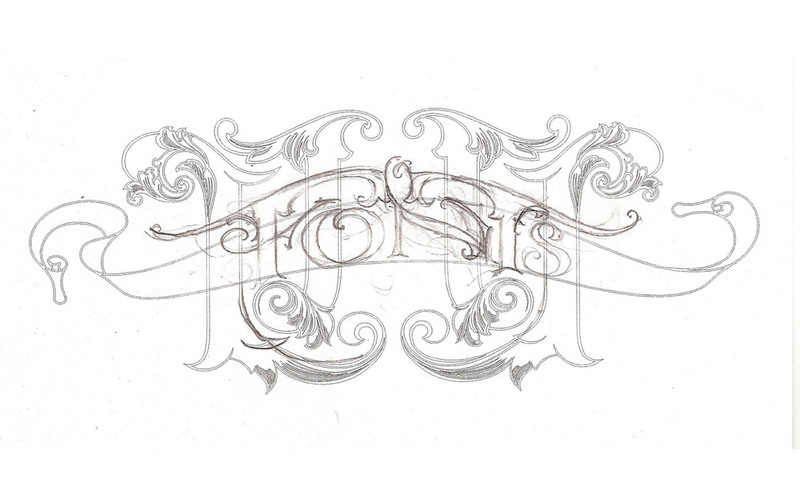 For this reason, it made sense to embellish the whole design with an intracacy of scrolls, borders and rich colours.